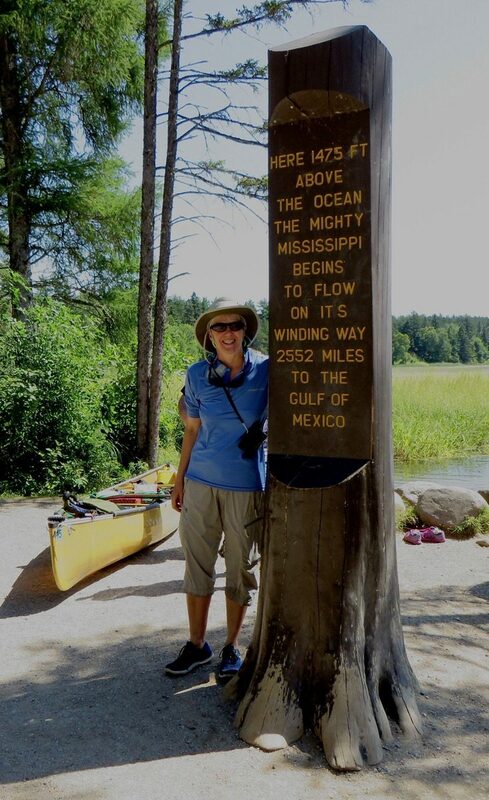 What: down the Mississippi River by Canoe, from Lake Itasca, Minnesota to the Gulf of Mexico. Where: Central United States; MN, WI, IA, IL, MO, KY, TN, AR, MS, LA. When: August 12 – October 8, 2014 (58 days). Highlights: novel and thrilling adventure in parts of the country where we had spent little or no time; enthusiastic reception and hospitality from locals; surprisingly wild and beautiful. 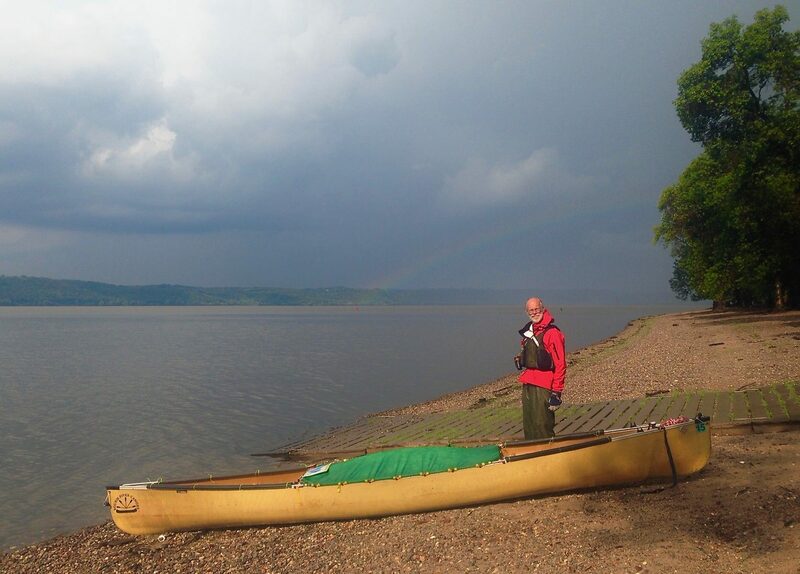 We are hikers, not canoeists, so our decision to paddle the Mississippi River (MR) caught us by surprise. 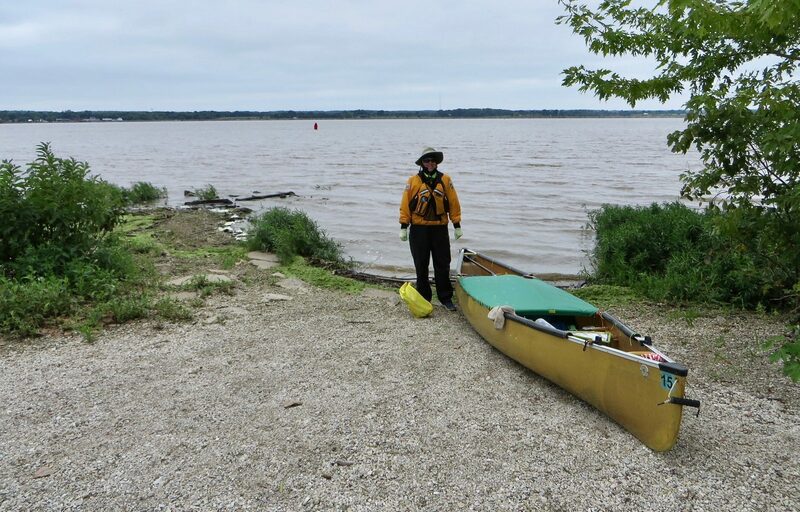 James read German Tourist’s trip report about doing the trip, showed it to Amy and said “Christine paddled the Mississippi, and she says it’s a trip that a well prepared, fit, novice paddler can complete. Let’s do it.” Amy read the report and agreed. The decision-making process took about five minutes. As Americans, the MR is our river. 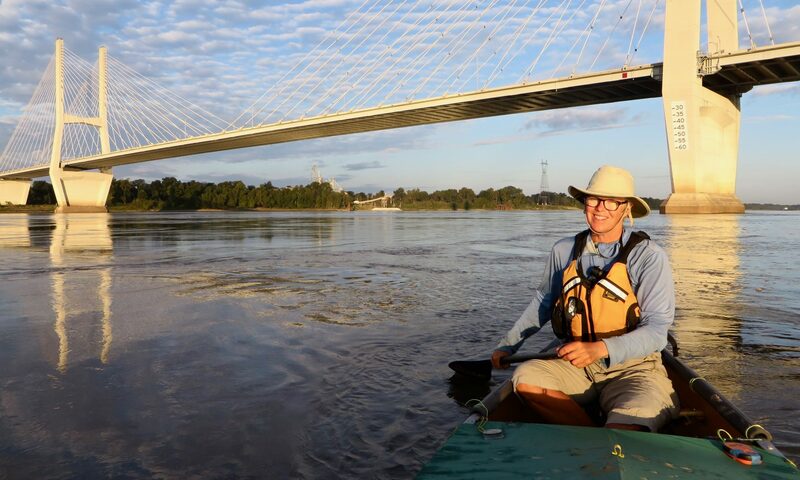 It is one of the world’s grandest rivers, and it’s possible to paddle the entire length without serious risk and with very few hassles. Mark Twain put it on the map as an American literary landmark. It passes through diverse physical and cultural landscapes. 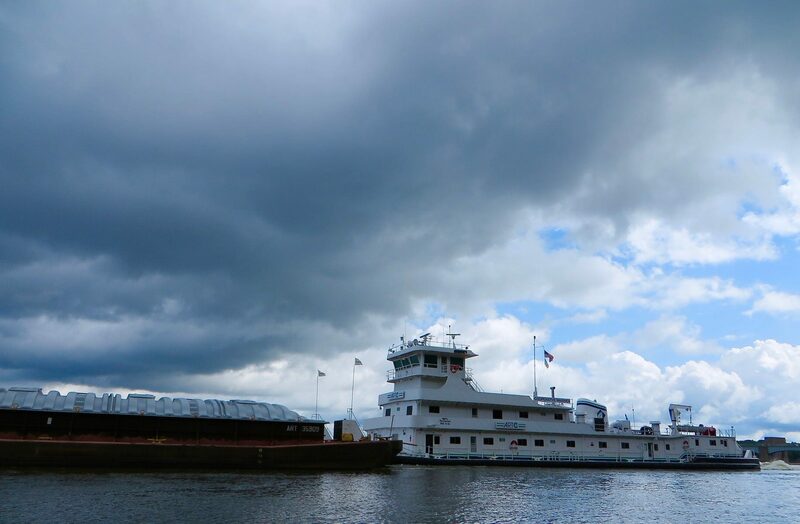 The economic impact of its barge traffic is enormous. The river is a magnificent juxtaposition of intense commerce and intense isolation. The trip is easily achievable in a single season, even at a leisurely pace. We both learned to canoe as children. 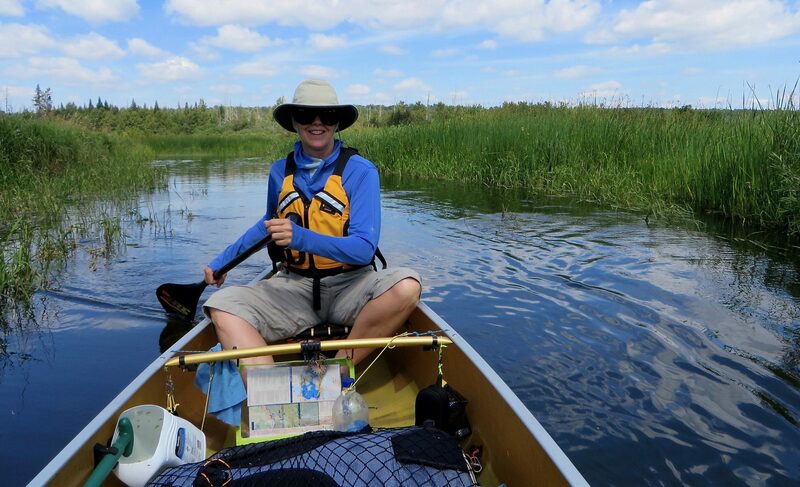 Amy spent a week paddling in the Quetico wilderness thirty-odd years ago, but that was the extent of our overnight canoeing experience. 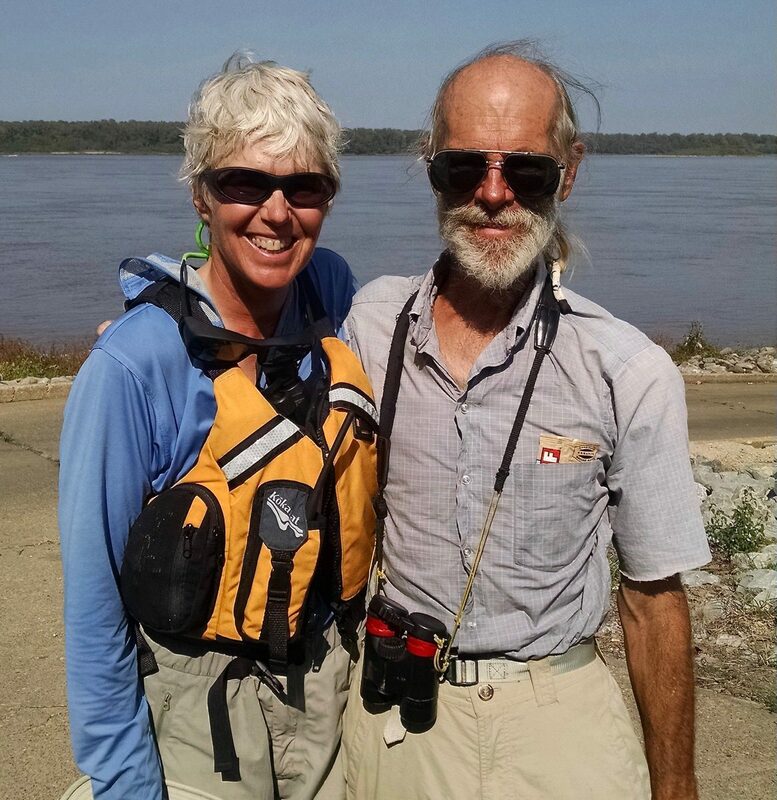 We had never canoed together and paddling a big river was an entirely novel undertaking. 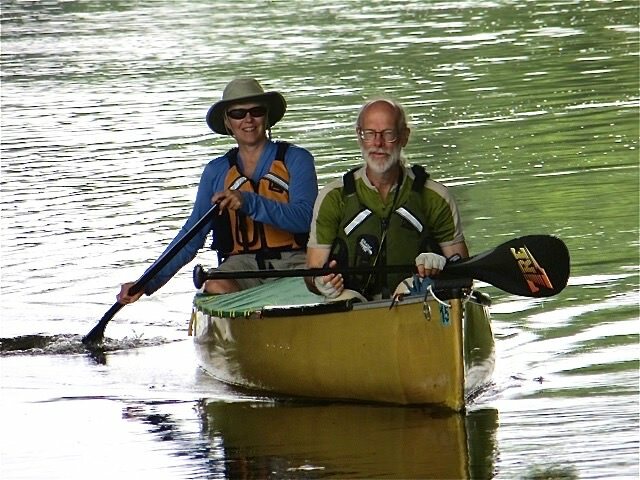 In 2013, over 650 people summited Mount Everest, over 700 thru-hiked the Appalachian Trail, and perhaps 50 paddled the MR from its source to the Gulf of Mexico. 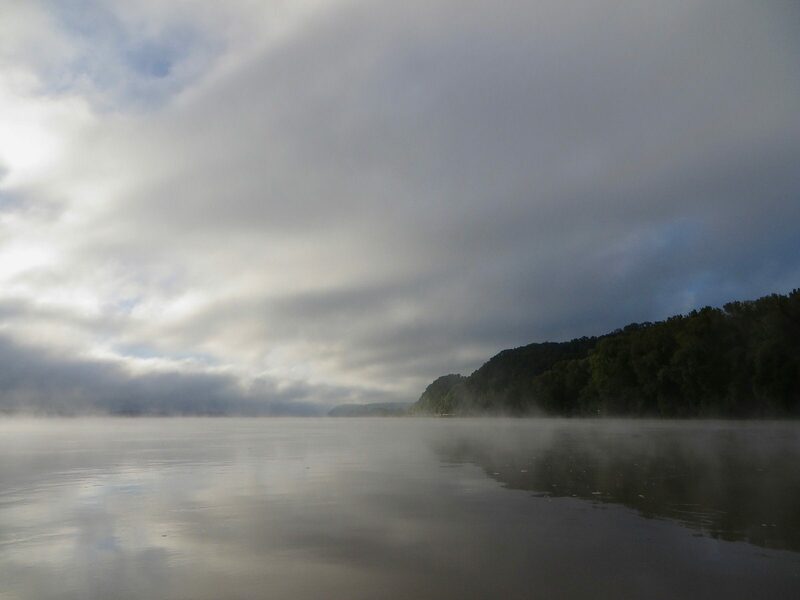 Many millions of people live within 100 miles of the river, yet because so few people paddle the entire river, the trip still has the feeling of a grand adventure. 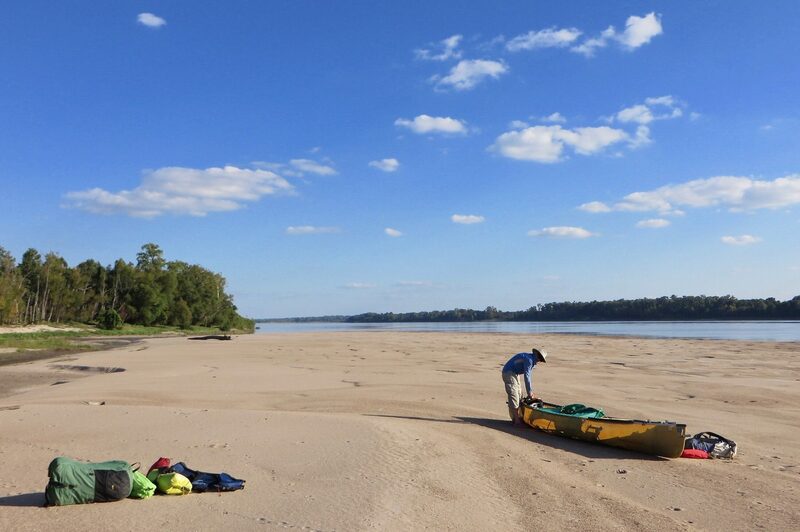 Paddling the river is a significant undertaking, yet compared to other grand adventures, the trip, while intimidating, is not complicated. 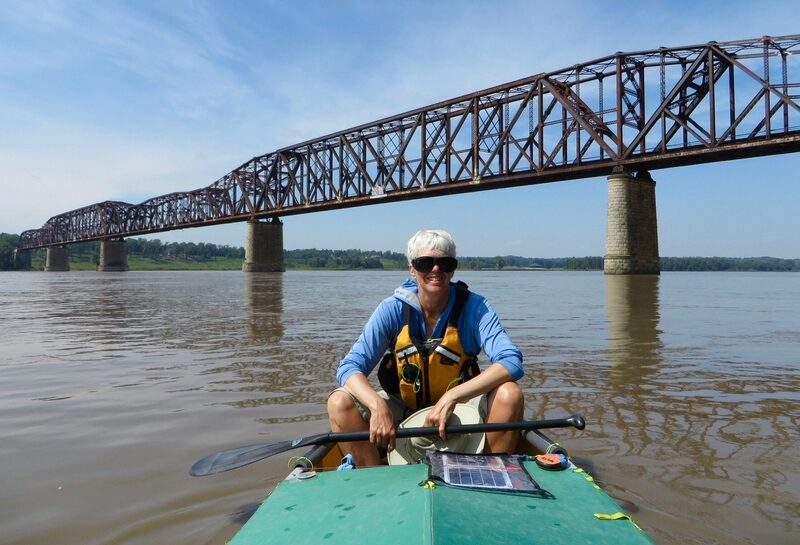 RiverGator.org is a mile-by-mile paddler’s guide covering Saint Louis to the Gulf. Rivergator has borrowed some portions of this report. 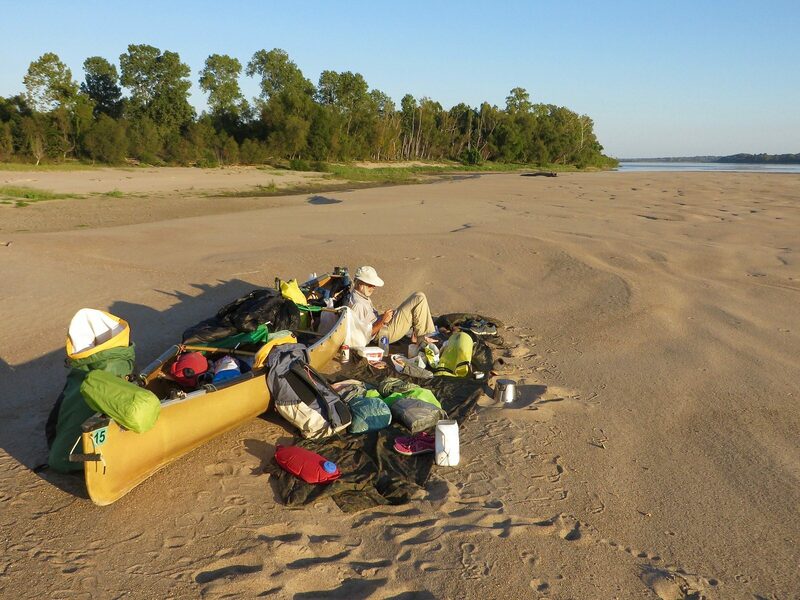 The Facebook groups Mississippi River Paddlers and Lower Mississippi River Paddlers are the best resources for planning and executing a trip like ours. 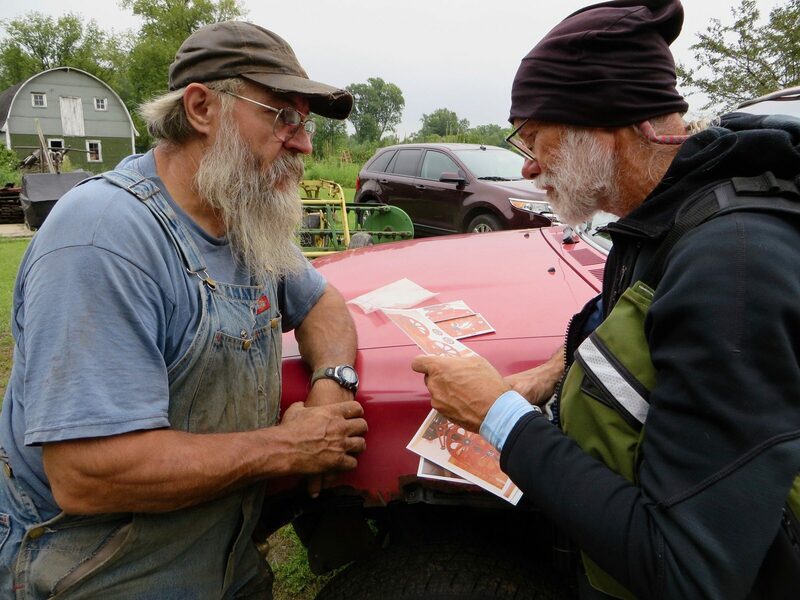 These current and former source-to-sea paddlers and people who live along the river collectively know infinitely more than we do and they are very generous with their time and advice. Maps, Navigation, and Water Level Information is covered in its own section below. Rising Tide: The Great Mississippi Flood of 1927 and How It Changed America, by John Barry. 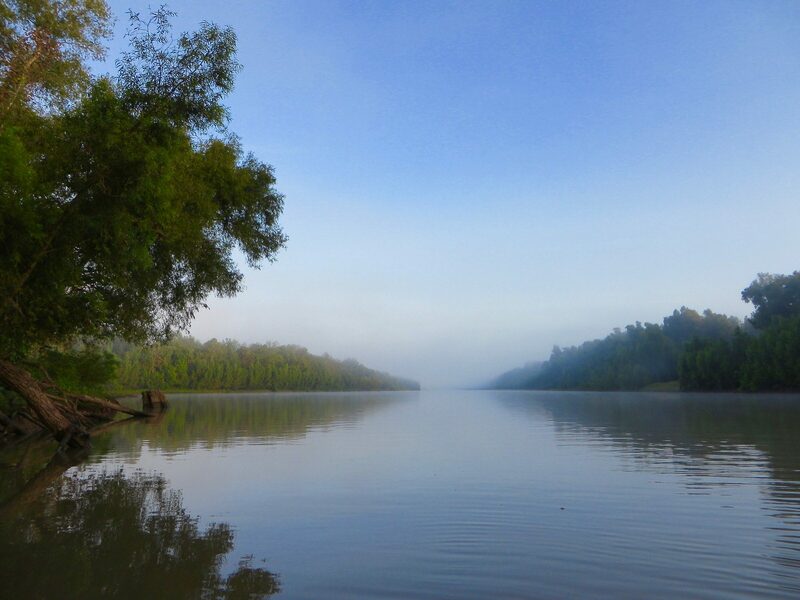 Mississippi Solo: A River Quest, by Eddy Harris. The Control of Nature, and by John McPhee. 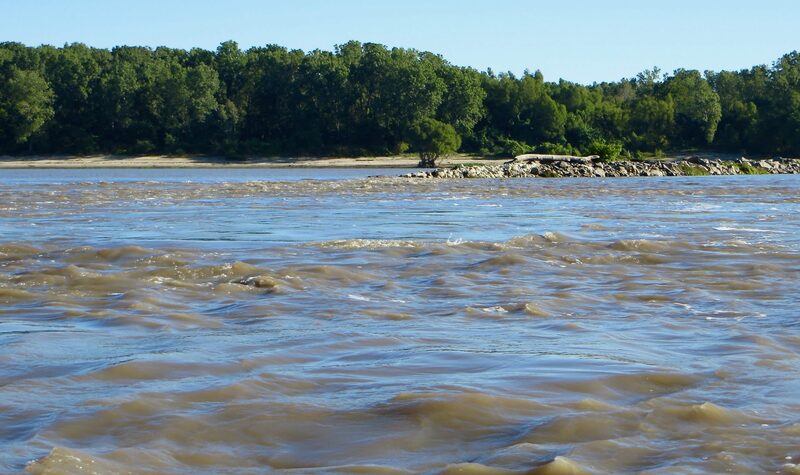 Wicked River: The Mississippi When It Last Ran Wild, by Lee Sandlin. Adventures of Huckleberry Finn, by Mark Twain. 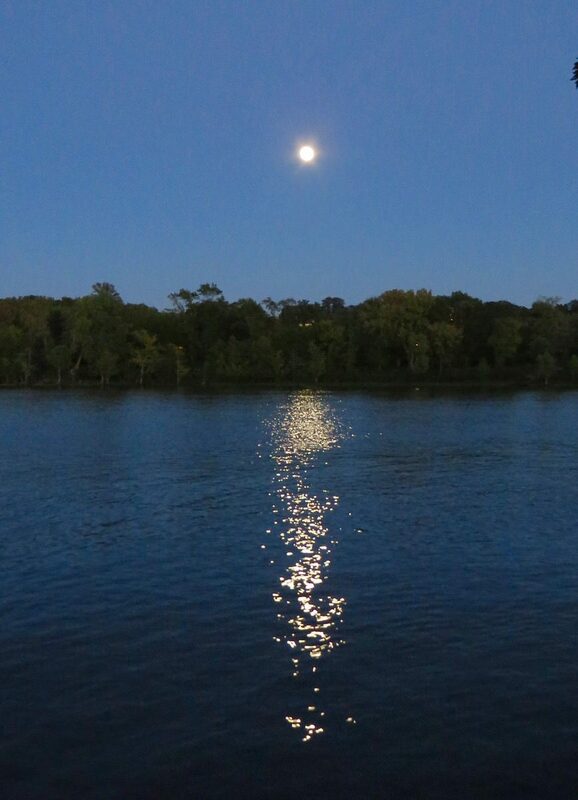 Life on the Mississippi, by Mark Twain. 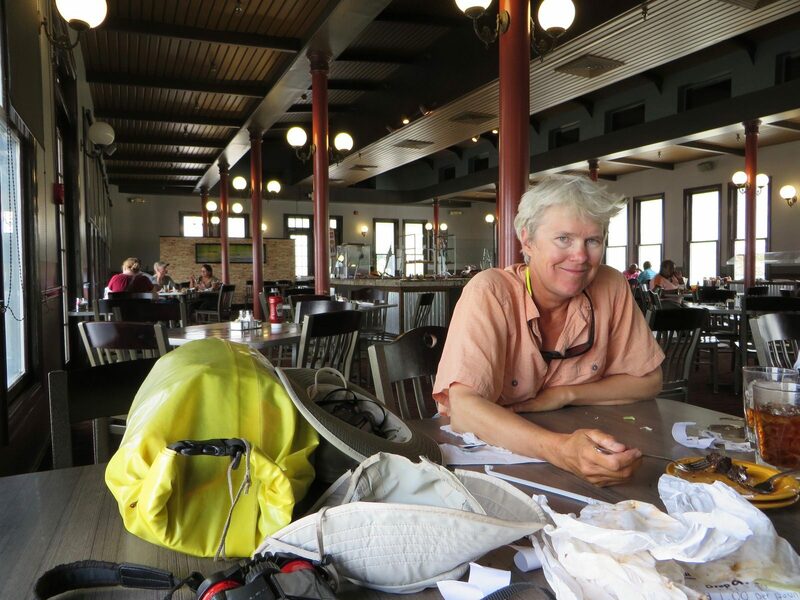 As for all our trips, we used our two favorite mapping tools: CalTopo.com to prepare gpx data and printed maps, and Gaia GPS while paddling. We drove a one-way rental car from California to Bemidji, MN. 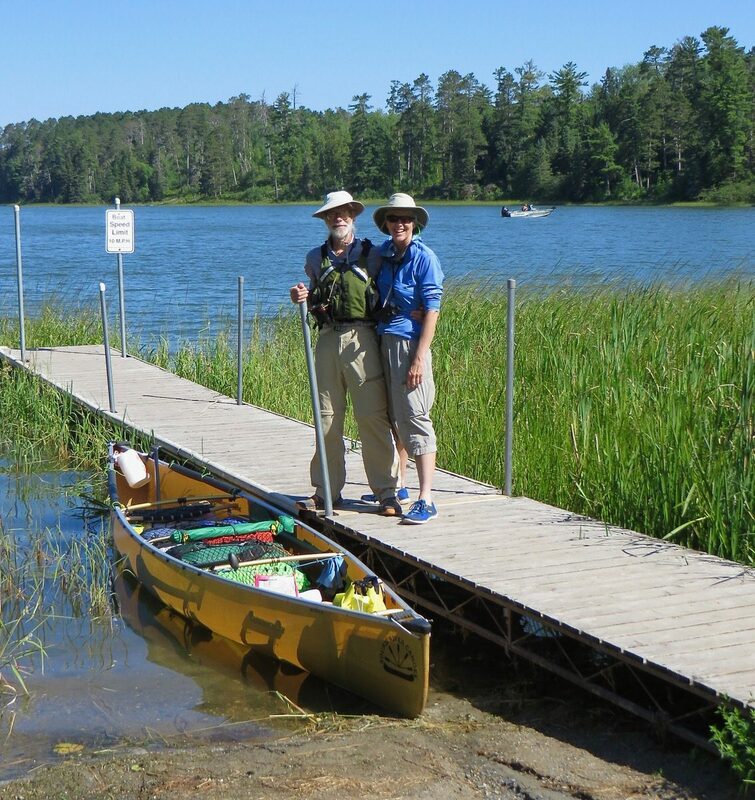 We dropped our canoe and gear at Lake Itasca, Jim returned the car and hitched back to Itasca. 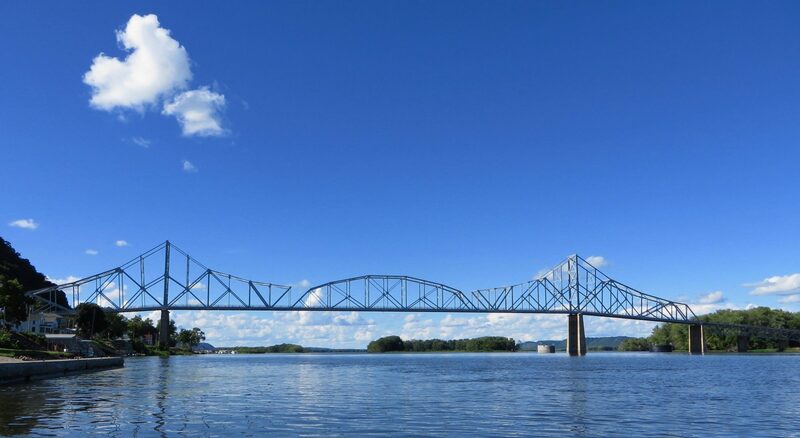 Lansing Iowa; home of the ugliest bridge on the river. We stopped in this town and bough groceries. 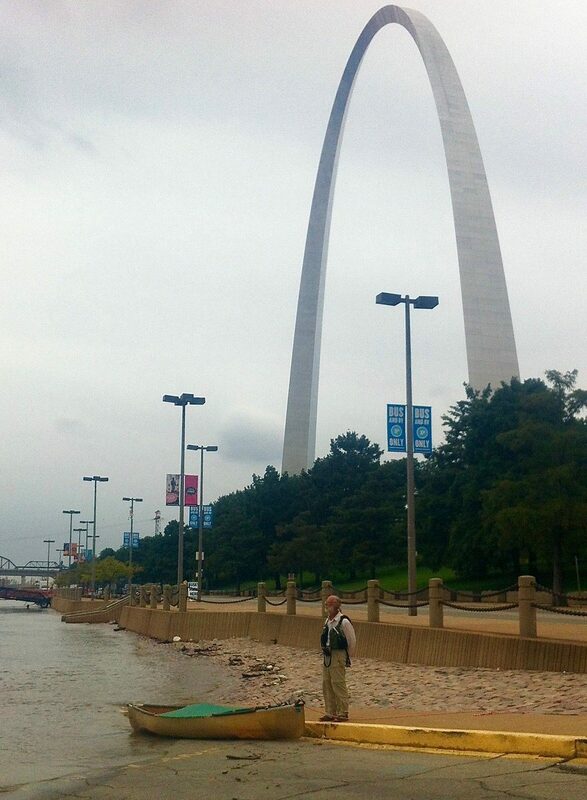 We pulled out of the river at a landing near the arch. 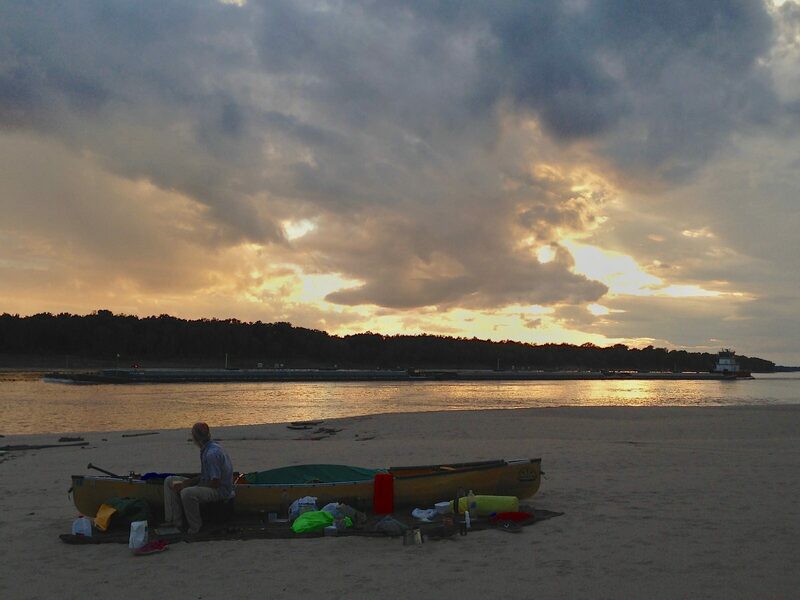 Here some friends of friends met us, put our canoe on a trailer and drove to their home: shower, a nice diner, companionship and a soft bed. This trip is on my Top Ten List. I love the rhythm of moving forward along a path, day after day. It is the same satisfaction I get from a long-distance walking or biking trip. Much of the day is very routine – sleep, eat, pack, move forward, stop a few times to eat, find a campsite, setup camp, eat, sleep. Repeat over and over again. Superimposed on top of that very stable routine are the unexpected highlights and memorable events. On this trip, my most satisfying highlights were the people we met along the way. Fun, outgoing, gracious, generous, cheerful, encouraging people at every place we stopped. Many times we went for two or three days without seeing anybody, and then we’d stop somewhere and inevitably be greeted by the nicest people we could hope to meet. And then there were many isolated unpredictable highlights that mean so much. Weeks of being surrounded all day by hundreds of migrating swallows feeding near the surface of the water. A single full albino Barn Swallow, looking magical as it swooped around our canoe. The ethereal calls of loons in the northern reaches of the river. 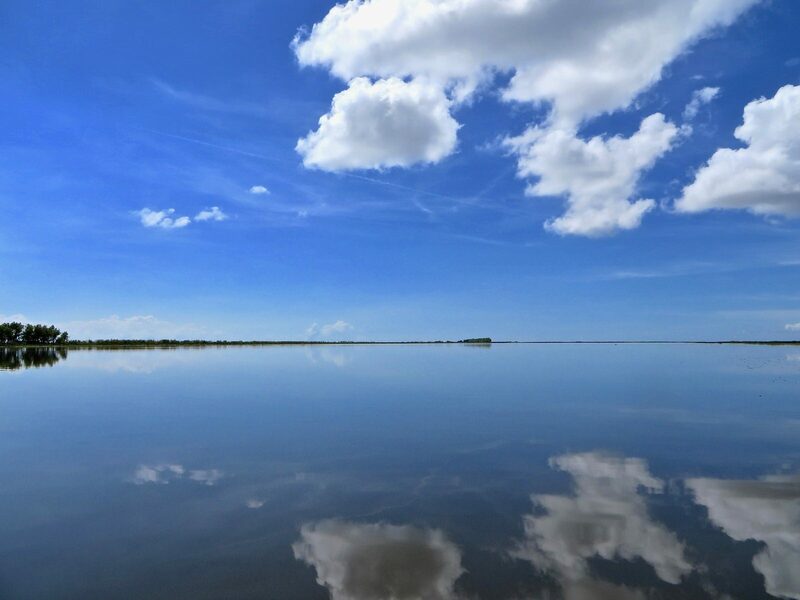 Hours of floating down glassy calm water surrounded by floodplain forests, nary a care in the world. 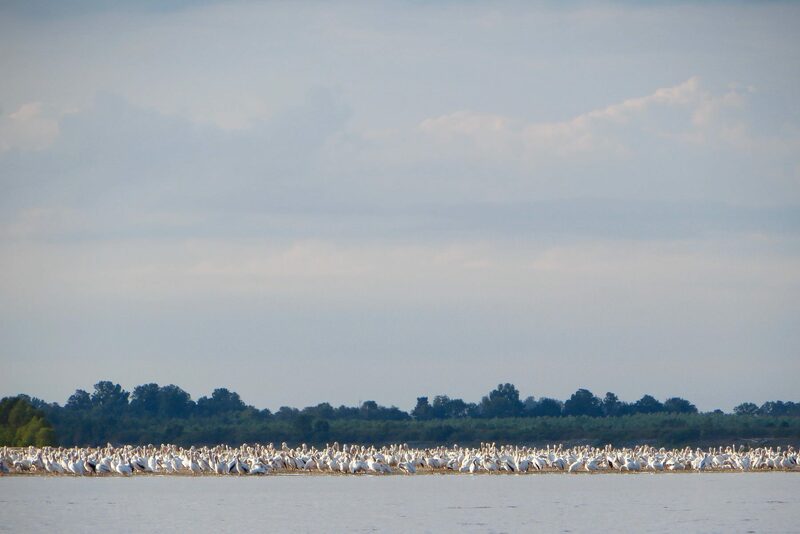 Flocks of hundreds or thousands of White Pelicans. 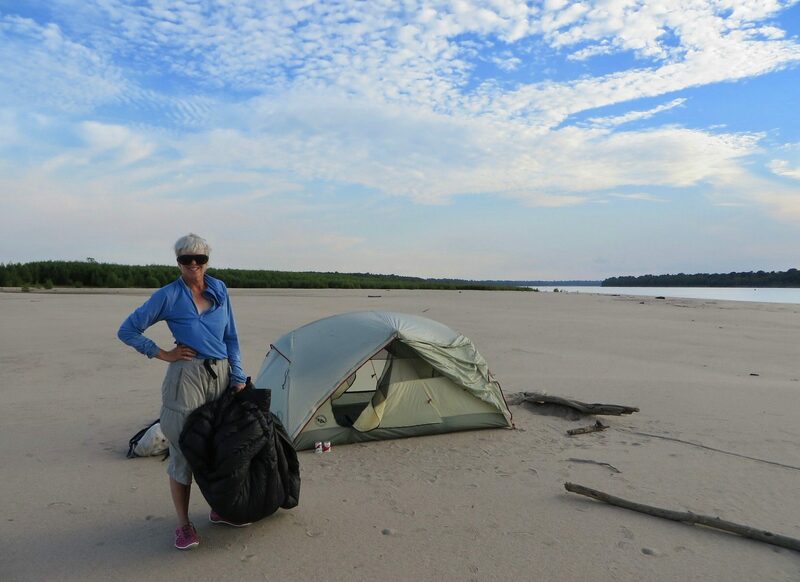 Many five-star campsites on beautiful huge sandbars. 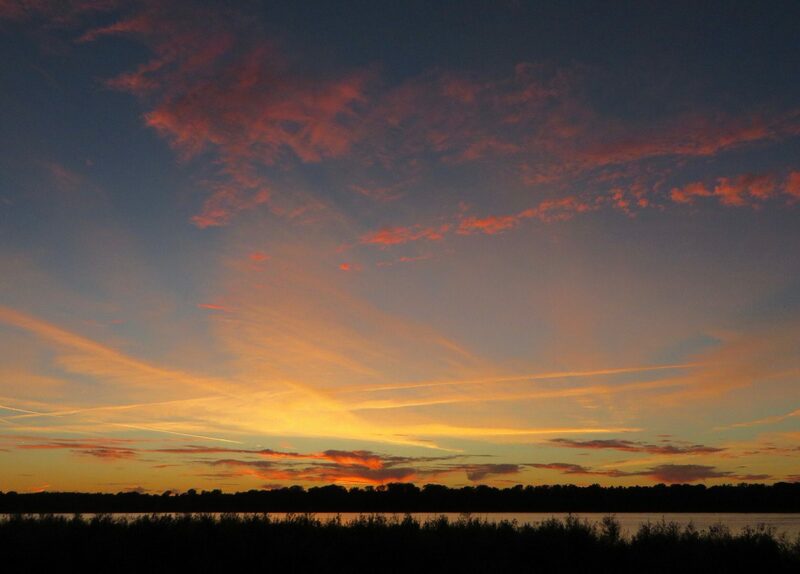 Dozens of beautiful sunrises and sunsets. The view of bridges from below delighted me every time. I was very pleasantly surprised by the minimal industry on the river, as I had expected far worse. 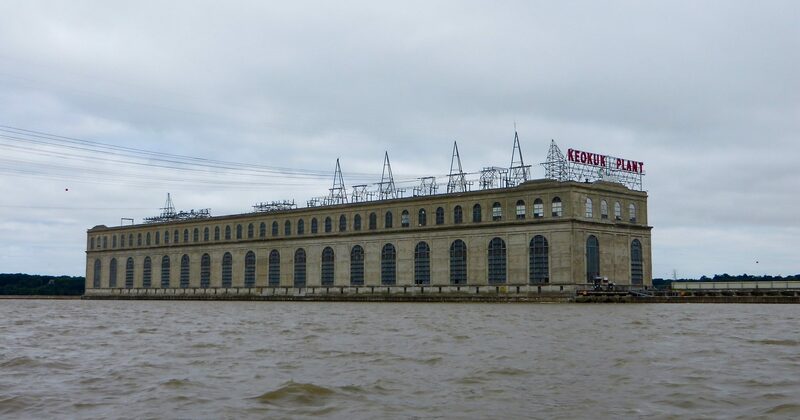 In fact, the industrial areas on the river are very limited and isolated. In the headwaters section the river corridor was beautiful and most of it felt wild. 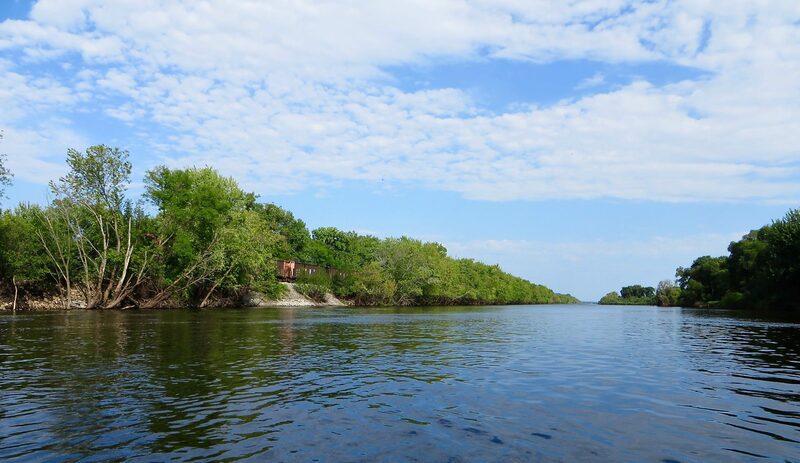 In the Upper River, each lock and dam was a massive structure, but once away from a lock, the river corridor was most often surrounded by riparian forests with little sign of human activity. 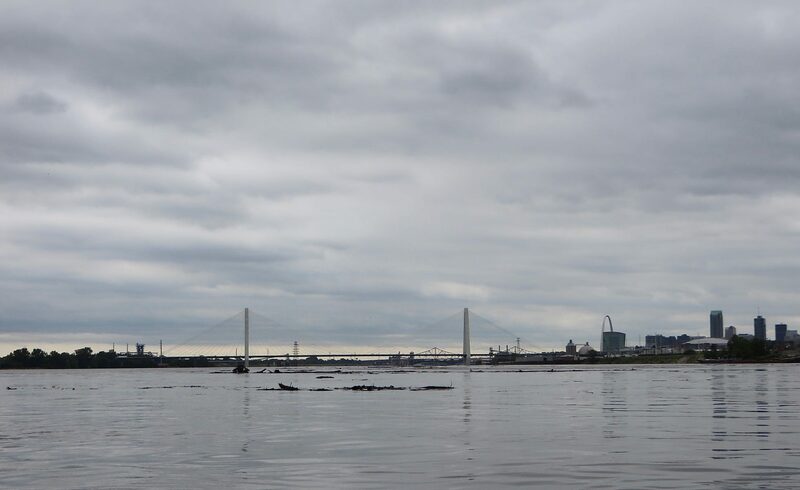 On the lower river, the wingdams and revetment were essentially always present, but for 90% of the miles those were the only signs of human activity. 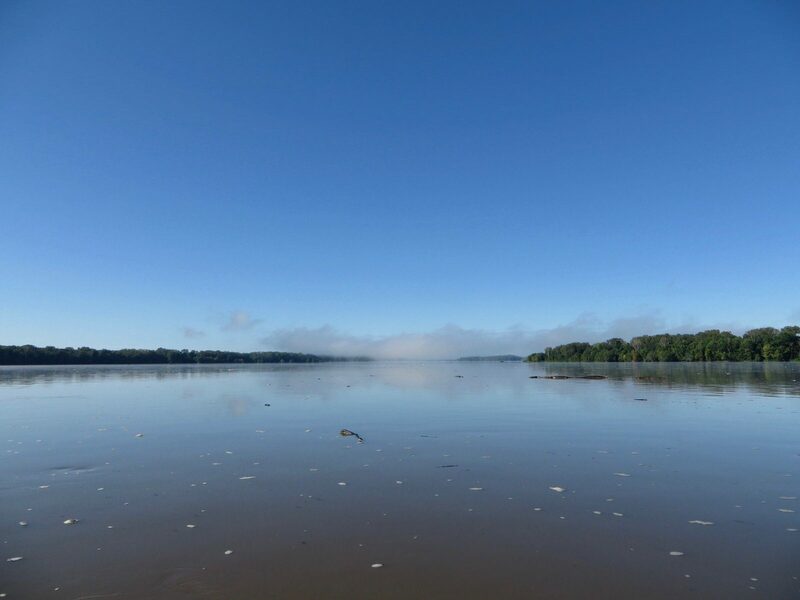 Visually, I found this to be a very beautiful trip, however I was irritated that the Army Corps has so thoroughly messed with the river south of Minneapolis. North of Saint Louis I enjoyed everything about the trip, except the tough Blanchard Dam portage where I slipped and hurt my back. 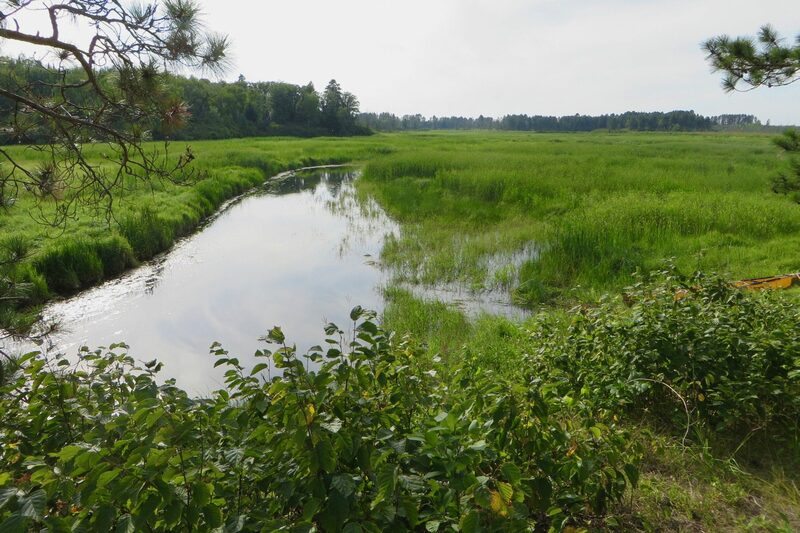 I enjoyed the habitat diversity: Spruce forest, expansive marshes, big lakes, and maple floodplain forests. 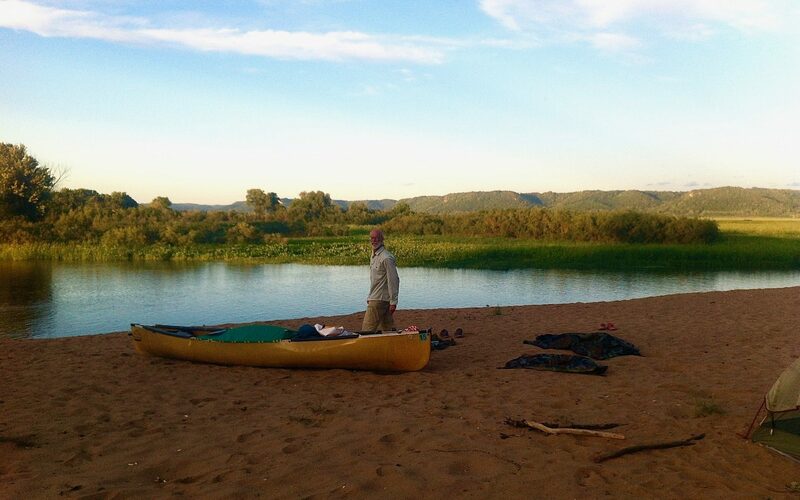 I enjoyed the paddling itself, the small towns, the swimming, and the campsites. 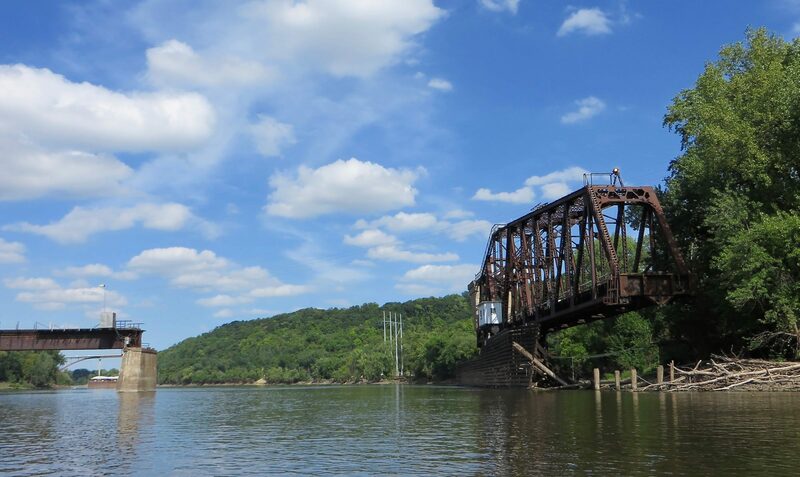 South of Saint Louis, I had a love-it / fear-it relationship with the river. I never got comfortable with the giant river and her giant tows. 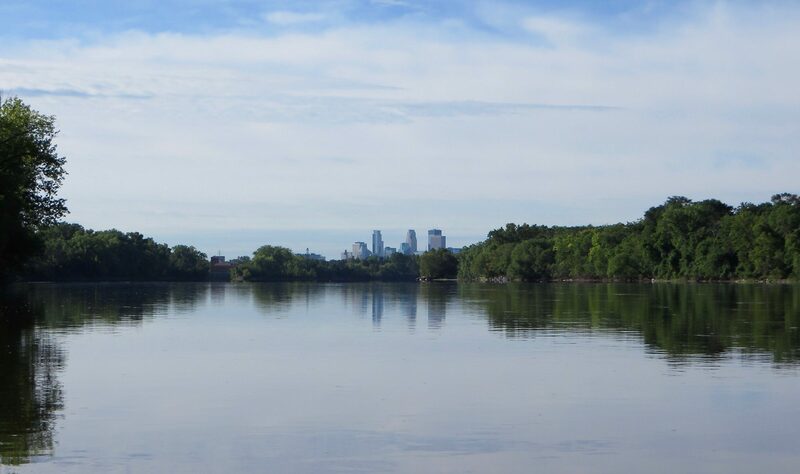 There were tows between Minneapolis and Saint Louis, but they were smaller and less frequent, and the river itself seemed more manageable. South of Saint Louis, and especially south of Cairo, I simply could not shed the fear that we would capsize and find ourselves in the shipping channel. 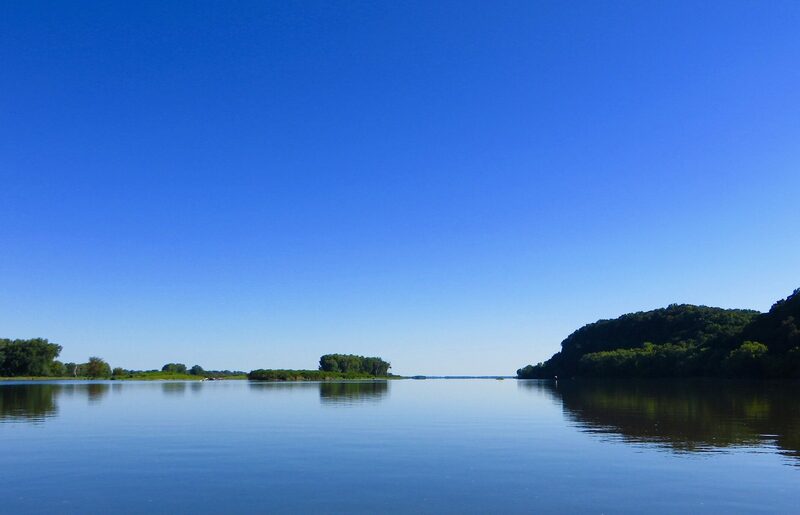 I felt we had full control of the canoe, and we had fabulous weather nearly every day on the big river, with glassy calm water nearly every day, so we never came close to capsizing. I’m sure my fear was grounded in the fact that we had no river paddling experience prior to this trip, and I did not feel “at home” like I do when hiking or riding my bike. Two things likely exacerbated my fear. 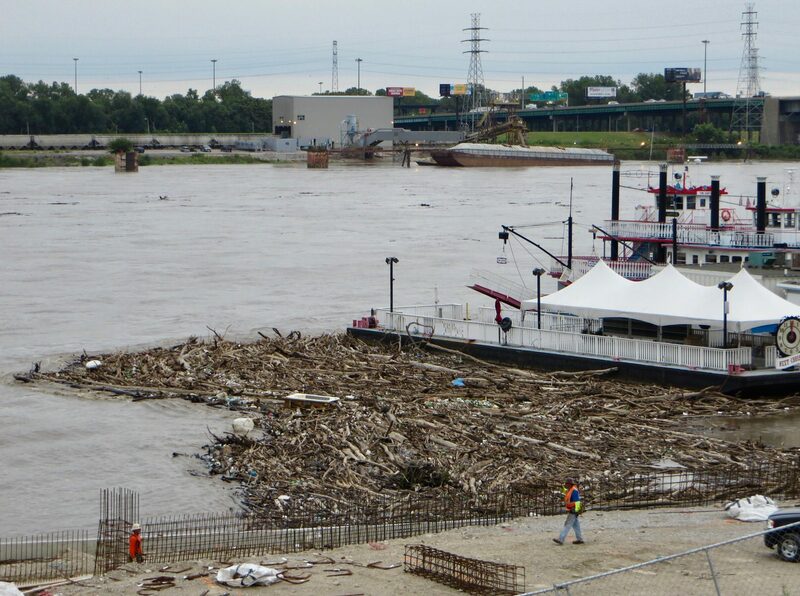 First was that the river went into flood stage when we reached Saint Louis, the volume doubled, the current increased noticeably, and the load of logs was substantial. Second was the absence of recreational users south of Saint Louis. 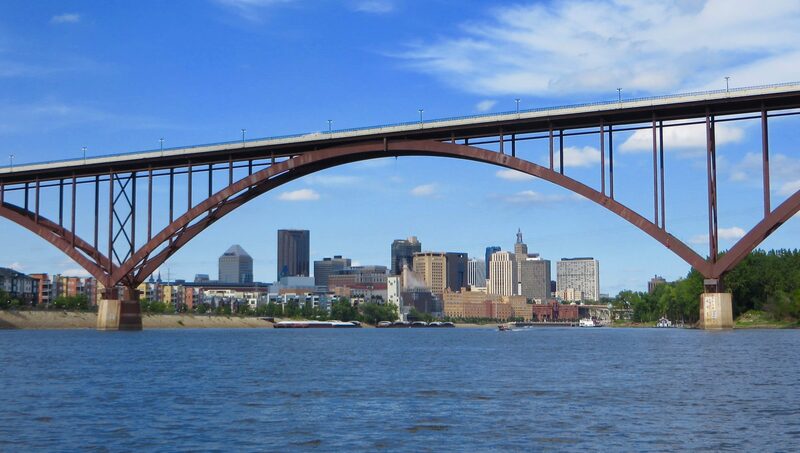 Given the abundant recreational use of the river north of Saint Louis, I was shocked by the near total absence of recreational use to the south – in 800 miles of river travel we saw perhaps a dozen people using the river recreationally, either from pleasure boats or fishing from shore. 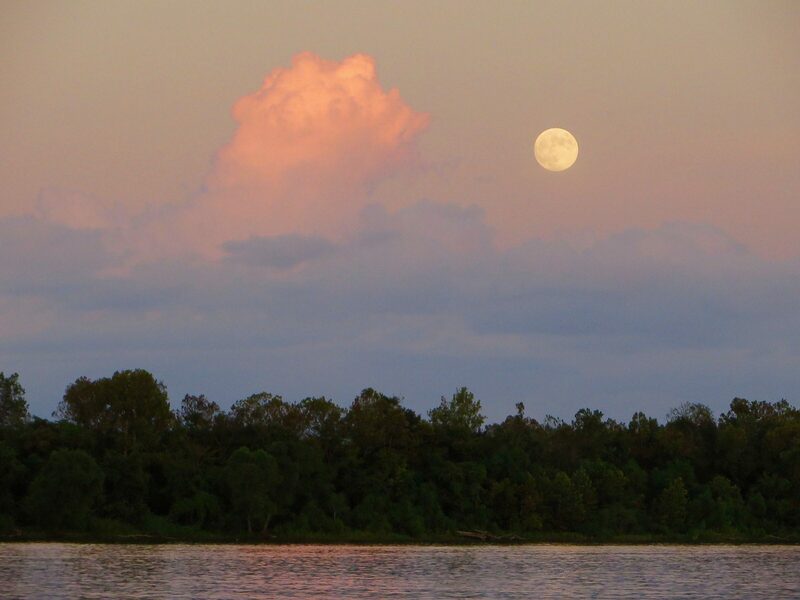 Once we crossed from the Mississippi to the Atchafalaya, I relaxed again and enjoyed that final week very much. I enjoyed the Cajun bayous, the small towns, the alligators, and the scenery. I am 100% sure we made the right decision to take the Atchafalaya River to the Gulf, instead of paddling through the heavy boat traffic areas south of Baton Rouge. Overall, I’d summarize this as a five-star trip for its combination of scenery, cultural diversity, fabulous encounters with local people, great campsites, and relatively easy logistics. I regret that I carried the fear while on the Lower River, as it interfered with an otherwise thoroughly enjoyable and magnificent outing. I entered this trip as a highly experienced long-distance backpacker, reasonably experienced dirt-road bicycle tourist, and completely novice canoeist. The trip seemed like an ideal way to try out a new means of human powered travel and a chance to see a part of the country I didn’t know very well and we were unlikely to visit otherwise. Our trip was fascinating. The entire river corridor was much wilder feeling than I ever imagined. We essentially traveled through riverine forest for the entire trip except when passing through towns and cities. The forests look healthy and are not marred by clear-cuts. There were no corn or soybean fields or cow pastures down to the water’s edge. The settled areas were mostly very compact and on the Lower Mississippi often were frequently not even visible from the water. Outside of the tows below Minneapolis and weekend powerboats above it, there is extraordinarily little river traffic. In the headwaters section, we went three days without seeing a single other person either on the water or on the banks. We were pleasantly surprised by how much of our trip felt like a wilderness experience rather than traveling a watery freeway through civilization. 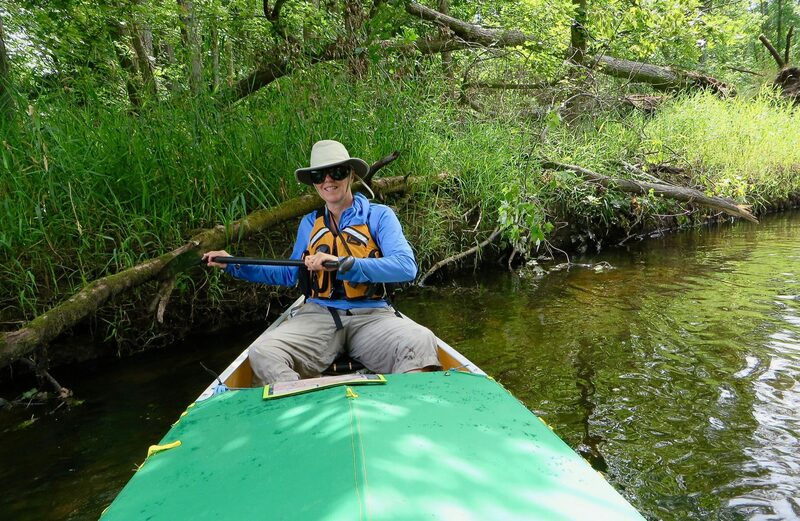 I enjoyed the process of paddling and soon became very comfortable with our boat. I felt safe, secure, and believed we could control it well enough to deal with any situation we were likely to have. 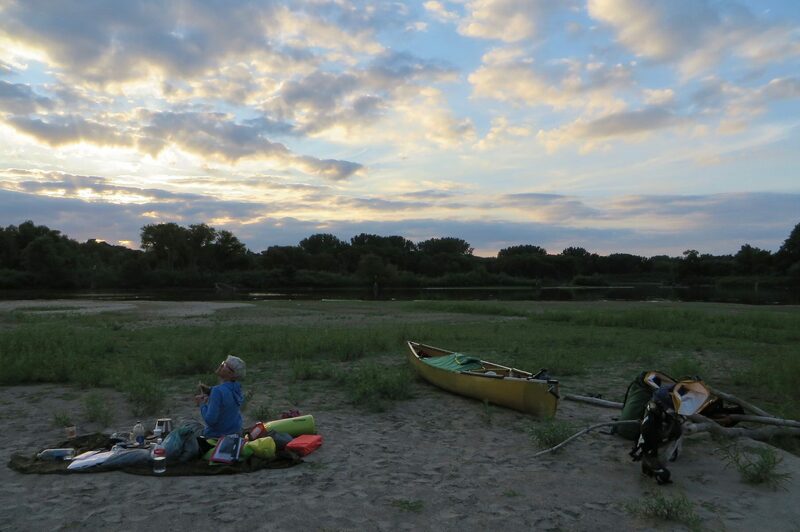 Although at times various bits of my body hurt, I never felt debilitated and was rarely worn out at the end of a day’s paddling. We were fortunate with generally great weather, few delays at locks, helpful and friendly people we met along the way, and no breakdowns of equipment. We had decent campsites every night and frequently great ones. The only real hassle was the mosquitoes. I wish we had found a way to be comfortable with leaving our boat and gear unattended so we could have explored the riverside towns more than we did; that was the biggest negative of the trip to me. Overall, the trip was a fabulous experience and I am very pleased that we did it. I would unhesitatingly recommend this trip to anyone with a sense of adventure and a willingness to try something out of the ordinary. 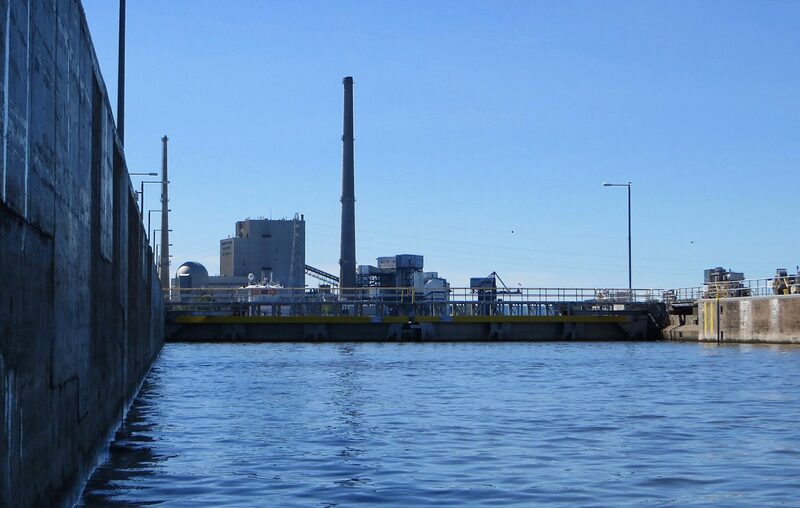 The MR is the main stem of the largest drainage system in North America and currently runs about 2300 river miles from its source at Lake Itasca, Minnesota, to its termination at South Pass in the Gulf of Mexico. 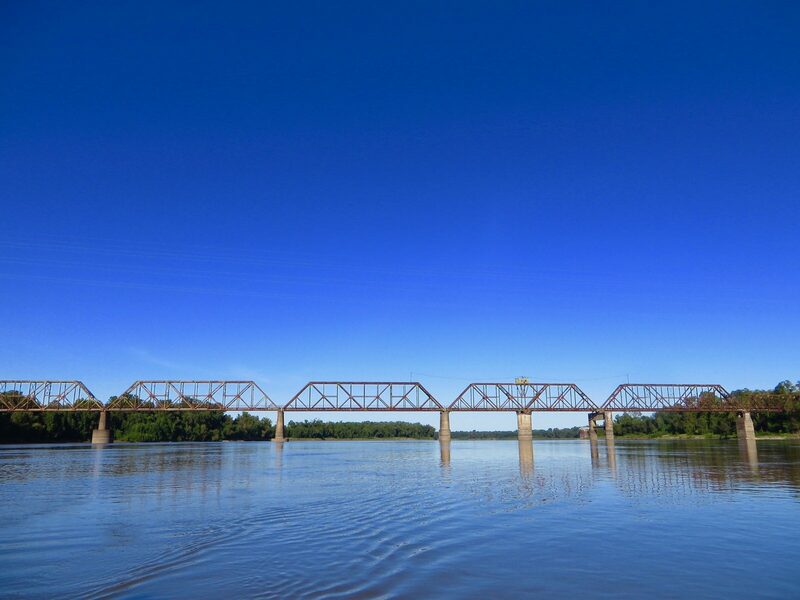 The river passes through or along the borders of ten states: Minnesota, Wisconsin, Iowa, Illinois, Missouri, Kentucky, Tennessee, Arkansas, Mississippi, and Louisiana. The average discharge at its mouth is 590,000 cubic feet per second; this is equivalent to 18,400 tons of water passing a fixed point in one second or well over 1,100,000 tons of water per minute. More information on the river can be found here. 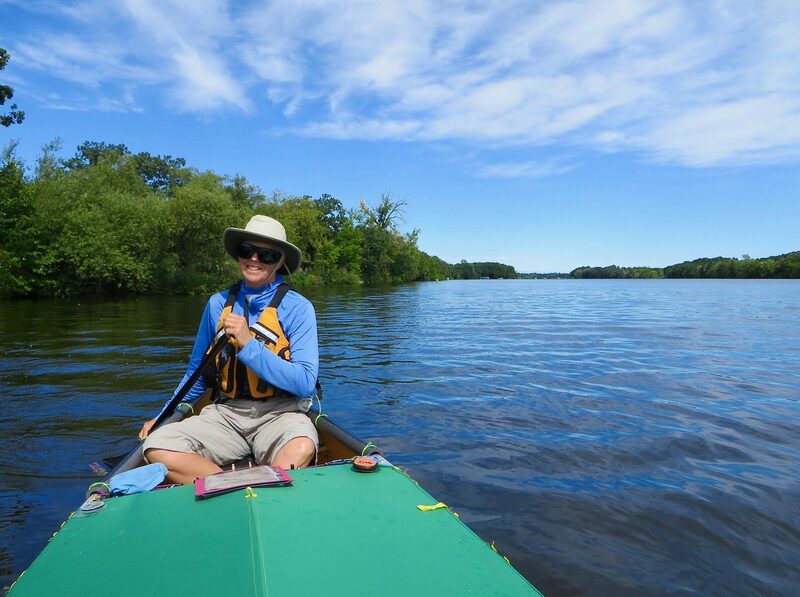 From a paddler’s point of view, the river divides into five logical segments: the Headwaters, the Upper Mississippi, the Middle Mississippi, the Lower Mississippi, and the Outlet. Each segment has its own distinct characteristics and flavor. 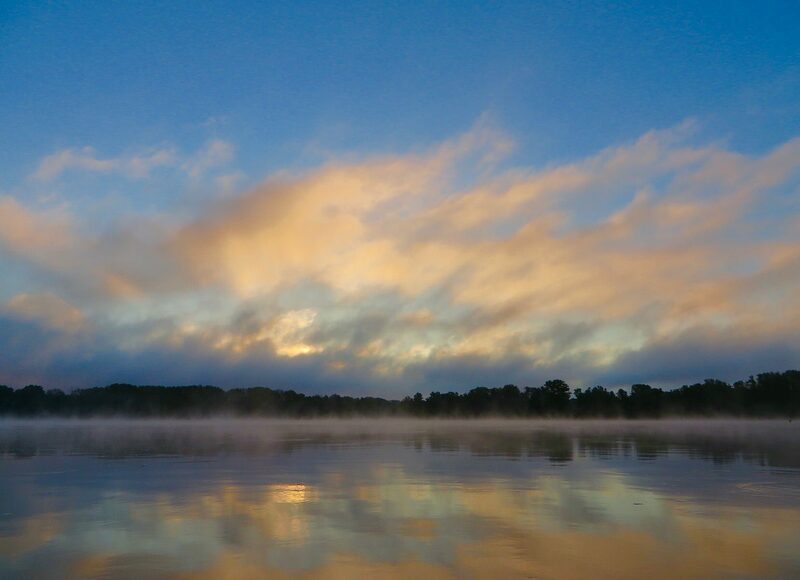 The Headwaters is the most scenically diverse portion of the river and runs 484 miles from the put-in at Lake Itasca (upper river mile 1338, as measured north from the confluence with the Ohio River) to river mile 854 at Upper Saint Anthony Lock in Minneapolis, the largest city on the river. 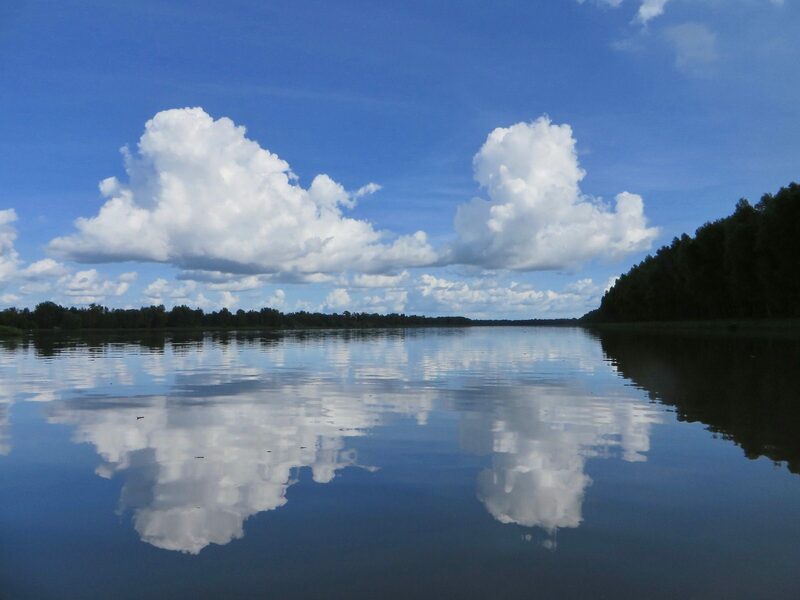 Early miles are narrow and shallow, there are extensive marshlands and some huge lakes, coniferous forests line some of the riverbanks, and there are easily accessible towns. The longest unpopulated stretch of water and many portages are found in the Headwaters. There is significant recreational use, primarily on the lakes behind old dams. 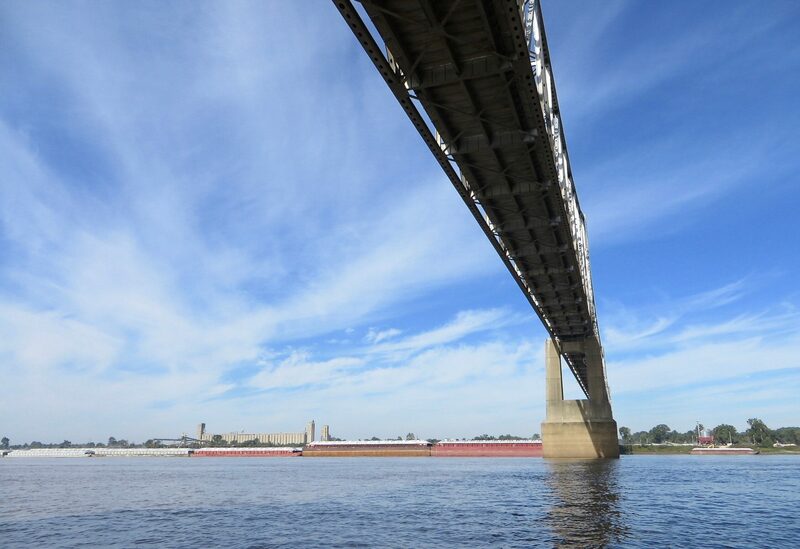 The Upper Mississippi runs 664 miles from the first lock (river mile 854) to the last lock (river mile 190) in St. Louis. This section includes 27 (29 on our trip) sets of locks and dams that must be negotiated by the paddler. The river gets big and carries commercial traffic in the form of tows. Towns are relatively frequent and are usually easily accessible. There are many recreational boaters on this segment. 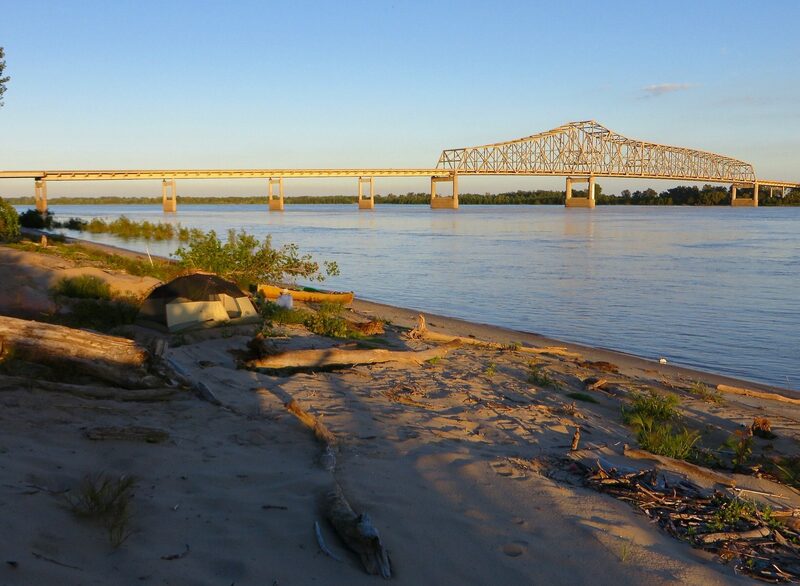 The Middle Mississippi runs for 190 miles from Saint Louis to upper river mile 0 at the confluence with the Ohio River. 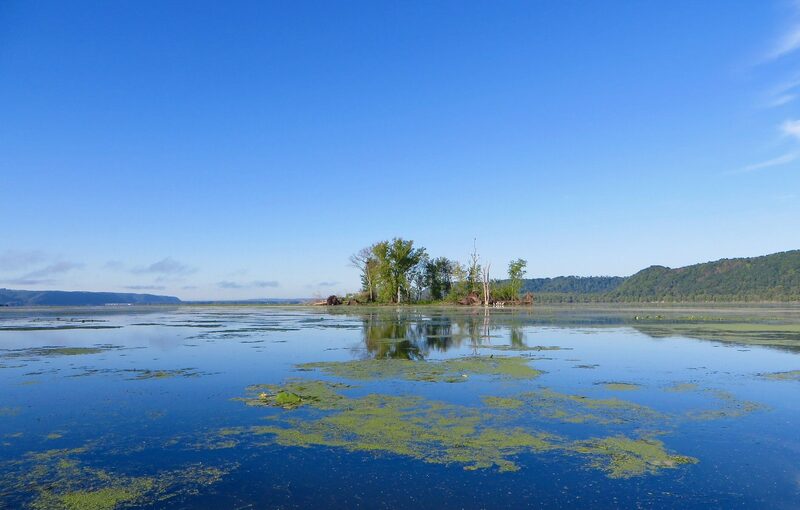 The Army Corps of Engineers designates this as part of the “Upper Mississippi”, however, from a paddler’s point of view it is similar in nature to the Lower Mississippi. Recreational use drops to near zero. 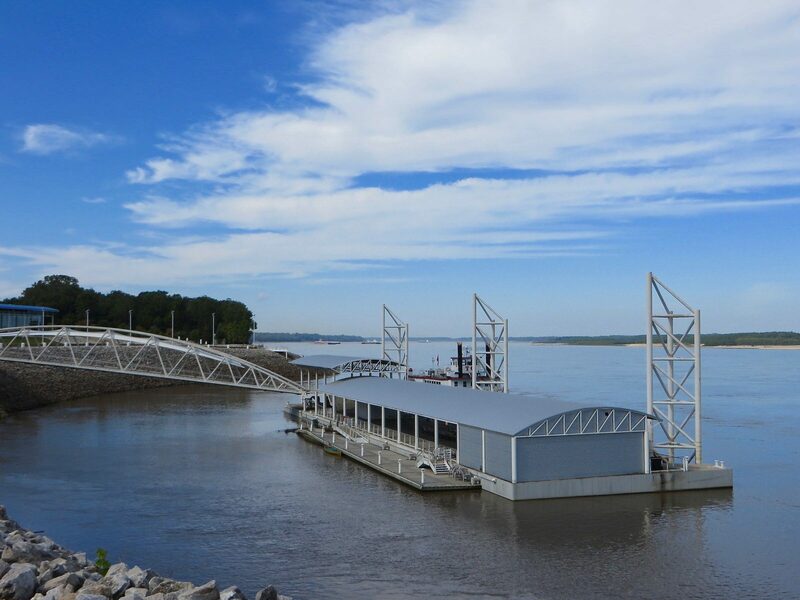 The Lower Mississippi runs from the confluence with the Ohio River (lower river mile 954 as measured from the Gulf) for 650 miles to the Old River Lock (river mile 303.8). 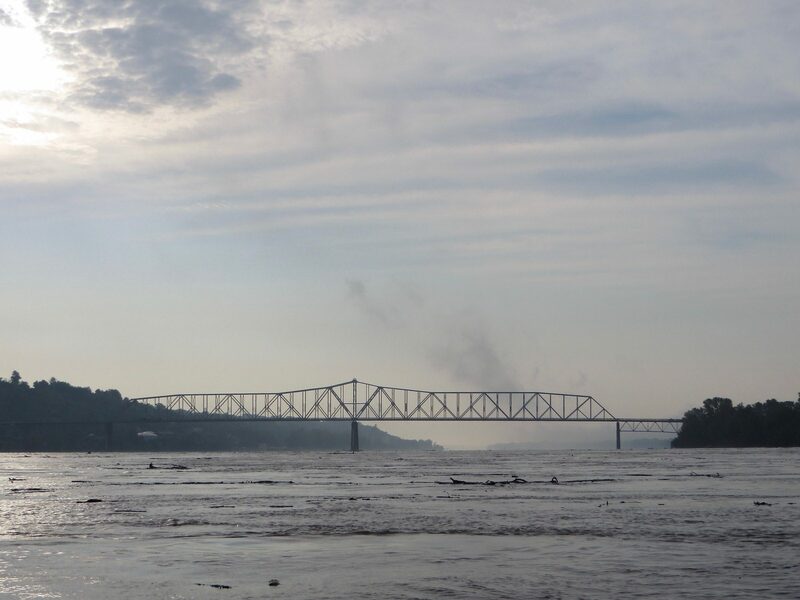 The Mississippi is really big, having absorbed the Missouri, which doubles its flow and the Ohio, which doubles it again. 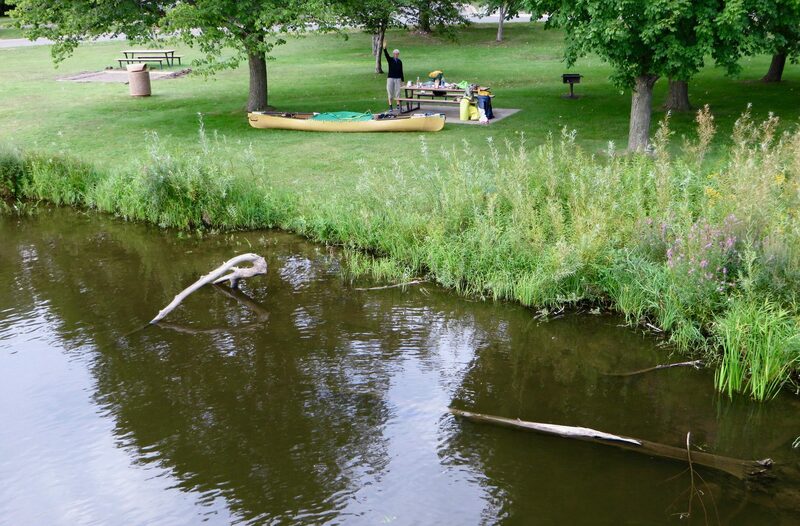 We encountered many big tows every day, but almost no recreational users either on the water or on the banks. There are neither locks nor portages. Towns are much less frequent and access to resupply is more complicated. 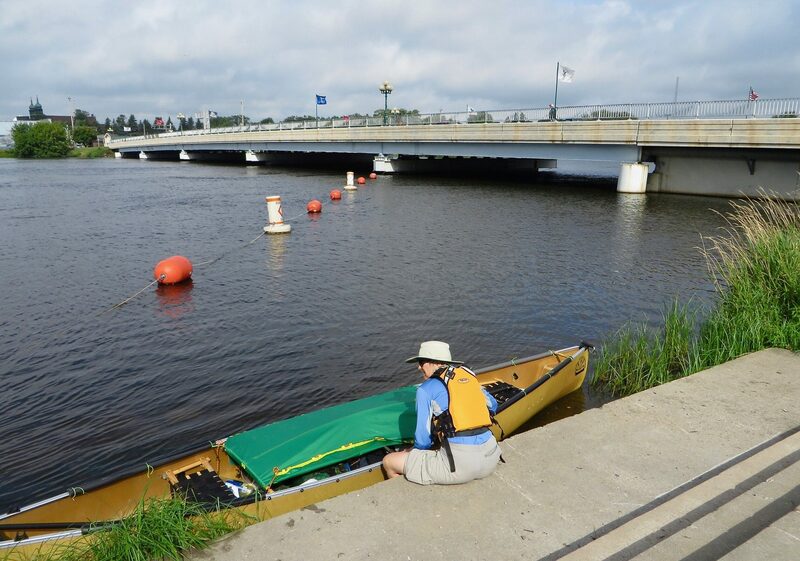 At the Old River Lock, a paddler has to chose between two Outlet options. 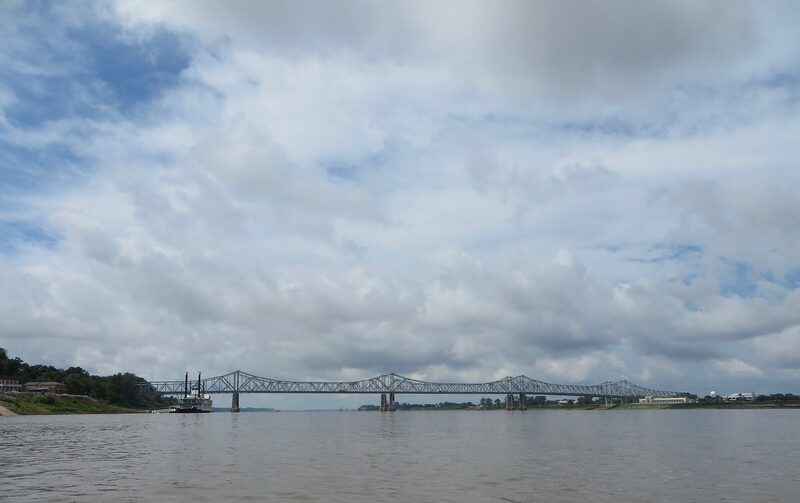 Transiting to the Atchafalaya River is one way to complete a MR trip to the Gulf, and this is the route we chose. 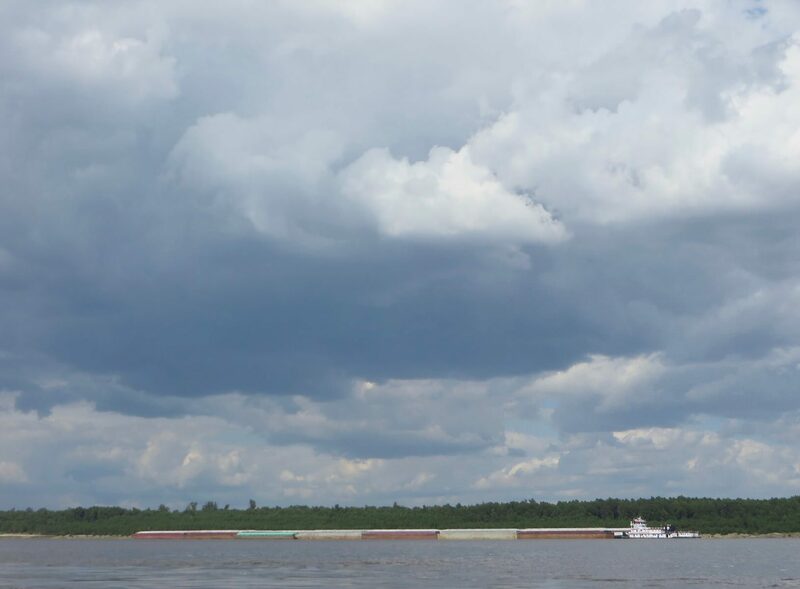 The alternative is to continue 300 miles on the Lower MR through Baton Rouge and New Orleans; the river from the Gulf of Mexico to Baton Rouge is the busiest port in the Western Hemisphere with 400 million tons of cargo passing through annually. 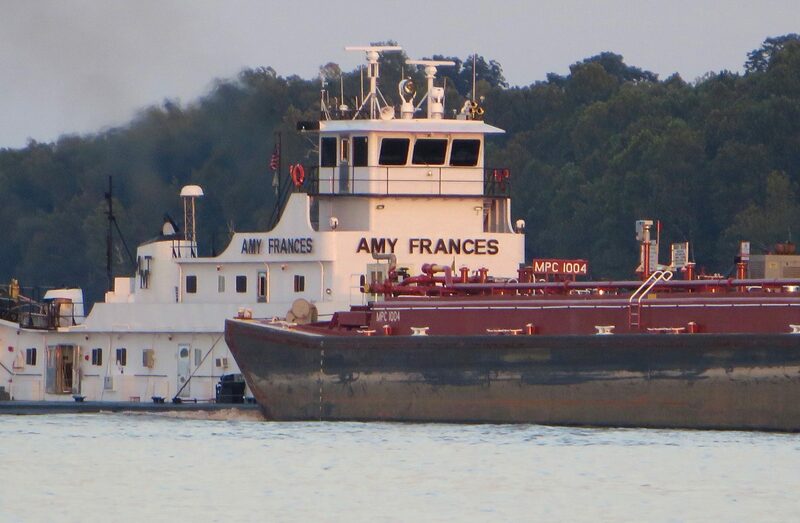 South of Baton Rouge the river is navigable by ocean-going vessels and marine traffic is very heavy, and by most reports, intimidating and potentially dangerous. 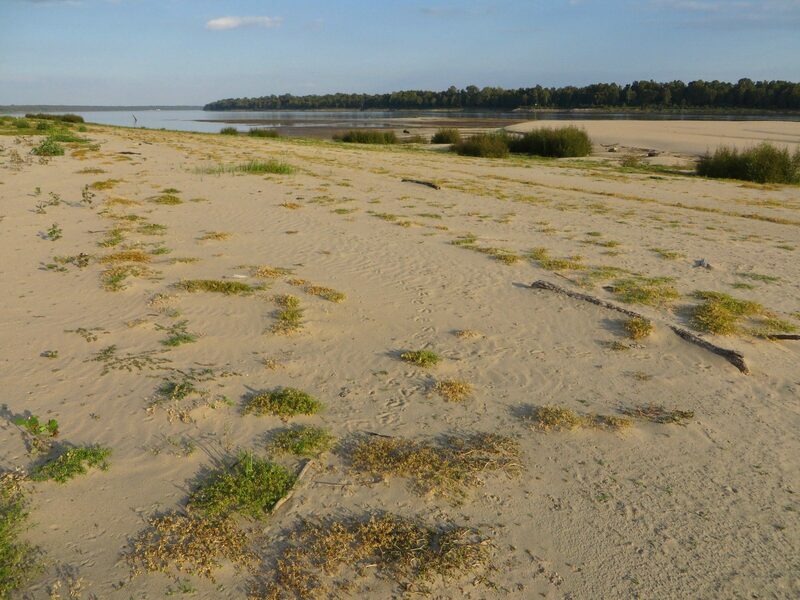 Below New Orleans, the Mississippi Delta creates multiple paths into the Gulf of Mexico. 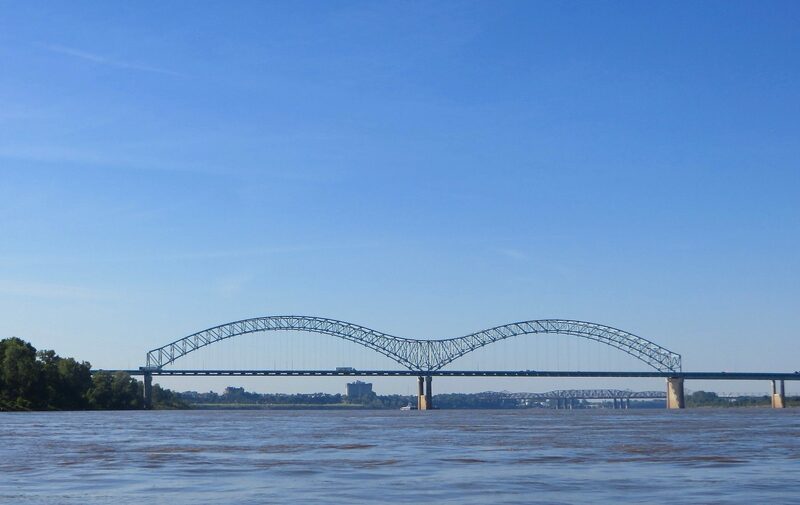 The Mississippi enters the Gulf in a classic delta: the big river splits into multiple distributaries as it flows out into the sedimentary delta it has built for itself upon reaching the Gulf. These distributaries originate as far north as the Baton Rouge area. 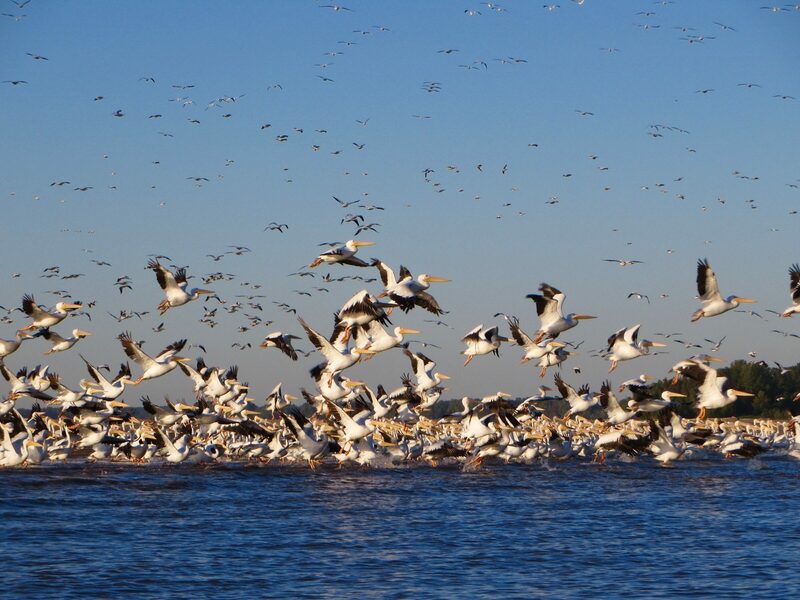 One of the largest of these distributaries is the Atchafalaya River. 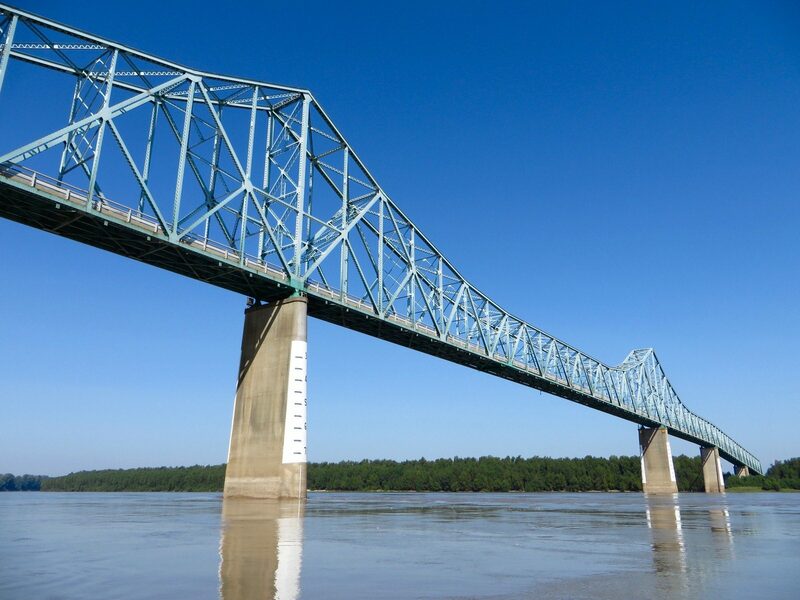 The Atchafalaya hydraulically “wants” to be the main exit for the Mississippi into the Gulf; it likely would be now if humans, starting in the 19th century, hadn’t prevented nature from taking its course. 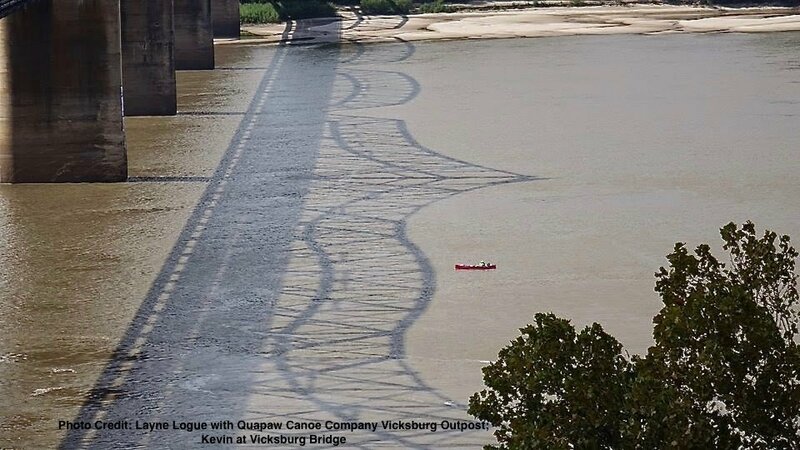 The problem with letting the river do what physics says it should is the human infrastructure and commerce dependent on the Mississippi flowing to the Gulf as a navigable river in it current alignment. Let the Atchafalaya capture the Mississippi and Baton Rouge and New Orleans would be commercially landlocked. 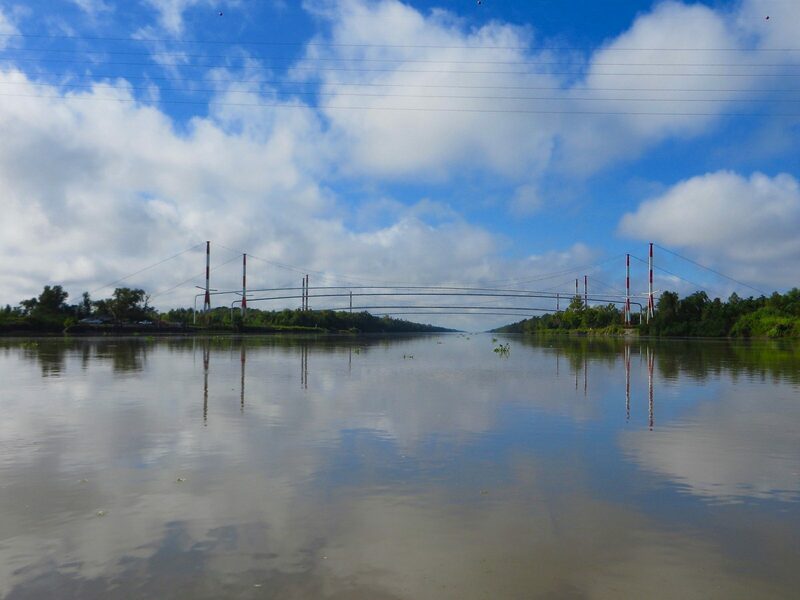 We cannot let that happen, so the Army Corps of Engineers has spent vast amounts of public dollars keeping the Atchafalaya from becoming the main course of the Mississippi. 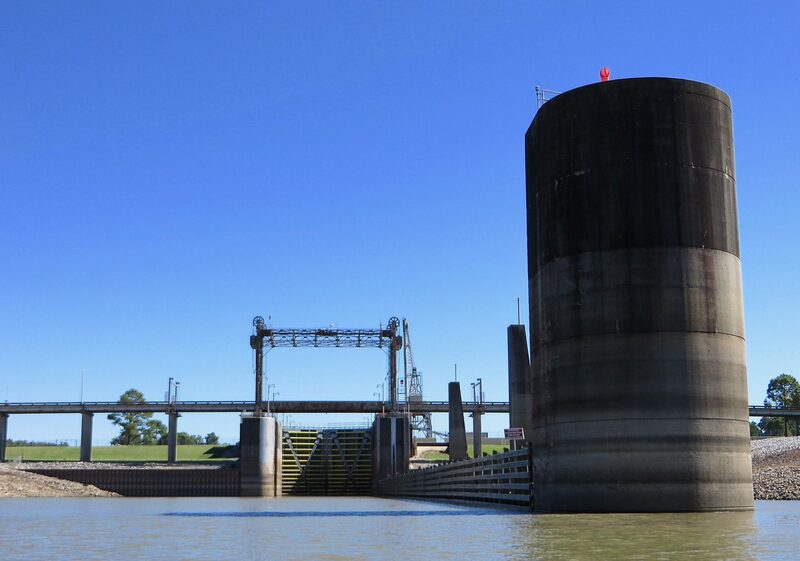 All that prevents river capture from happening are a number of concrete control structures, and a lock with a 15-foot drop from the Mississippi to the Atchafalaya. 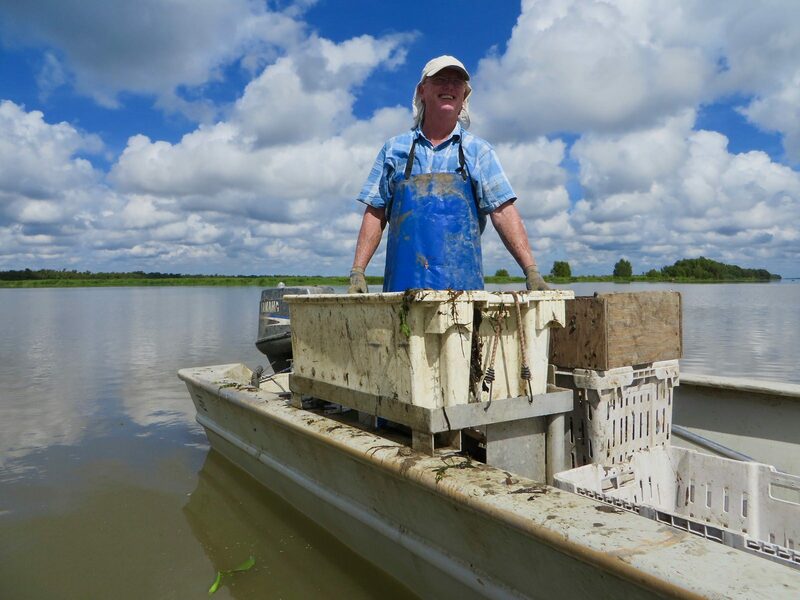 It seems inevitable that in the long, or not so long run, the Atchafalaya will get its way and become the exit for the Mississippi whether we like it or not. For a more detailed and much more literate explanation of all of this, read John McPhee’s superb The Control of Nature. This geography is a part of the rational for our decision to finish our paddle to the Gulf down the Atchafalaya, the “real” exit distributary. We also chose this route because: the heavy industrial areas from Baton Rouge south were not enticing to us; dealing with tows is challenging but confronting the ocean-going tankers was not something we wanted to do; New Orleans isn’t easily accessible to paddlers; and we wanted to end up in the Gulf near a place where we might easily find a ride back to a town. 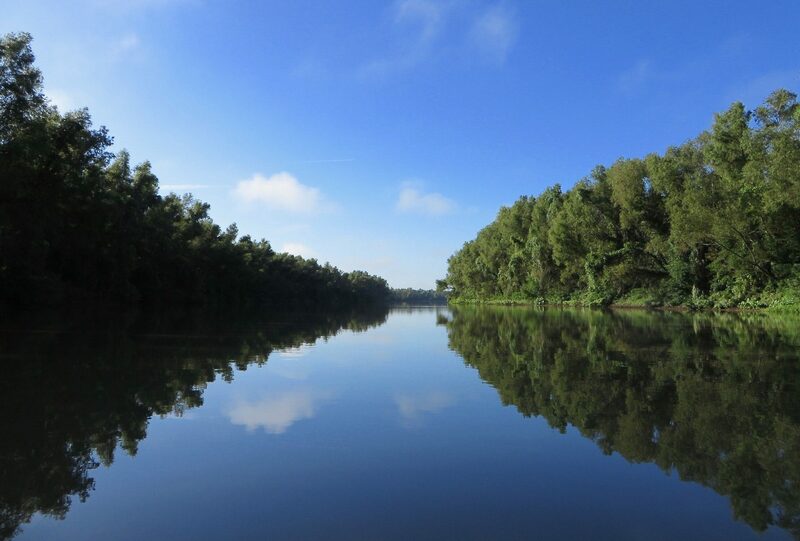 We discovered that the wilder lower reaches of the Atchafalaya were a great place to paddle. 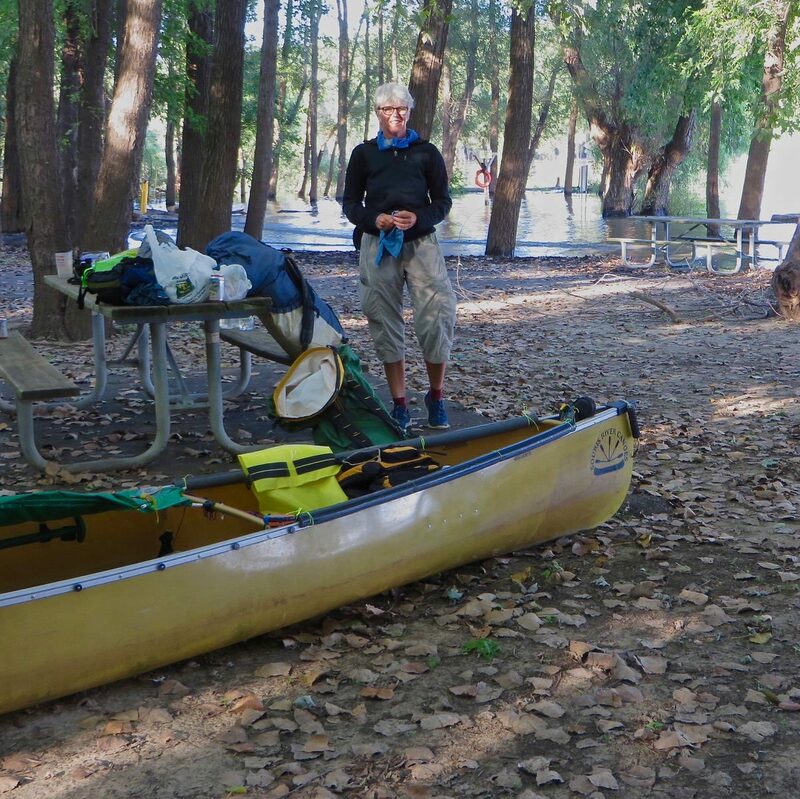 Several other paddlers with experience on the Lower River had also recommended the Atchafalaya as the exit of choice. 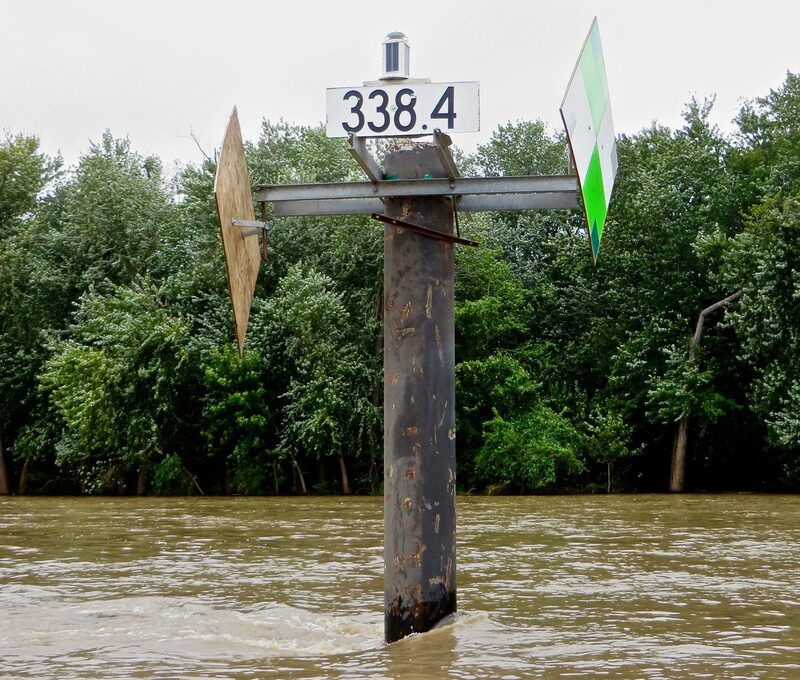 To transit the Atchafalaya, leave the Mississippi main stem at river mile 303.8 and enter a channel identified only by the mileage marker; the Old River Lock is a short way up the channel. After entering the Atchafalaya there are many routes to the Gulf. We chose to go via Butte La Rose and the Wax Lake Outlet, thus avoiding Morgan City. We were very pleased with the route we took; it is a quiet and beautiful alternative that is a geologically honest way to finish a MR trip. 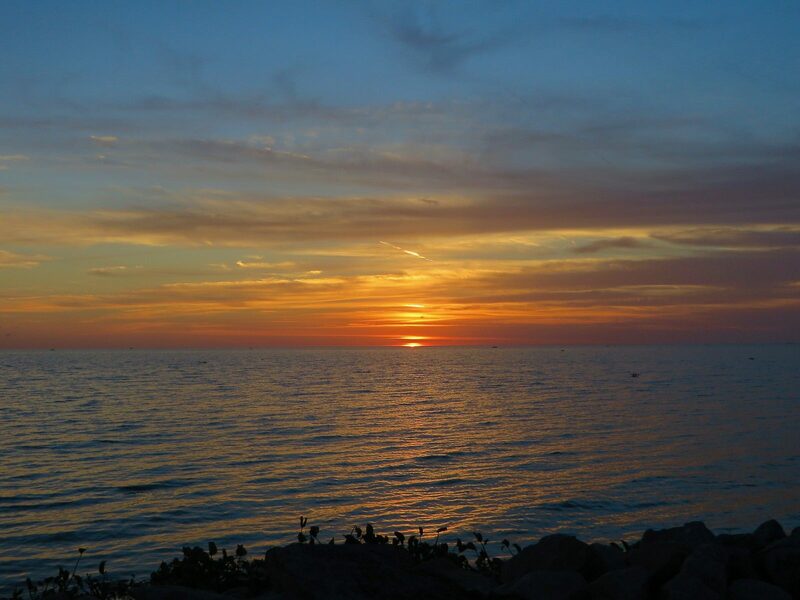 Should there be stormy weather in the Gulf, the Hog Bayou alternate also leads to Burns Point. Details are shown on this CalTopo map. 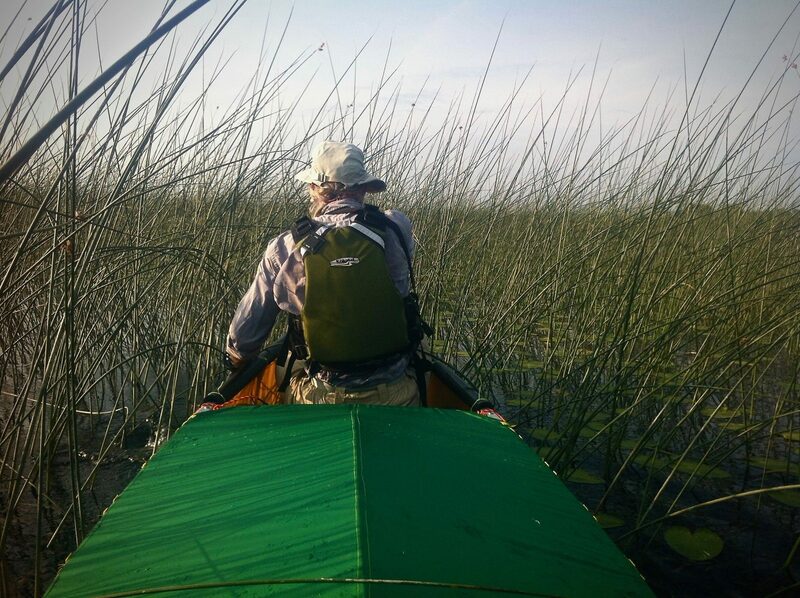 Also mapped is a Lafourche Bayou route recommended by a New Orleans paddler; we are not familiar with it, but it is another option to consider. 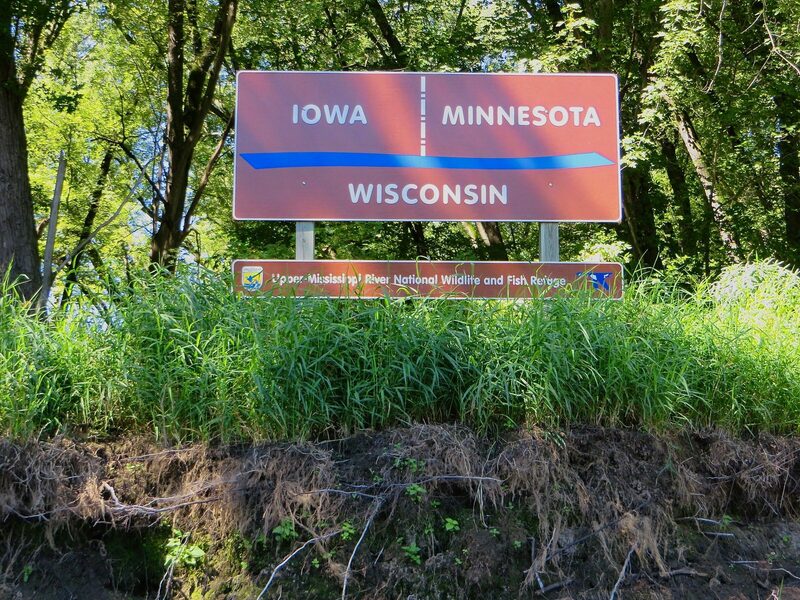 We drove a one-way rental car from California to Bemidji, MN. 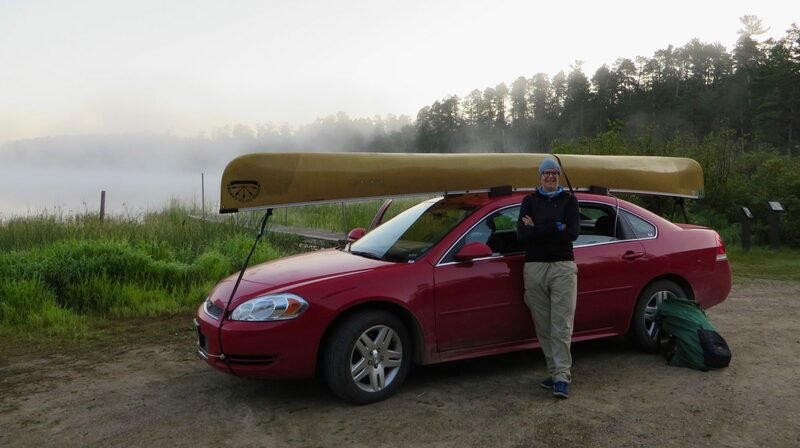 We dropped our canoe and gear at Douglas Lodge near the south end of Lake Itasca and James returned the car to the Bemidji Airport. 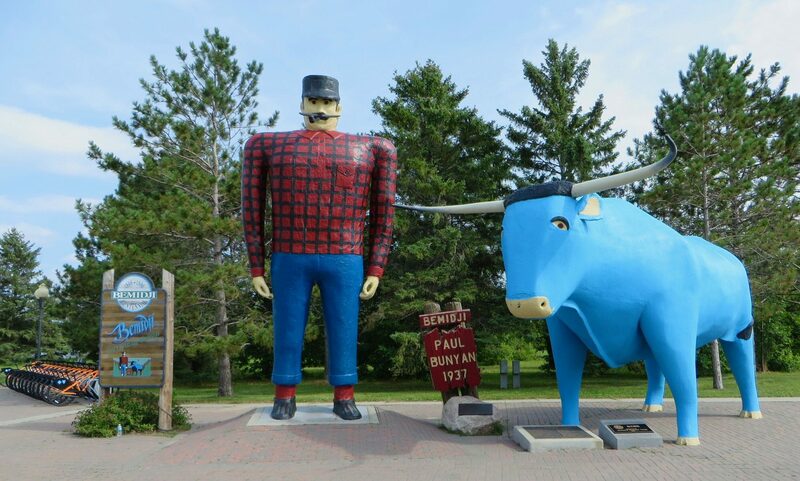 He hitched the thirty-five miles back to Itasca as there is no public transit between Bemidji and the Lake. Some people finish their trips at river mile 100 in New Orleans. Some finish at Head of Passes Junction at river mile zero. 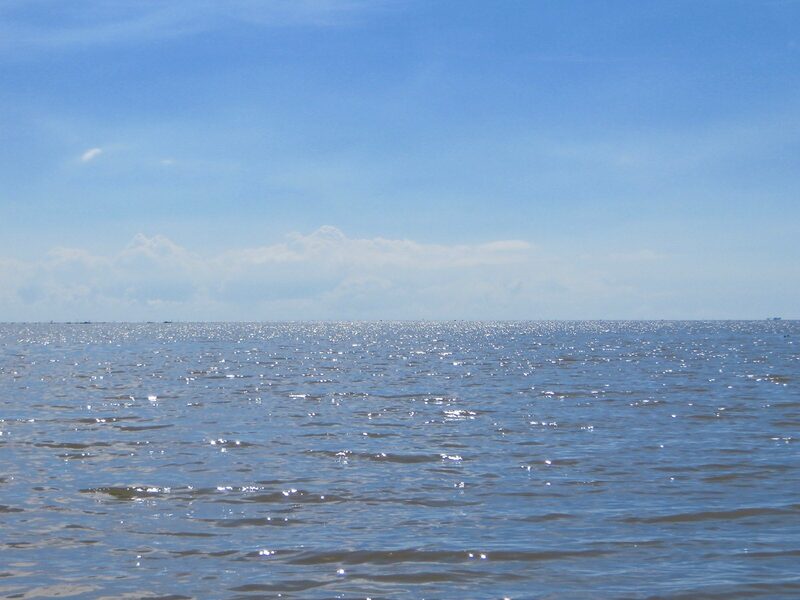 Some paddle about 15 miles further south all the way to the open Gulf. Some finish via the Atchafalaya River, either at the Gulf or at Morgan City. There are many other possible variations, since the region has an intricately interconnected series of waterways. 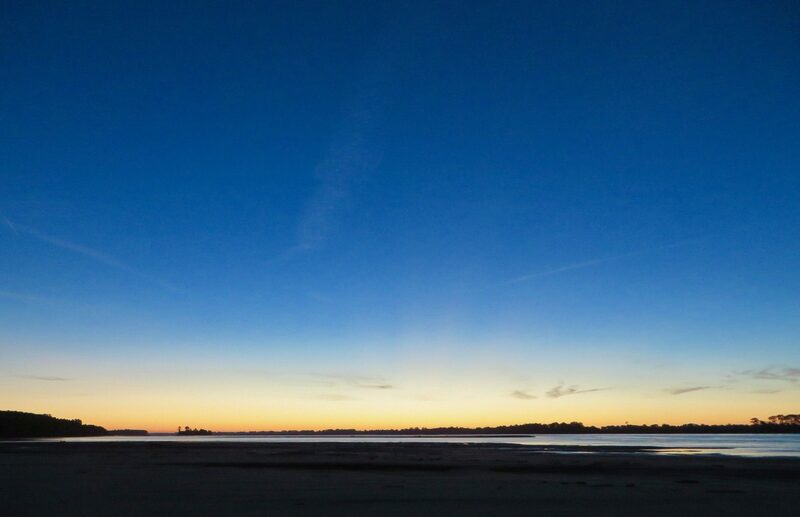 By completing our journey at Burns Point Recreation Area on the Gulf we were able to easily get a ride from a staffed boat ramp to a sizeable town, New Iberia, LA. 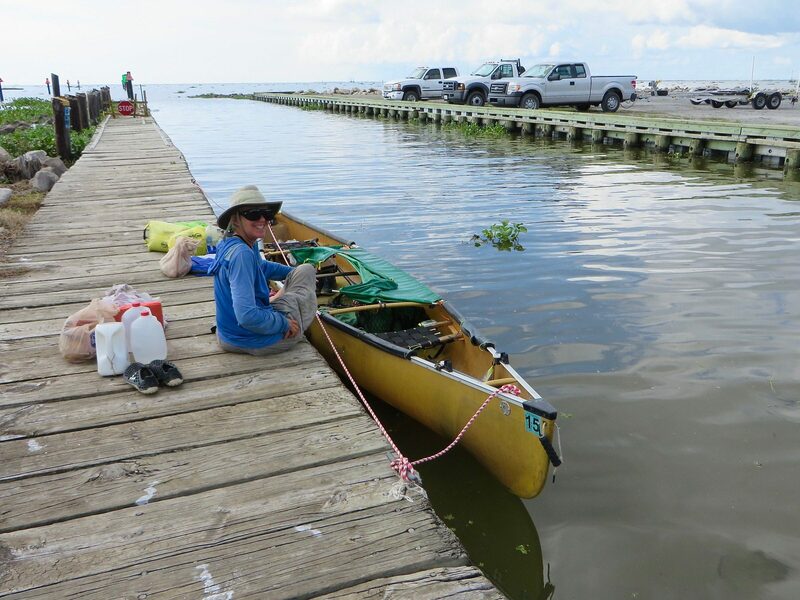 Other take-out points may require arranging a boat pickup, hoping to hitch a ride on a passing boat, or paddling back upstream to a boat ramp. 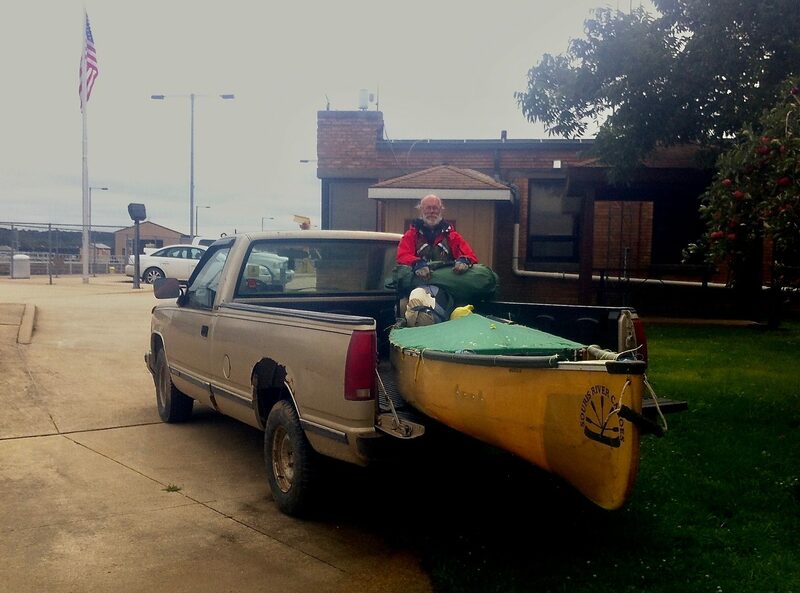 In New Iberia, we got a one-way rental car, and drove ourselves home, thus avoiding having to ship our canoe and gear. We carried paper copies of the Minnesota DNR maps (Lake Itasca to Hastings MN), and the Army Corps charts (Hastings to the Gulf) in a waterproof map case. All of these maps are available in pdf format from the links above. The maps are very detailed, showing navigational features like riverbank navigation lights and mile-markers. River miles are also intermittently posted on large signs on the banks so you can easily tell how far you have traveled. In our opinion, these maps are necessary and sufficient in terms of paper maps. We also downloaded USGS topographic maps and Google satellite images of the entire route and surrounding areas into our iPhone using the excellent app Gaia GPS; we used this as our primary navigation tool. 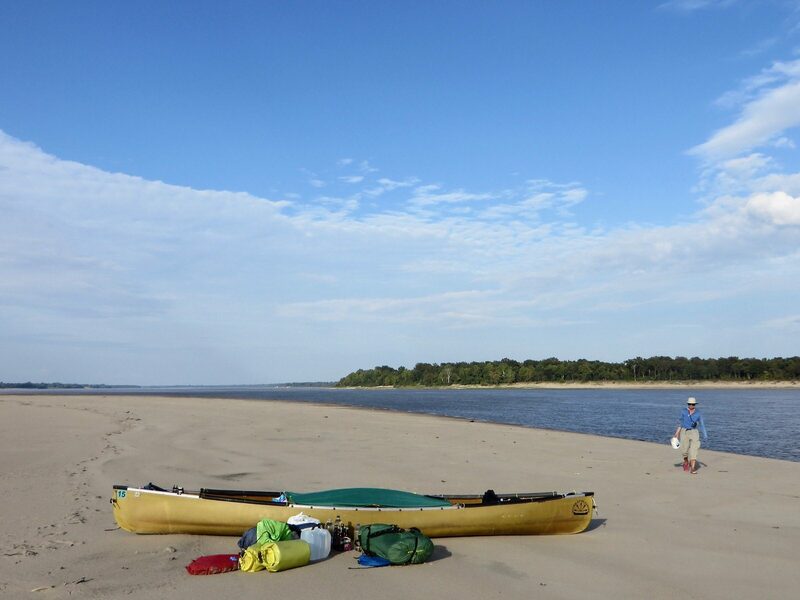 Of course it’s possible to paddle the entire river without a GPS device, but we found it very helpful on numerous occasions and we were glad we had it. To communicate with the lockmasters, we carried a Marine VHF Radio. You can possibly speak with the lockmasters via telephone, but we tried to use a phone only once and on that occasion reached a message center and not a human. Phone numbers for USACE Lock and Dams. NOAA streamflow graphs: choose “Stage/Forecast Graph” in the right column. Minnesota DNR river flow data. Army Corps upper river data. Army Corps lower river data. We also used iPhone apps Rivercast and Streamflow Plus to view river flow data, including the recent past and the 7-day forecast. There are other apps available that we didn’t try. We used an Army Corps site to check the status of locks. John Ruskey‘s lifetime labor of love RiverGator.org is an enormously useful website for the middle and Lower Mississippi. 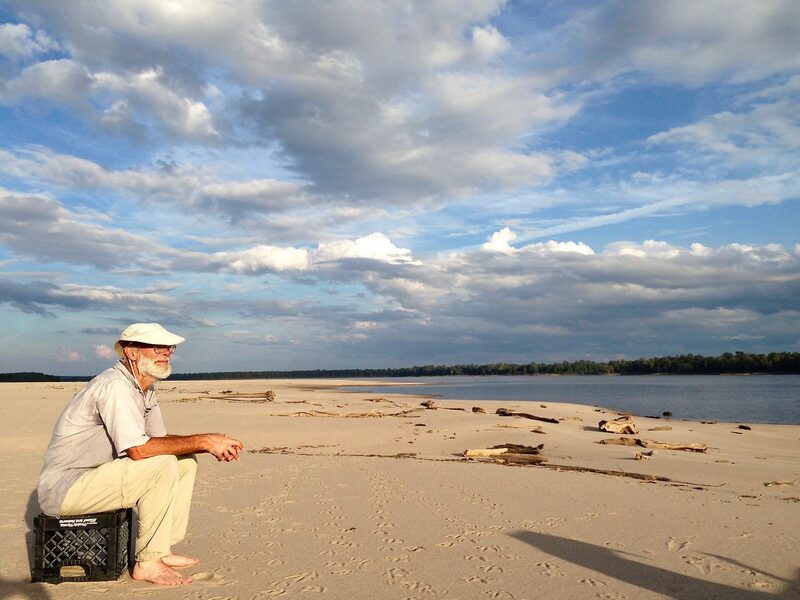 Ruskey is a long time river paddler who has been systematically detailing everything he knows about travel on the lower river. He describes both the main channel and alternative back channels. The back channels are sometimes a bit longer and sometimes shorter than the main channel; they provide routes in quiet backwaters behind islands where the tows don’t go. And most importantly, he includes information about what the water levels have to be to ensure that the alternative routes are passible. 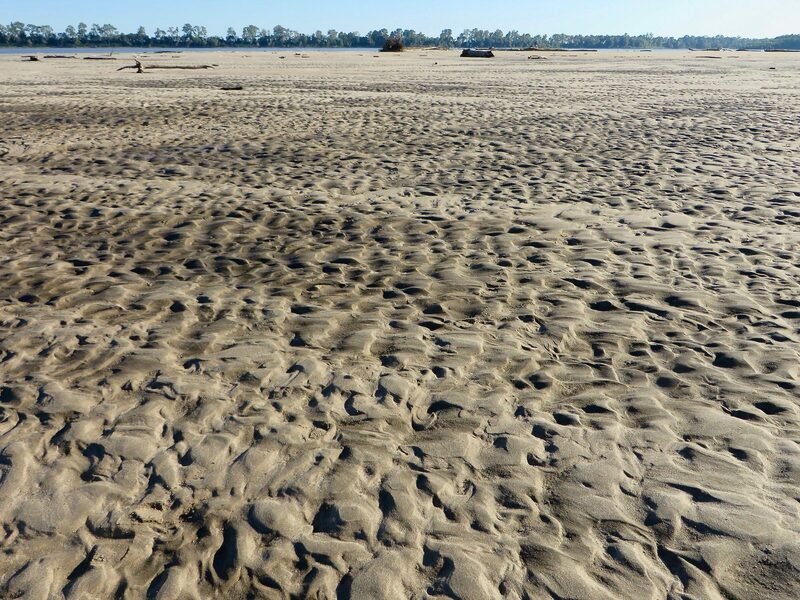 At low water, many back channels are impassible due to emergent wing dams or sand bars. 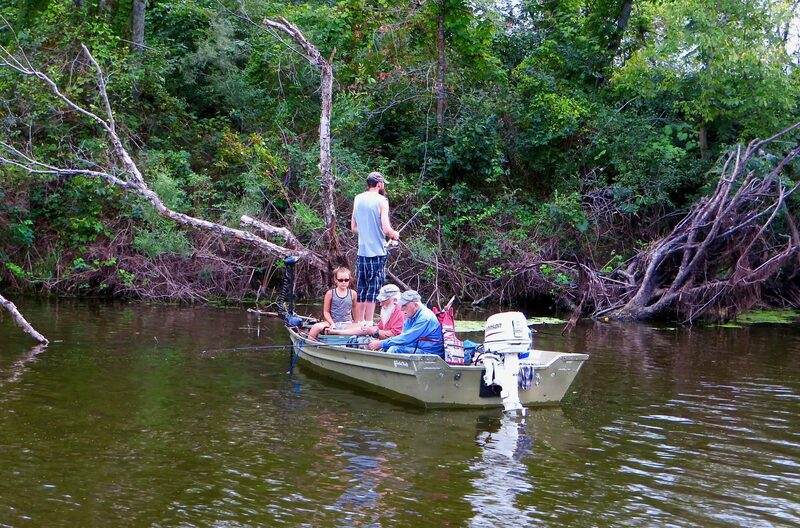 We paddled as many back channels as possible and never regretted it; the RiverGator data was invaluable. 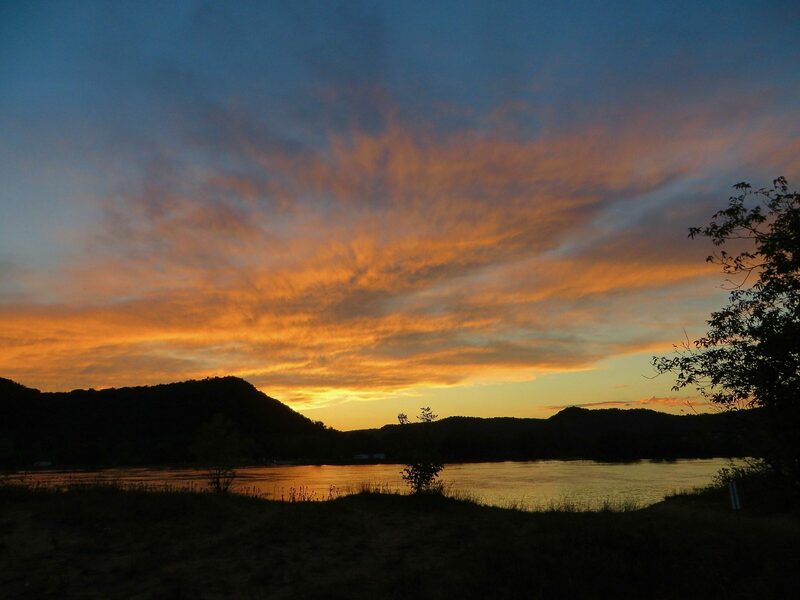 RiverGator also recommends good campsites and includes interesting and relevant historical and cultural information about the river. We were extremely grateful for all the work that Ruskey has done. 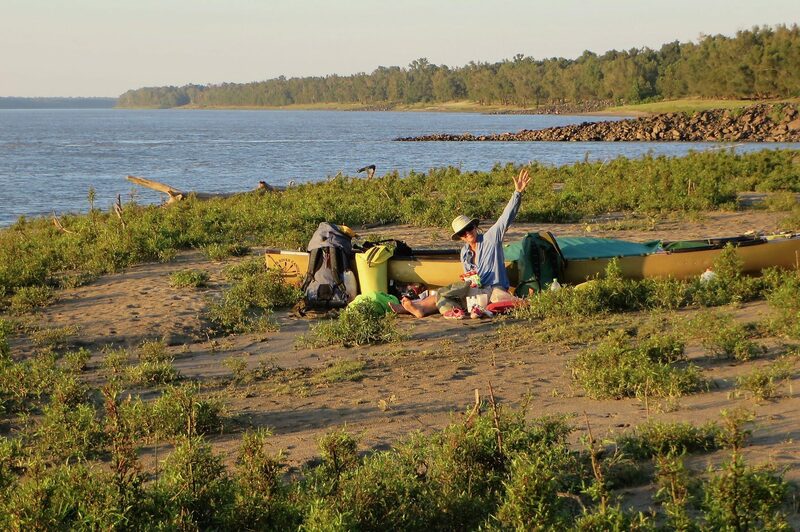 We took 58 days with an Atchafalaya exit; we took no zero days, paddled eight to ten hours a day and only lost a few partial days to bad weather. We believe we had shorter than average delays at locks. We had a lot of serendipitous volunteer assistance for re-supply activities. 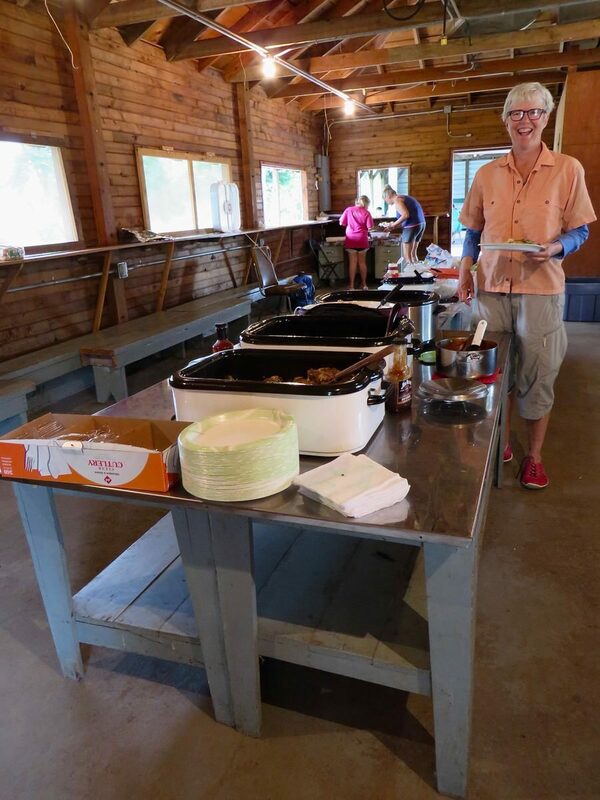 We enjoyed socializing during meals and at campsites, but we did not spend much time off the water visiting museums or other points of interest. We rarely dawdled when paddling, however we rarely paddled very hard. 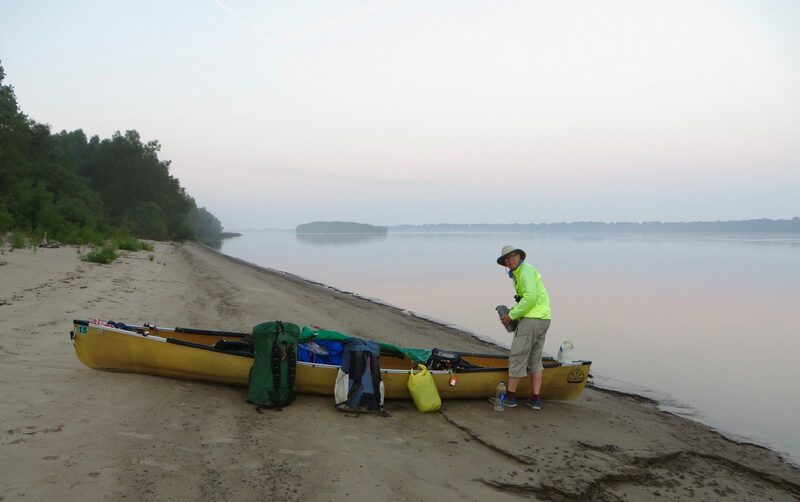 We had good equipment, not a lot of it, and knew how to do everything except canoe before we started the trip. We were well prepared and carried a lot of navigational data so we knew what to expect downstream. We were two people paddling one canoe; a solo canoeist would likely travel more slowly; a kayaker might be a bit faster. If you travel on your own, then you have to do everything by yourself instead of being able to share community tasks. Trip duration is highly dependent on water levels and wind. 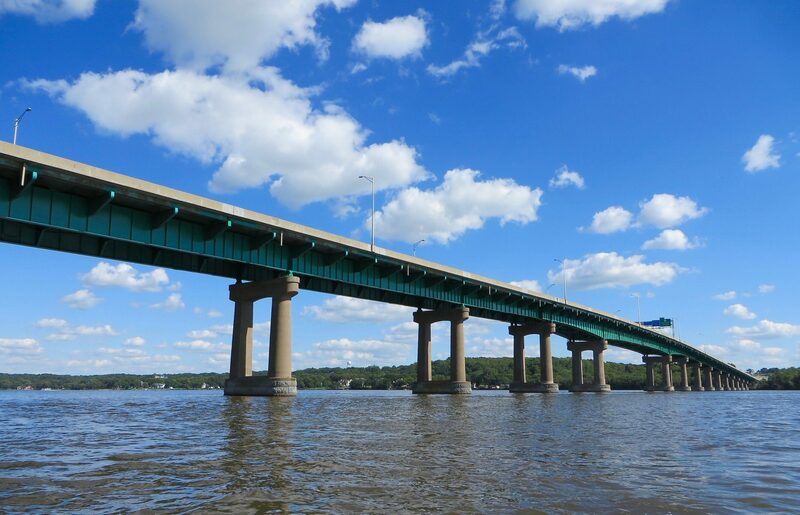 Depending on the water temperature and skill of the paddler, when the wind is strong enough to kick up whitecaps, it may be unsafe to be on the water. When we had mild headwinds and manageable choppy water, our daily distances were reduced by 20 to 40%. In strong winds we were forced off the river entirely. 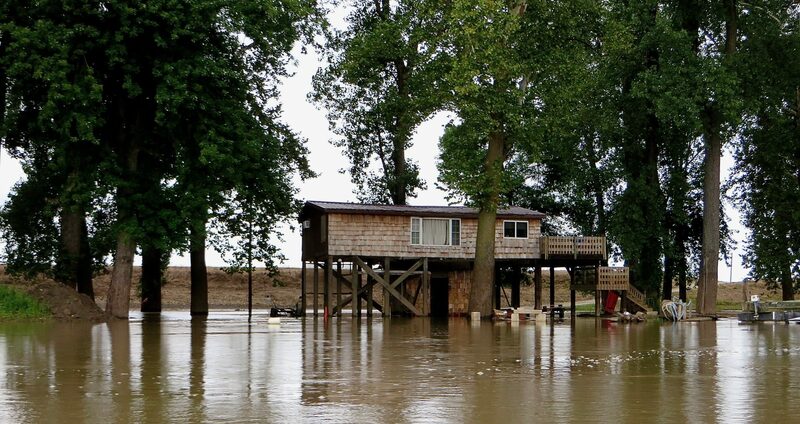 When the river is high, the current is stronger and faster, and there are more options to take the shorter route around inside curves over the top of wing dams and sandbars and to make use of backchannel shortcuts. 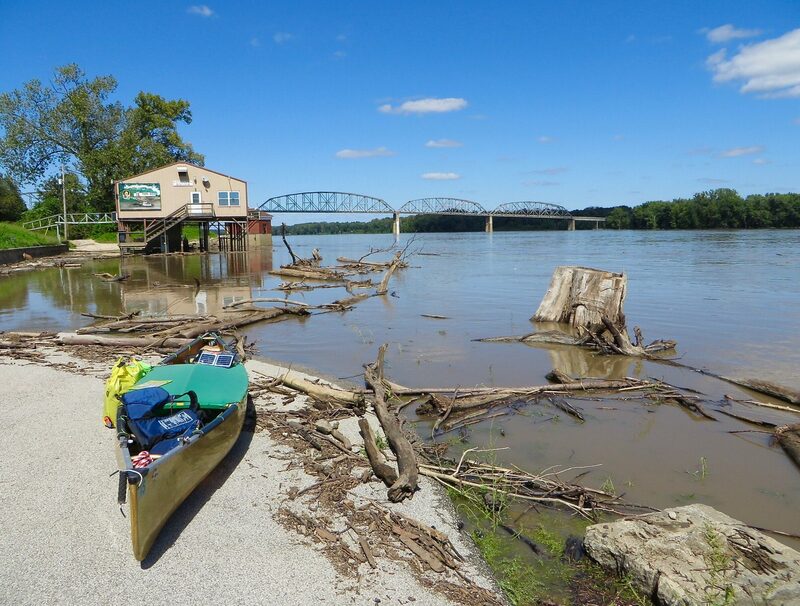 High water also brings a lot of debris, which can complicate paddling. It is impossible to predict ahead of time how far you can paddle on a given day. Distances covered will be affected by current or lack of it, winds and weather, lock delays or not, resupply activities that sometimes can be surprisingly time consuming, your physical and mental state and so forth. 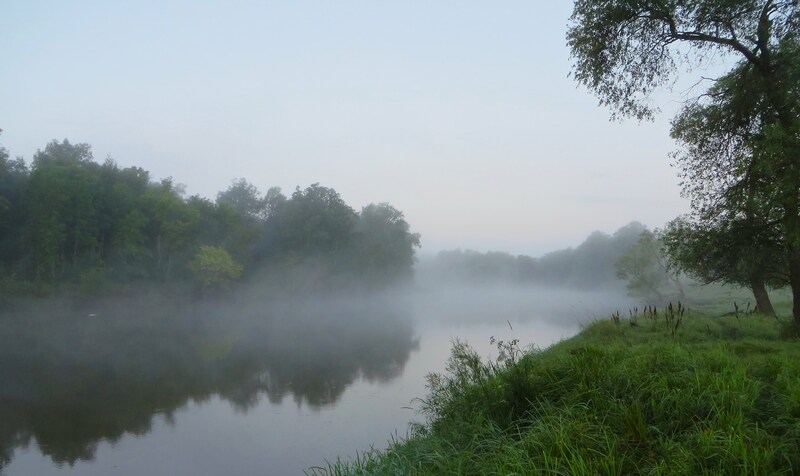 It is impossible to create a day-by-day plan for paddling this river. day length: the days are quickly getting shorter by mid September. air temperature: it can get quite hot and humid in the summer, especially on the Lower Mississippi. On the other hand, it can be uncomfortably cool from November to April anywhere on the route. water temperature: during August the water temperature north of Saint Louis is in the mid to upper 70’s; the temperature drops during September from the 70’s to the 60’s, and in October from the 60’s to the 50’s, and in November to the 40’s and even into the 30’s. RiverGator.org recommends a wetsuit when the water temperature is below 60; south of Cairo this occurs starting sometime in November. 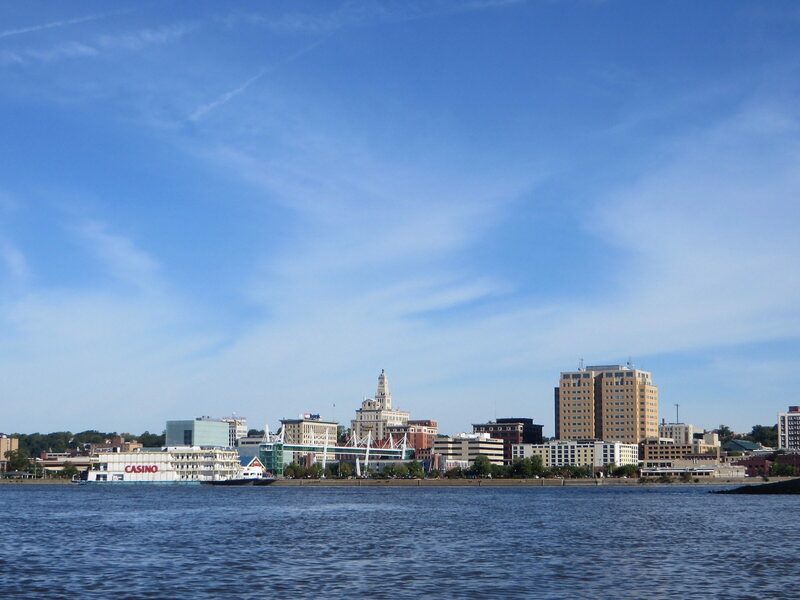 We read of two parties in 2014 that capsized in the Lower River. Capsizing in 75˚ degree water is a bother; capsizing in 55˚ degree water can be very serious. And remember that you will be having at least your feet in the water on a daily basis as you land and launch your boat. mosquitoes: likely worse earlier in the season than later. 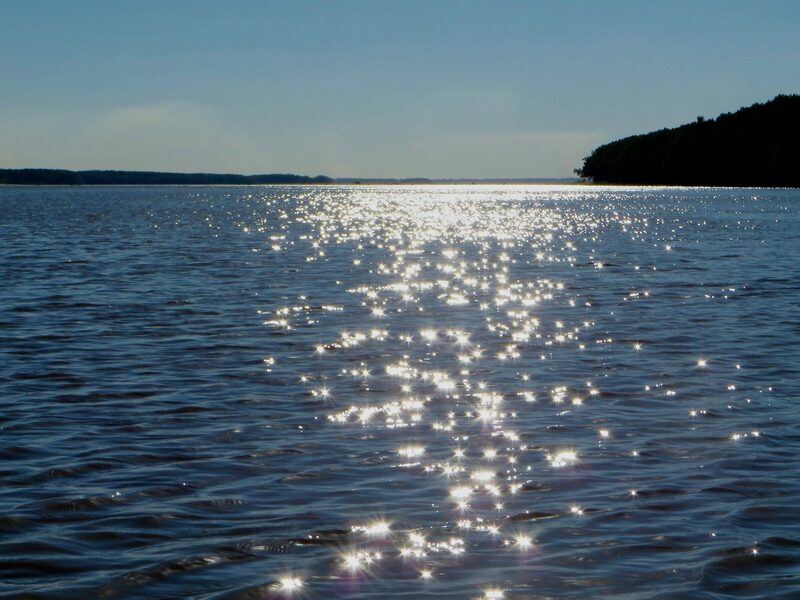 We chose to start in early August in order to enjoy relatively long days, avoid the worst of the heat as we headed south, travel when the water temperature was warm; and minimize the worst of the insects. This worked well for us and we have no regrets other than missing the autumn colors. 6 parties started in September. 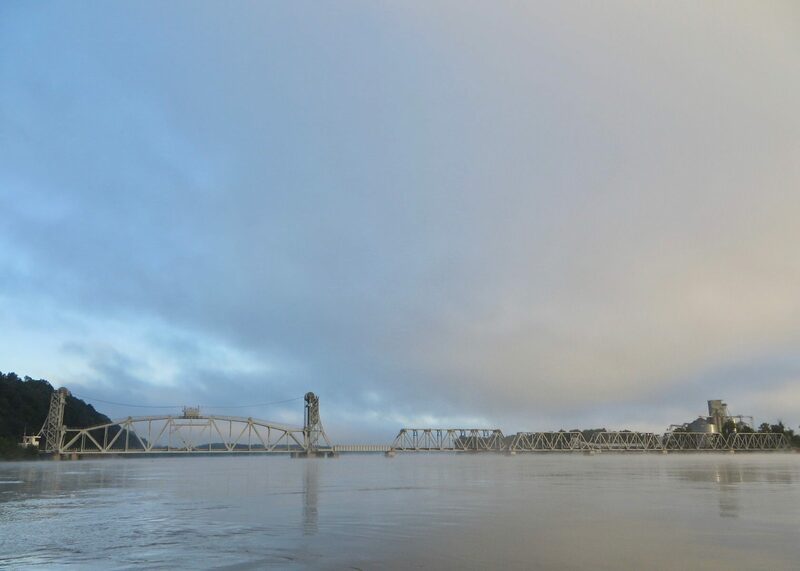 In 2014 one party attempted to start in mid April, but snow and ice forced them to begin at Grand Rapids instead of Lake Itasca. Due to the record-breaking cold streak in November 2014, the parties that started in September faced many frosty nights and many days where the daytime high temperatures were in the 30’s or 40’s. On the other hand, the parties that started in May had cold weather early in their trips. 16 people used two-man canoes (eight parties of two). 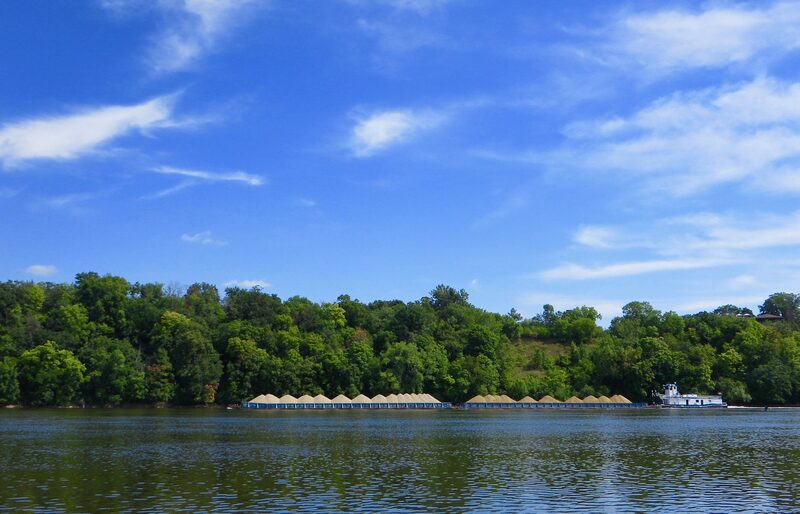 9 people used solo canoes (all were traveling solo). 2 people used a double kayak (one party of two). 18 people used single kayaks (in parties of one to four). 6 people used pairs of two-man rowboats (one party of four, and a second party of two that had guests join for short stints to fill the additional seats). We know of three parties in 2014 that had a ground crew. One was a group attempting to set a speed record. The second was a high-budget trip using rowboats and hotel accommodations. And the third had a professional film crew making a documentary movie. 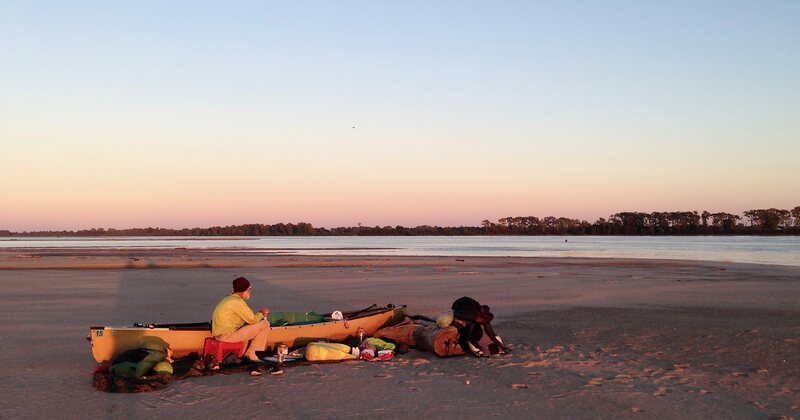 We believe that all other paddlers travelled without dedicated ground support. 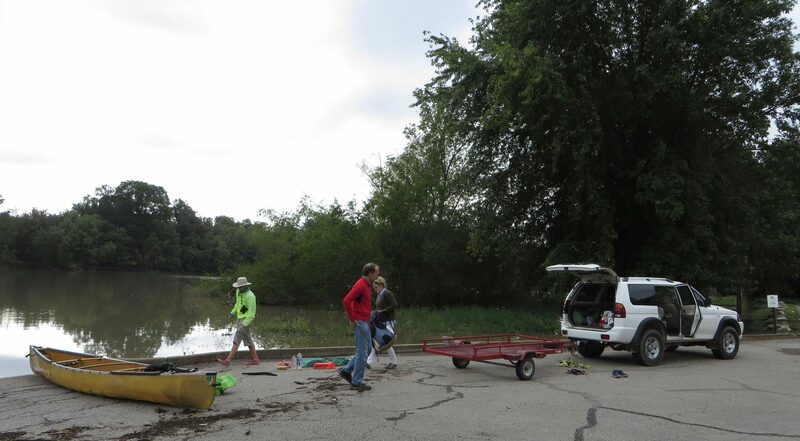 Parties with ground crews had numerous challenges connecting with ground crews when high water blocked vehicle access to boat ramps, or when weather and water conditions made it impossible to paddle to the pre-determined meeting place. 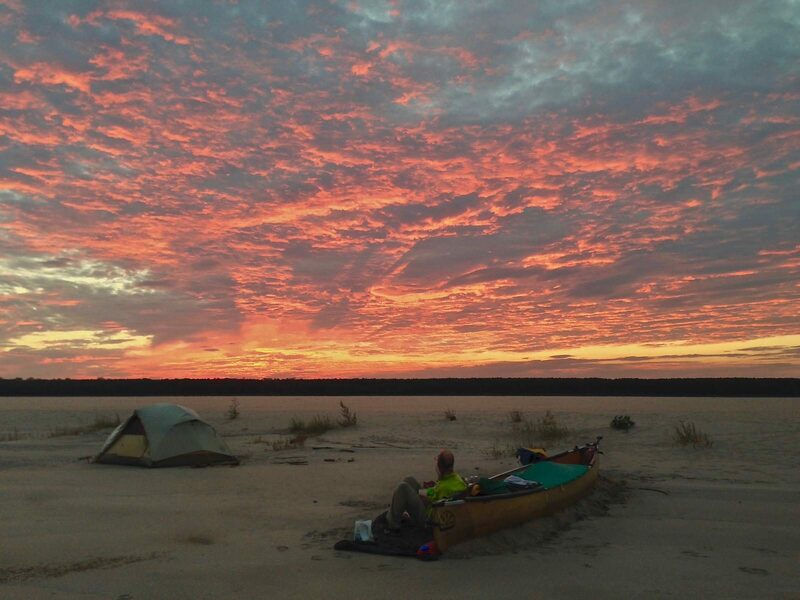 We believe the trip is actually easier self-supported than with a support crew; being self-contained allows one to paddle when conditions are favorable and stop anywhere when conditions are unfavorable. 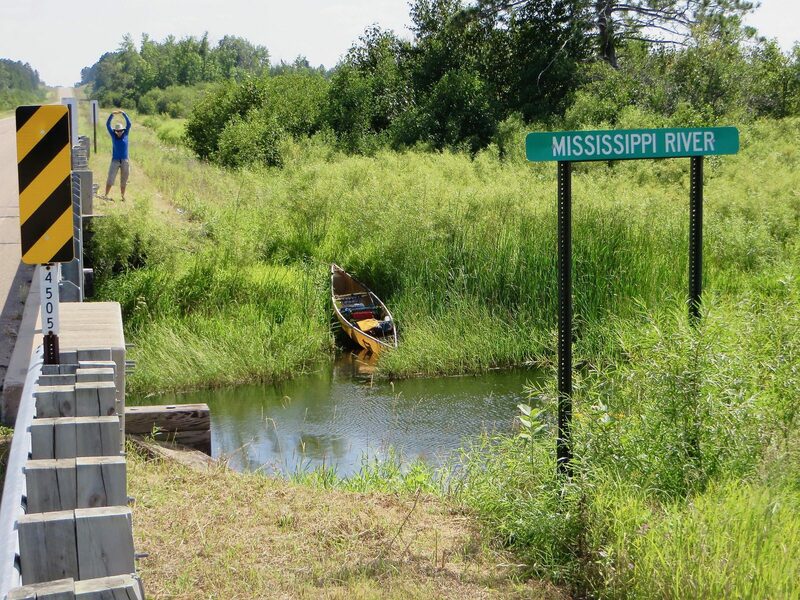 When we decided to paddle the Mississippi we owned neither canoe nor kayak and had no basis for choosing one over the other. We knew we wanted to share one boat, and initially considered a tandem kayak. However, we eventually decided that a canoe would be a better choice for the two of us. 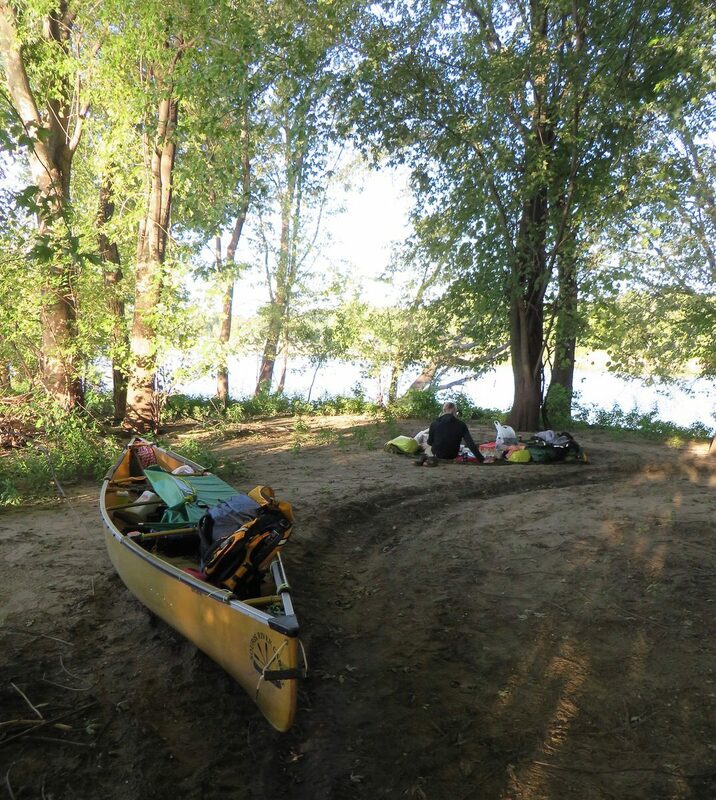 The key factors for us were ease of access to gear, ease of ingress and egress into the boat, multiple options for paddling position, and the smaller length and lighter weight of our chosen canoe than kayaks with equivalent capacity. We did not regret our choice at any point in the trip. 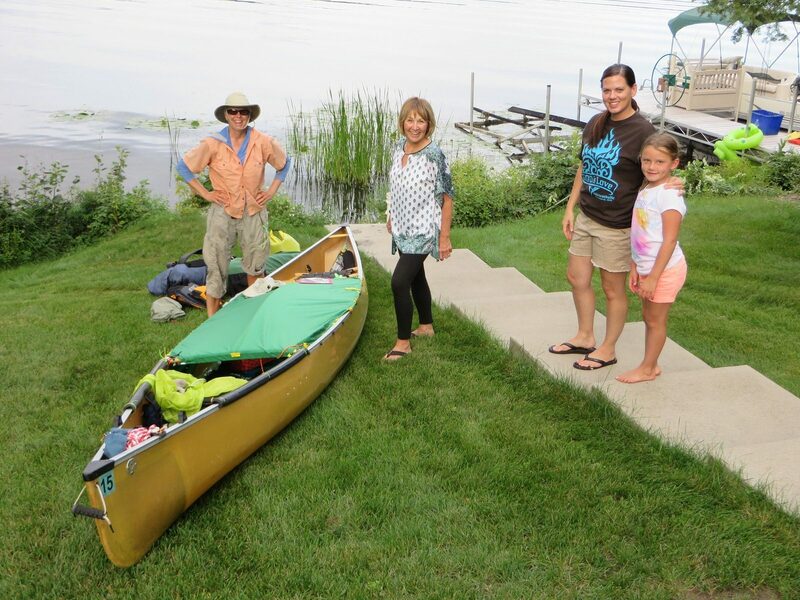 We bought a used Kevlar Souris River Quetico 17 canoe. 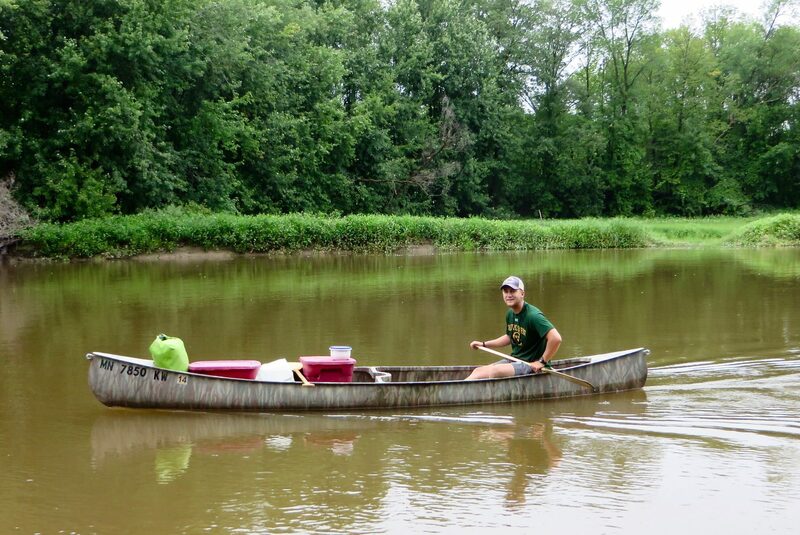 With various modifications we made to the boat, it weighed about 44 pounds, making it easy to carry on portages, to campsites, and at town stops. We are novice canoeists so cannot compare the performance of our boat against other canoes, but were extremely happy with the Quetico. We thought it was roomy, stable, fast, and easy to maneuver. In the roughest conditions we paddled, we only took on minor amounts of water which required just a sponge to bail out the boat. 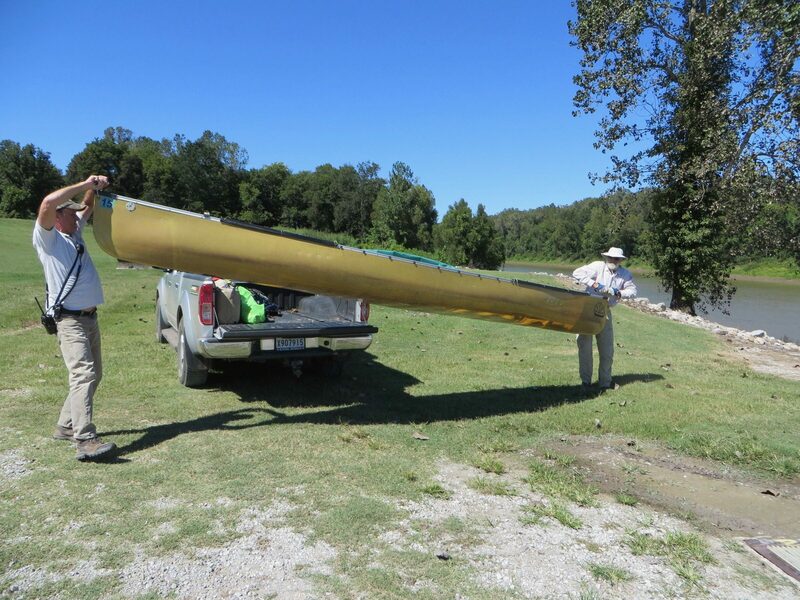 We designed and built a fabric cover that enclosed the center portion of the canoe. It was supported on a fiberglass wand attached to the two secondary thwarts. The cover shielded all of our gear from directly sunlight and shed a lot of the rain and splashing so less water collected in the canoe. It also helped deflect crosswinds that might have caught on the inside of the boat. The cover was very easy to attach and detach by using a cord that wrapped around small buttons we screwed to the gunwales. We were very pleased with the cover’s performance. We also bonded nylon tie down loops to the inside of the canoe and used them to clip a cargo net over all of our gear. This was very easy to attach and detach and enabled us to tightly secure our load to the bottom of the canoe so it could not shift around. We used Zaveral (ZRE) Power Surge Flatwater Medium paddles and we liked them a lot. Made of carbon fiber, these bent shaft models weighed about 10 ounces each. Given that a Mississippi trip will require well over a million individual paddle strokes, having a lightweight paddle made a difference. We used the same lightweight tent, pads, and sleeping quilt we use on our backpacking trips. We packed everything in light duty dry bags that we put inside lightweight frameless packs so we could easily portage our gear. 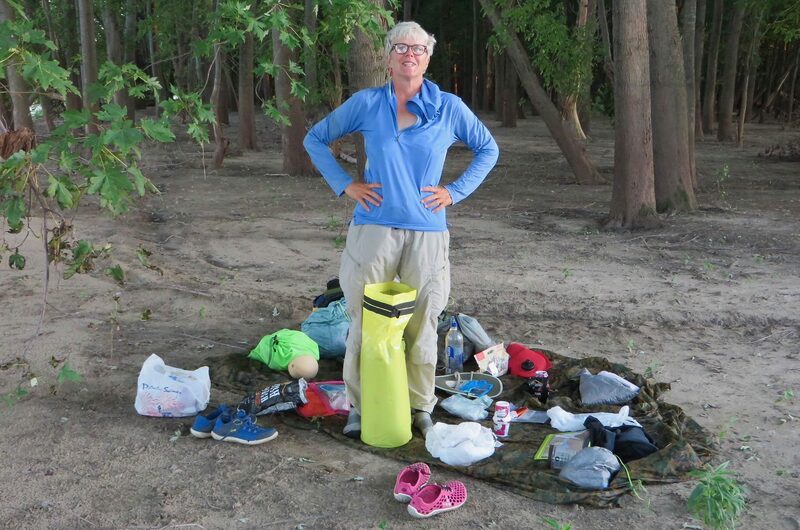 We carried our food in a 20-litre dry bag and a 30-litre mesh bag. We carried a SPOT tracker, two iPhones, an iPod, a marine radio, and a camera. We kept these charged with a Suntactics solar charger. 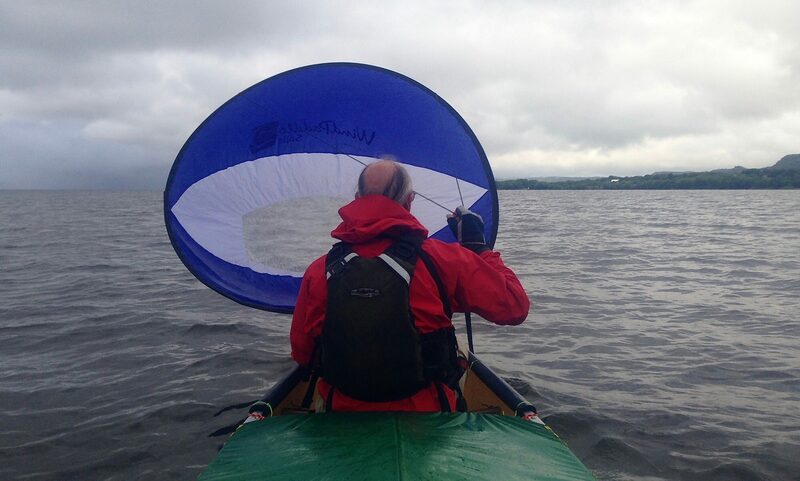 Many paddlers do not carry a VHF Marine Radio. We carried a Standard Horizon HX300, a model we chose simply because it was rechargeable via USB. We used the radio to communicate with the lockmasters, and it was worth it for that purpose alone. We also listened to channel 13, which is used by tow pilots to communicate with each other. After listening for a few weeks, and after learning from a retired barge deckhand that it is appropriate for recreational boats to speak on channel 13, we did communicate with tow pilots on a few occasions. Finally, the VHF radio is by far the most effective way to request assistance if you have a life-threatening emergency in the water. 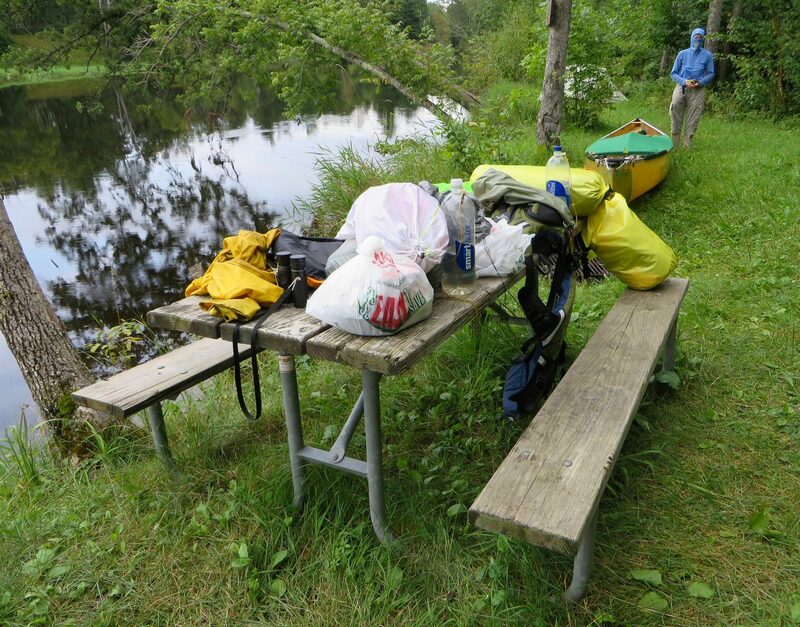 Our entire load, skin out, including canoe, paddles, electronics, camping gear, all clothing, repair kit, PDF’s, dry bags and so forth weighed 116 pounds. Food and water added to that. This is substantially heavier than our backpacking kit, but far lighter than the kits of most paddlers. In general, obtaining food along the river was relatively straightforward. 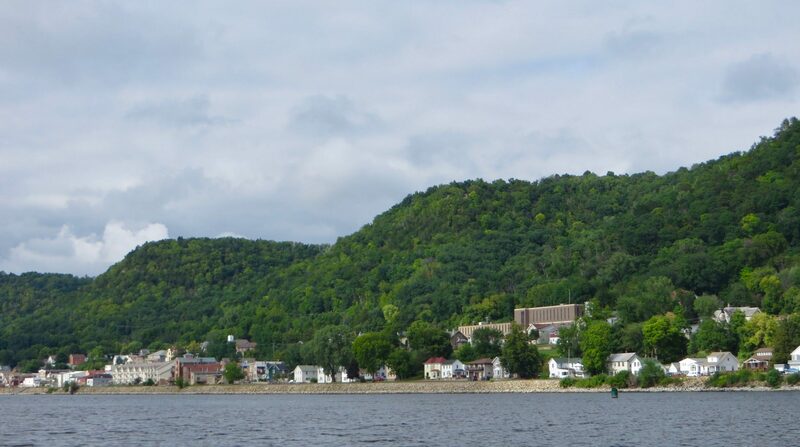 The longest stretch with no towns is the roughly 90 miles between Grand Rapids and Palisade in Minnesota. 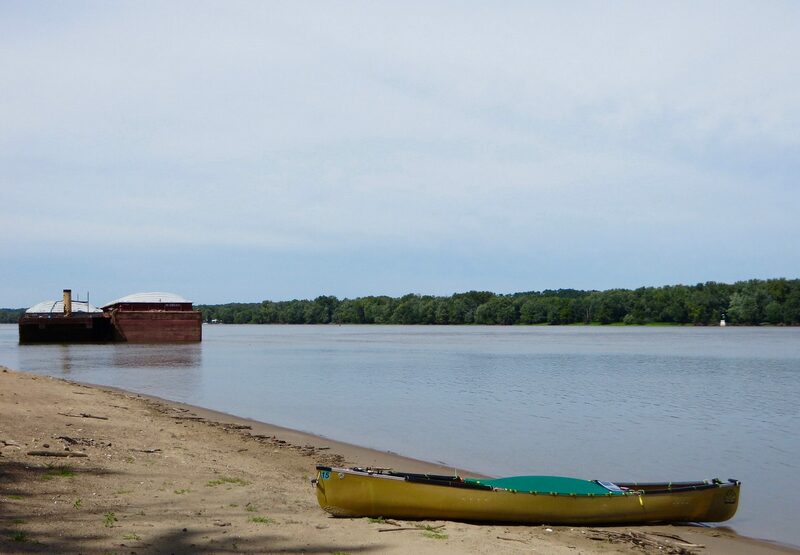 Between Lake Itasca and St. Louis, most of the river towns are small, close to the water, and easily accessible from the river. Stores and cafes are usually within easy walking distance. On the most northerly section of the river, some of these towns are very small so choices for places to eat and buy food are limited. Resupply gets more complicated south of St. Louis. The towns are protected by levees and frequently set well back from the river because the floodplain is so wide. 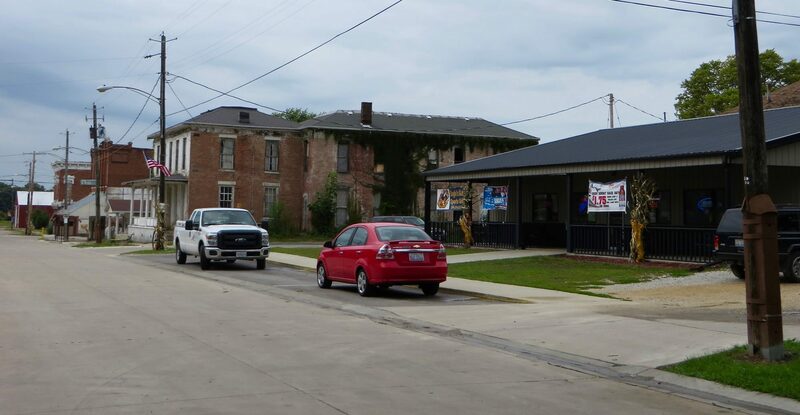 Commercial districts are historically located close to the river, but in many towns the main streets are commercially dead, killed by big-box stores at the outskirts of town. 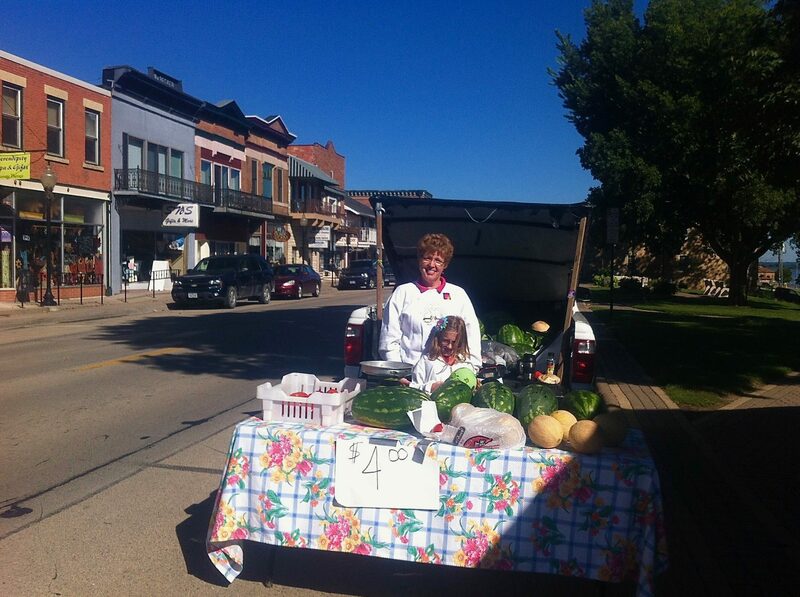 This means that in many towns there are no grocery stores in easy walking distance. 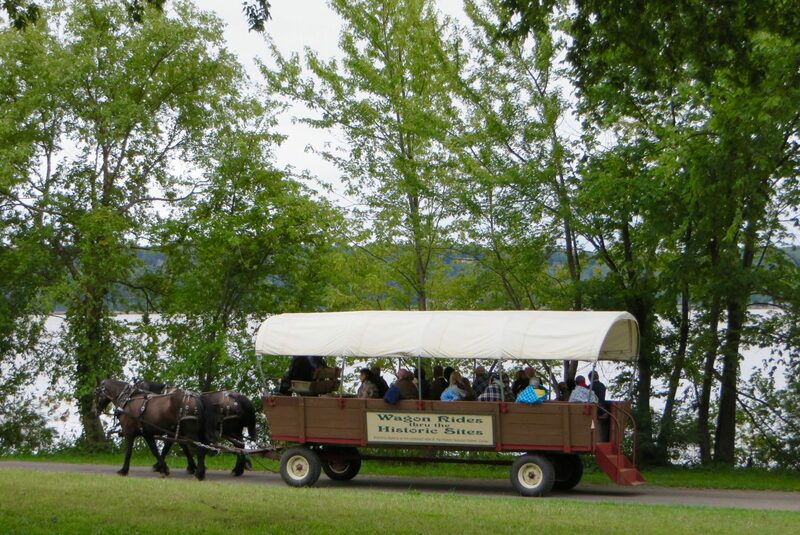 At many town stops, we were able to get to stores only because kind and generous people we met at the water’s edge offered us rides to the store and back. 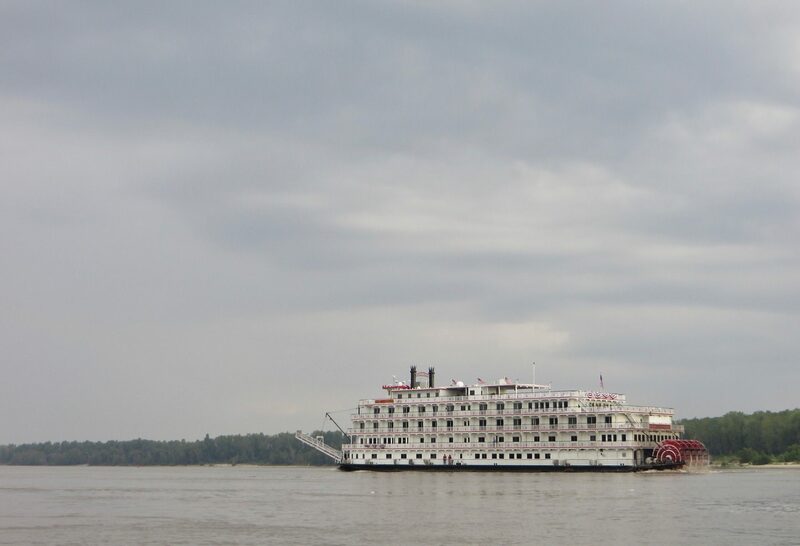 There are numerous big floating casinos along the river with inexpensive all-you-can-eat buffets; these were a great source of diverse calories. It was slightly weird being in these places, but nobody made a fuss when we river-rats showed up. We were always able to obtain drinking water from known clean sources and never drank water from the river. The river itself carries a lot of sediment for much of its length, so if you plan on filtering, you will have to deal with clogging. 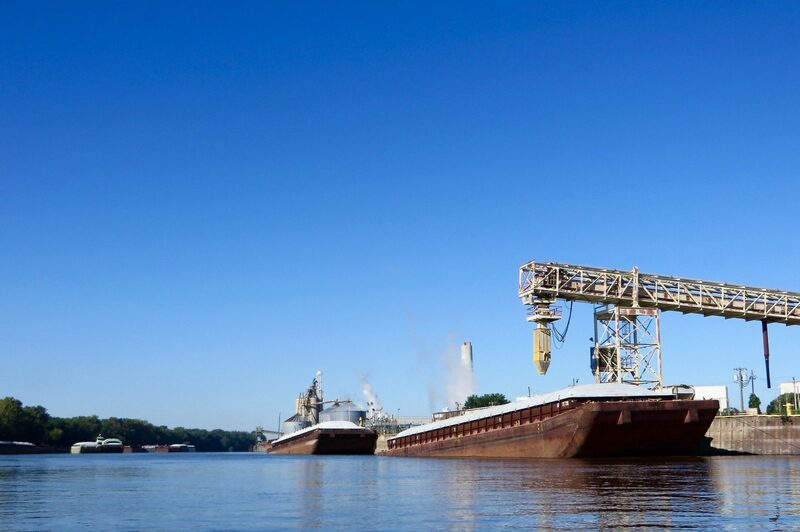 The Lower Mississippi also has a lot of runoff laced with agricultural and industrial chemical residues. We found water sources easily in towns and local campgrounds for most of the trip. We carried fifteen liters capacity for the two of us, and this was adequate for our needs until we reached Helena, Arkansas. South of Helena, where water sources are more widely spaced, we also carried a couple of gallon containers of grocery store drinking water. Not including the travel costs to get to Bemidji or to return home from New Iberia, our trip cost about $23 per person per day. We stayed in a hotel only once, and we paid for a campsite only once so the vast majority of our expenses were for food. We ate in restaurants or cafes at nearly every opportunity, about 20 times; the rest of our meals came from grocery stores. 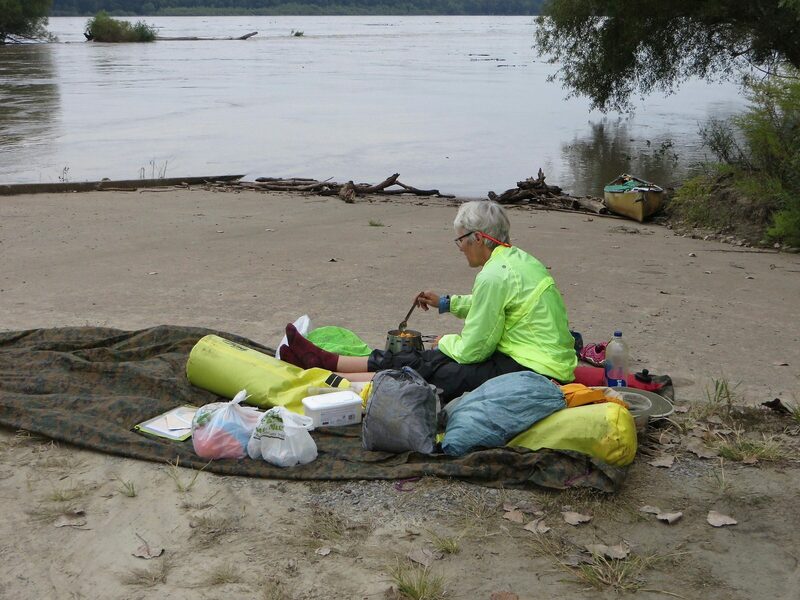 Camping along the river is one of the great pleasures of the journey and is necessary because there are long stretches with no commercial accommodations. We never had any significant problems finding at least adequate campsites, and frequently had five-star sites. 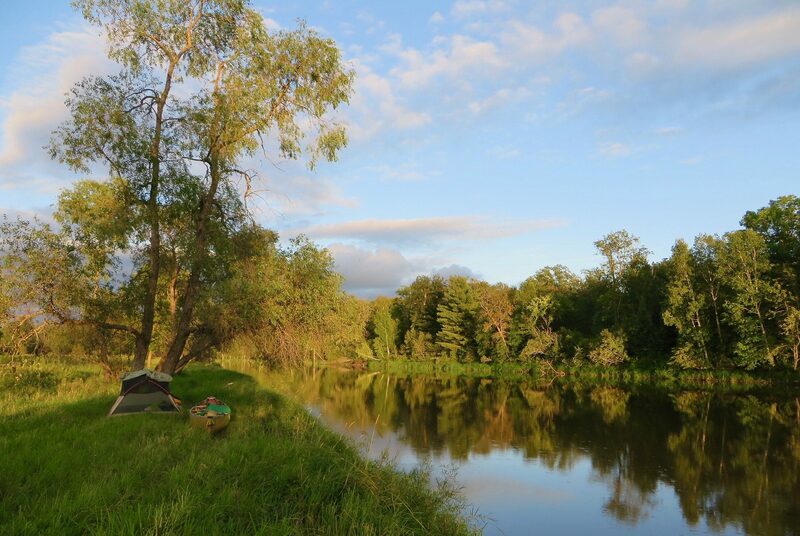 In Minnesota, the DNR has established a string of canoe camps along the river, many accessible only by boat. 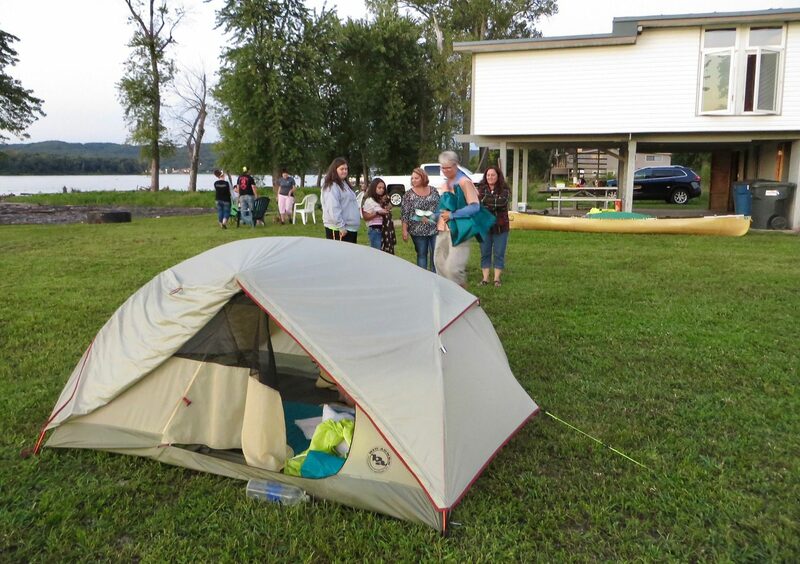 These vary in quality from tiny plots with barely room for a tent to sites with a shelter and pit toilet. There are also some commercial and public campgrounds further down the river and these are usually marked on the river maps. 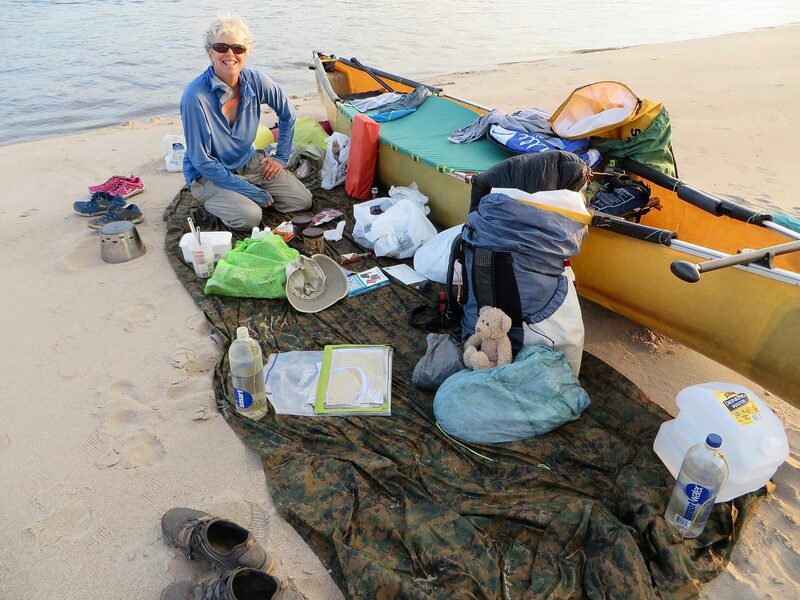 Usually, though, the paddler will need to improvise and find suitable rough campsites. 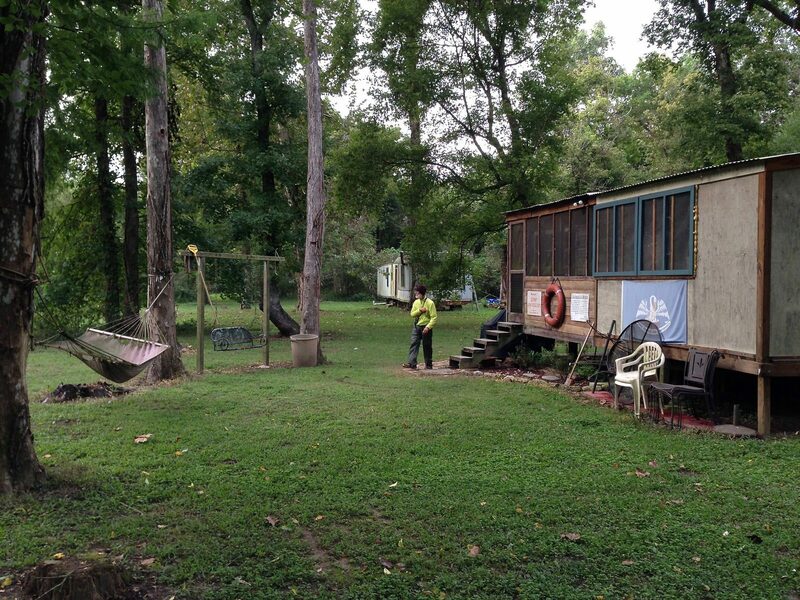 Long stretches of the Mississippi are in public ownership so riverside camping is quite legal. 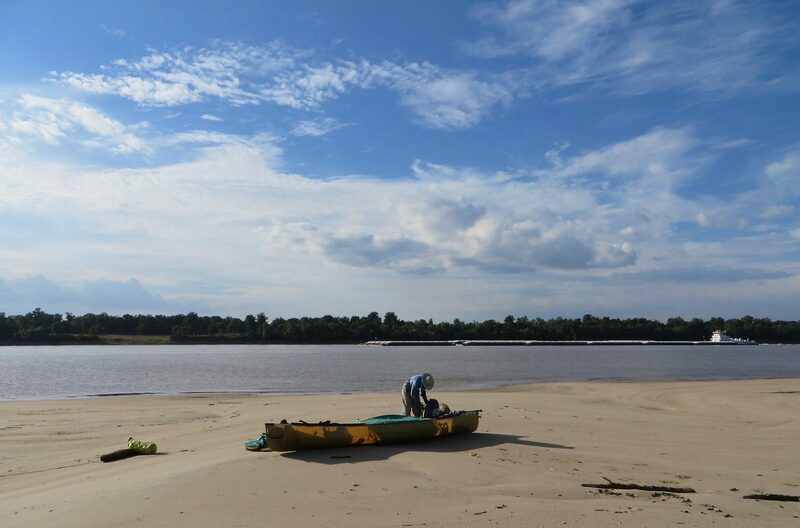 Along the lower river at normal water levels, a multitude of sandbars provide very fine places to camp. 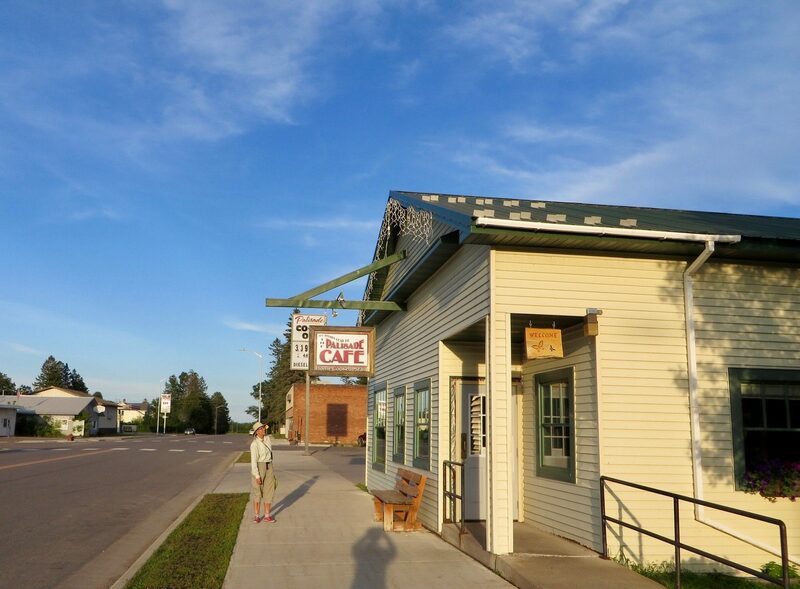 When we were in view of a building, we asked permission, which was cheerfully granted everywhere but in downtown Bemidji; otherwise we simply set up camp. Nobody ever questioned our use of any place we camped, and we were often welcomed with open arms and good company. 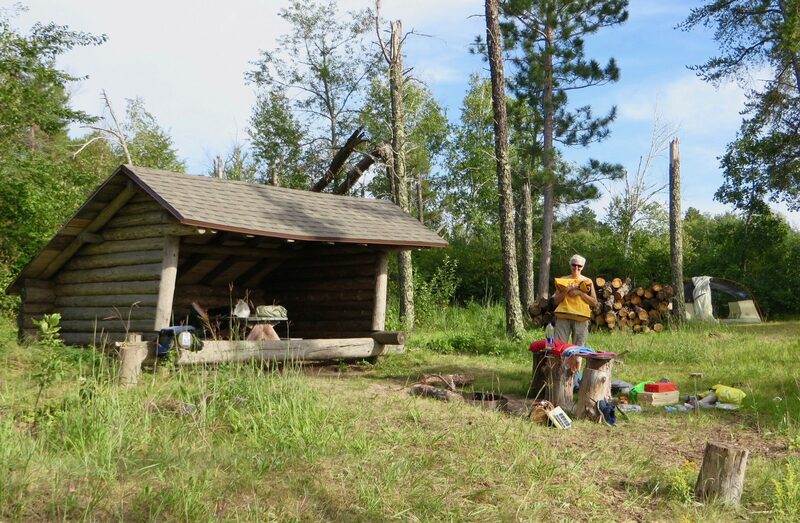 The usual camping rules apply: leave no trash; don’t make new fire rings; be extremely careful with fires if you build them; don’t cut vegetation; don’t make a lot of noise; leave the place cleaner than you found it. The river may rise while you are sleeping, so set up high enough where you won’t be awakened by water sloshing into your tent. 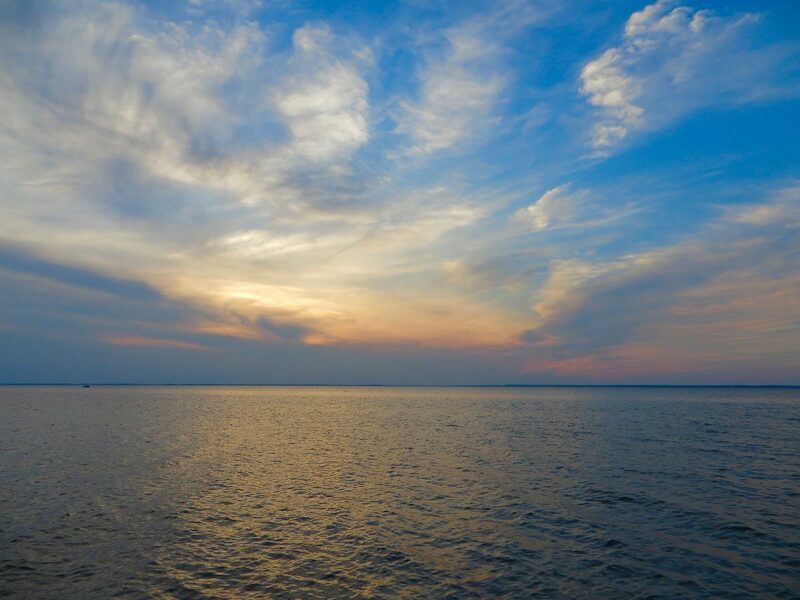 Make sure that your boat is well above any possible rising water, including waves created by passing nighttime tows, or tie it securely to something that cannot possibly wash away, or preferably, both. There have been paddlers whose boats washed away during the night and this can really mess up a trip. 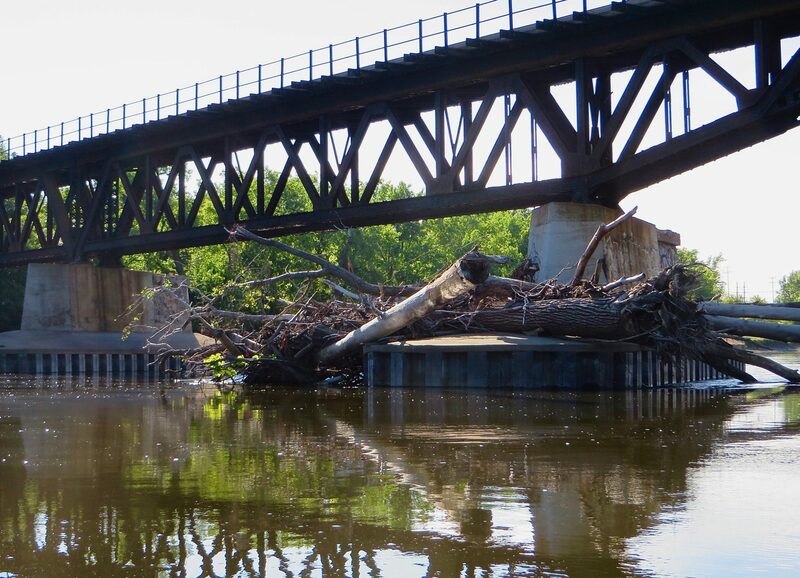 Between Lake Itasca and Bemidji, there are beaver dams and downed trees blocking the river. We were able to push and/or drag our canoe over all of the beaver dams. Water levels will affect your experience at these dams. The number and location of fallen trees varies over the years. In some places other river users had come through with chainsaws and removed some of these obstacles. 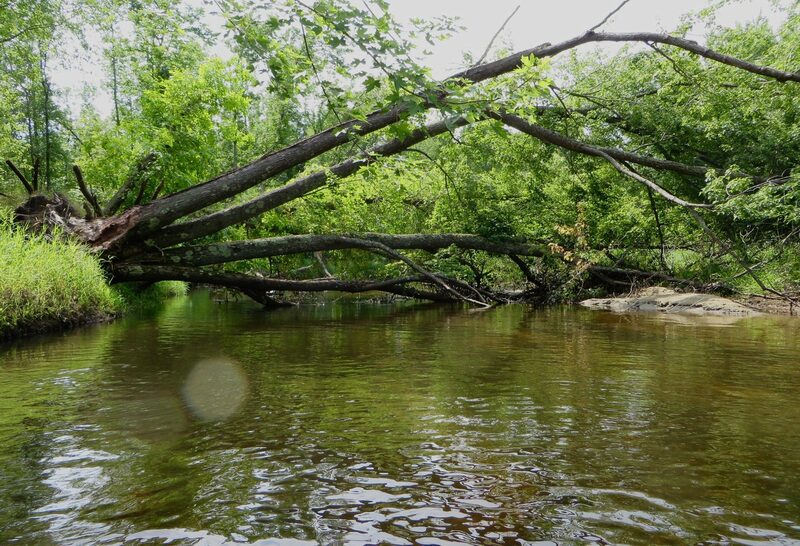 We were able to run or drag our canoe over some of the trees and had to portage our boat up the bank and around others. Getting trapped by these obstacles could be possible in high water conditions so caution is advised. 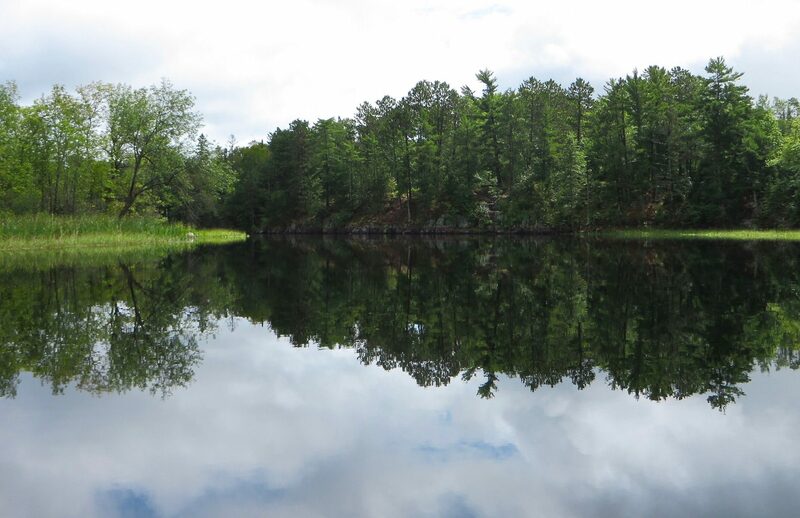 Vekin’s Dam is an ancient low wood and rock logging dam about seven miles from Lake Itasca; it requires a short portage. 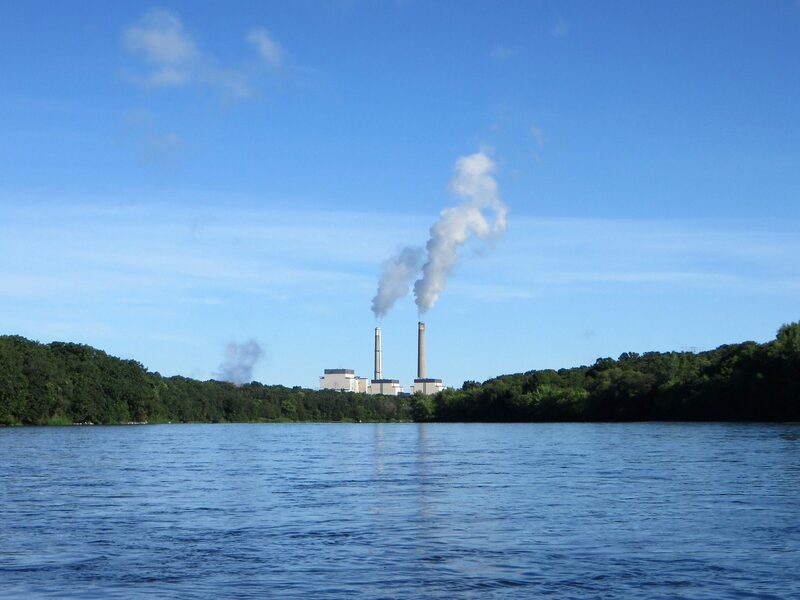 Below Bemidji, there are eleven man-made dams that must be portaged. Behind these dams are lakes of varying size; there was no current in these lakes so paddling required more work than on the open river. Most recreational use along this portion of the river was in these lakes. The portage routes are marked on the Minnesota DNR maps. The portages ranged from simple to real pains. 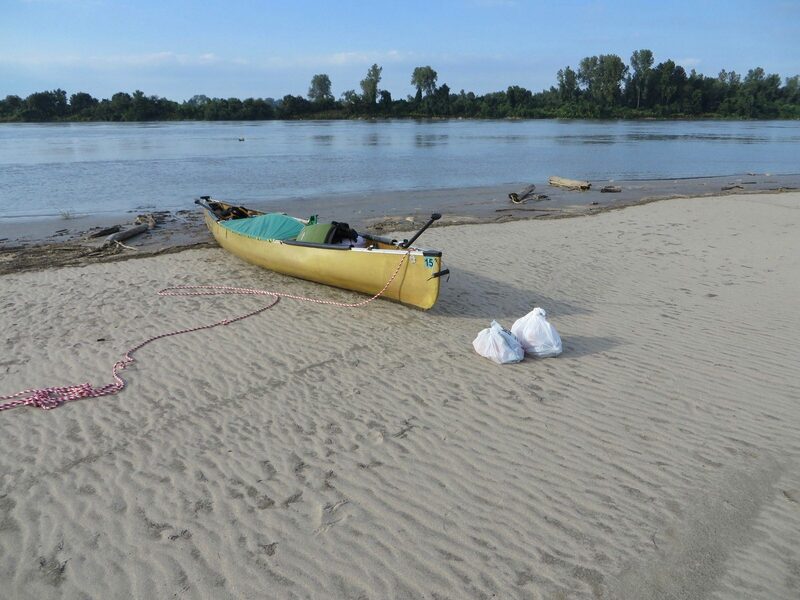 Problems included: unmarked take-outs and put-ins; take-outs and put-ins that were essentially piles of big rocks with no sandy place to land or launch your boat; unmaintained portage trails that were wet, muddy, steep, and/or had encroaching vegetation. Some portages require traveling on pavement through towns and crossing busy streets. 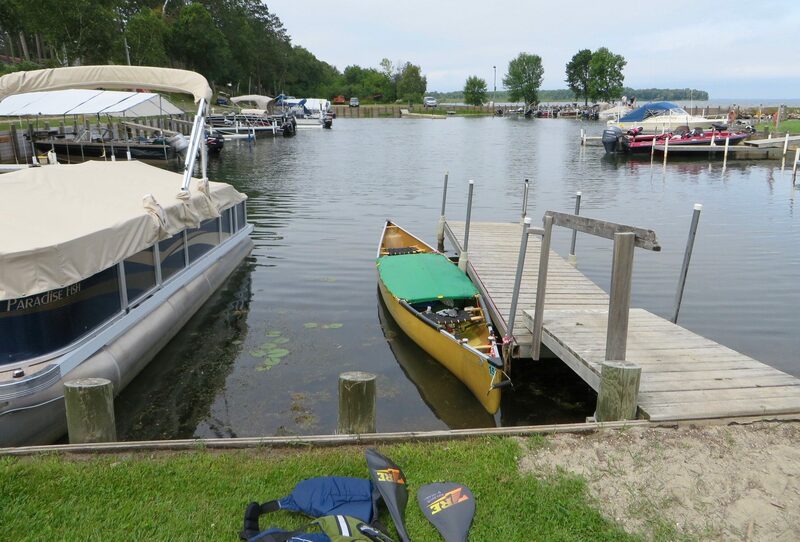 The first portage is at the exit of Cass Lake at Knutson Dam. 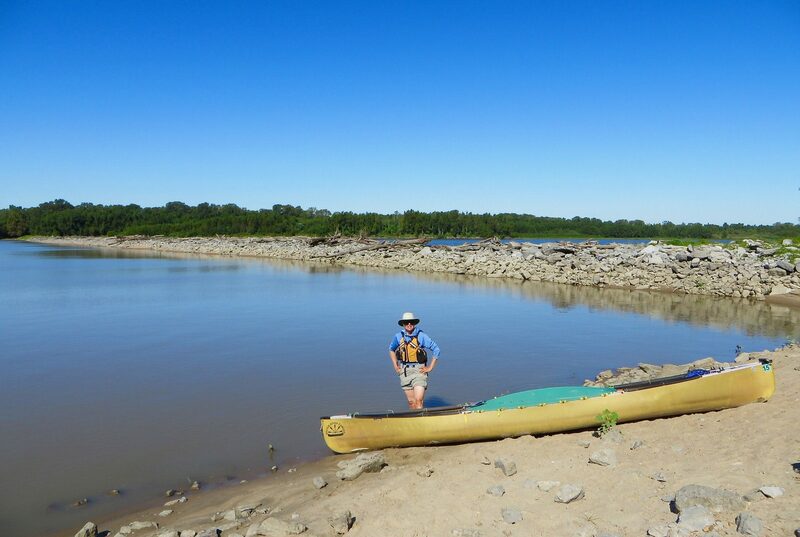 Depending on the water level, you may be able to paddle over the shallow spillway; we did this, but scout from shore carefully ahead of time. 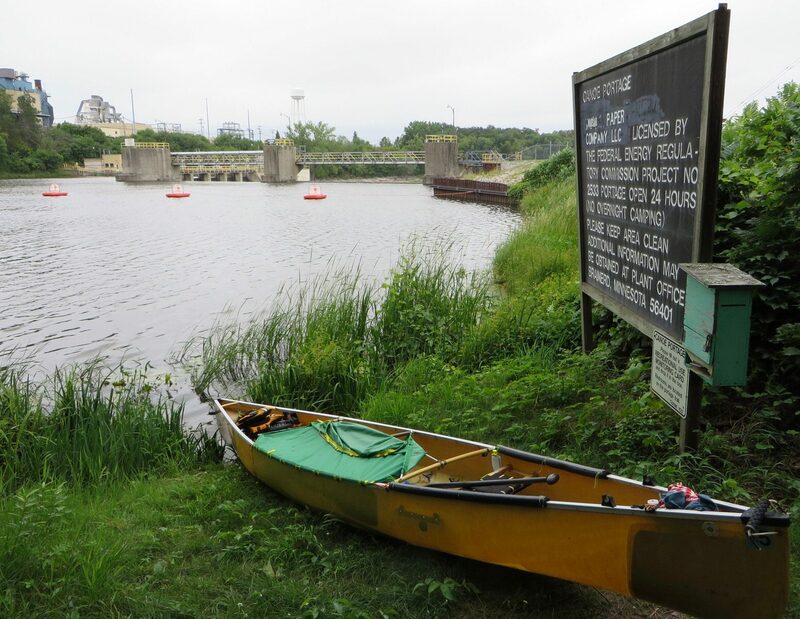 In Grand Rapids, the Blandon Dam operates a free portage service. 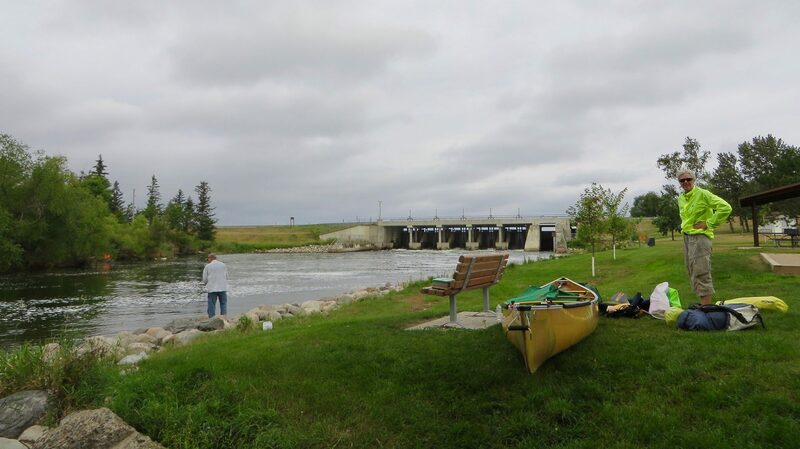 Prior to getting to Grand Rapids and about 2.7 miles below Cohasset, you arrive at the Pokegamma Dam. At this dam there is a signboard offering portage service from either here or from Sylvan Lake in Grand Rapids. There is a phone number on the sign: call and make arrangements with the dam’s management. 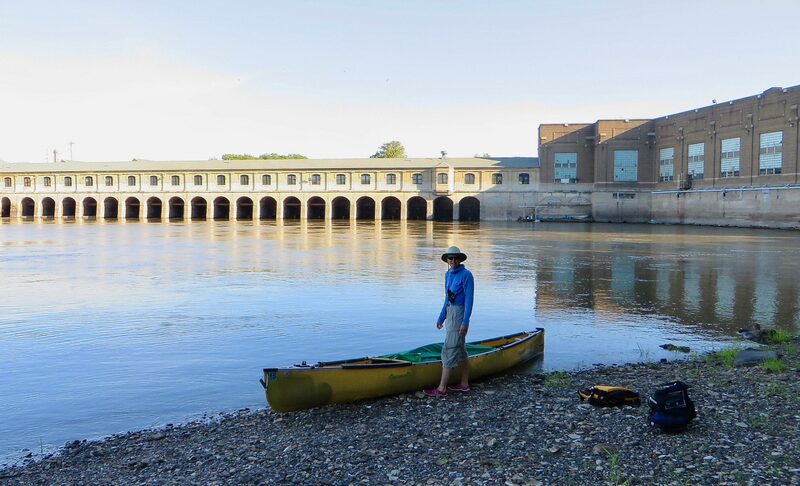 You could get a ride around both dams, but then you will miss paddling to Grand Rapids. 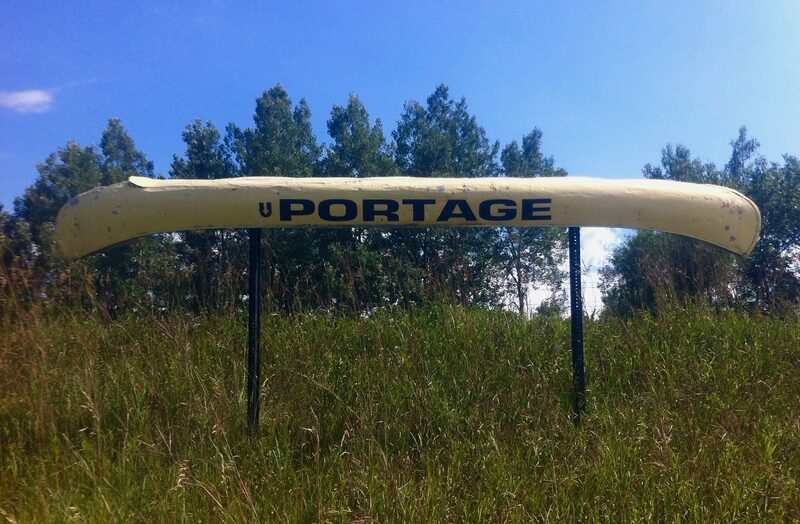 The portage at Pokegamma Dam is just a couple of hundred yards and is easy. The portage in Grand Rapids is over 1.5 miles and crosses a very busy street. 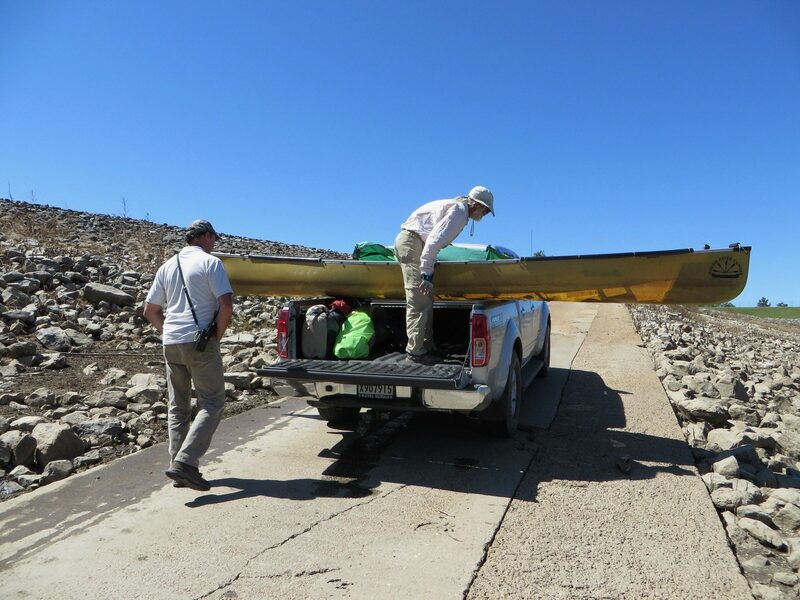 We used the service in Grand Rapids; a friendly driver showed up at the take-out with a canoe trailer and helped us load our gear and drove us to the put-in below the dam. He then gave James a ride to the grocery store. 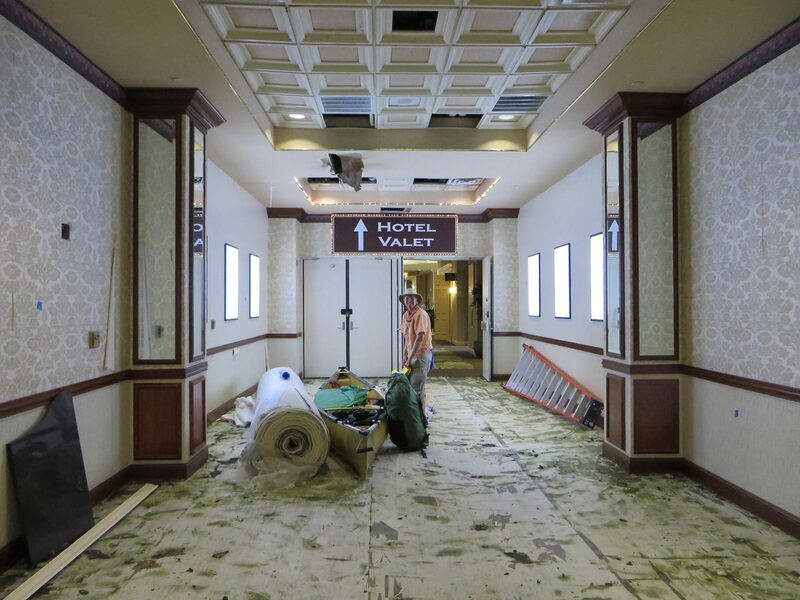 In Sartell, you portage across the parking lot of the Riverside Depot café. You can stash your gear behind the very friendly café and stop in for a meal; their Battleship Burger is our lifetime favorite burger. Be very cautious at the Blanchard Dam portage; this was the most difficult portage, with some people reporting taking three hours to complete it. You will have to carry your gear almost 2000 feet and, in doing so, climb up and down several steep embankments with very loose footing. Some people portage the short section of rapids below the town of Sauk Rapids. These are rated Class 1 to 3 depending on water levels. We were able to run them without incident on river right. 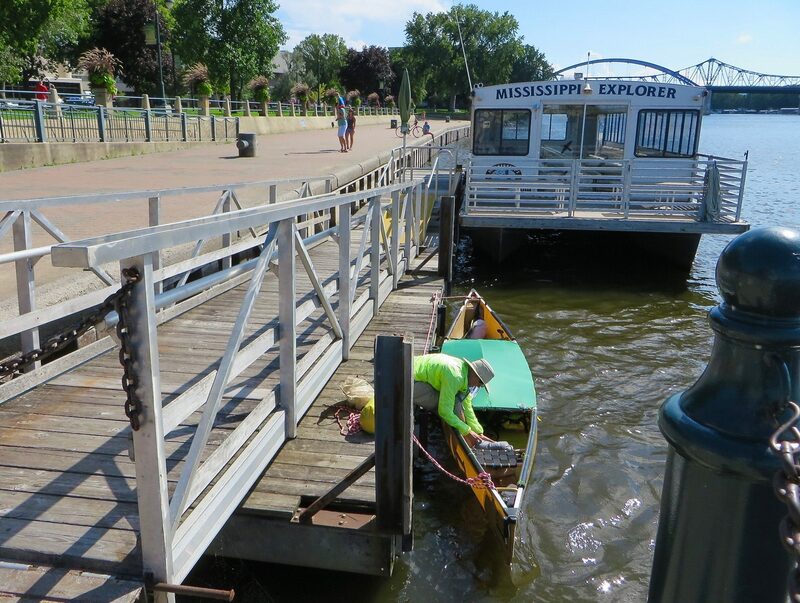 Portaging some locks on the Middle Mississippi is possible, but not required. 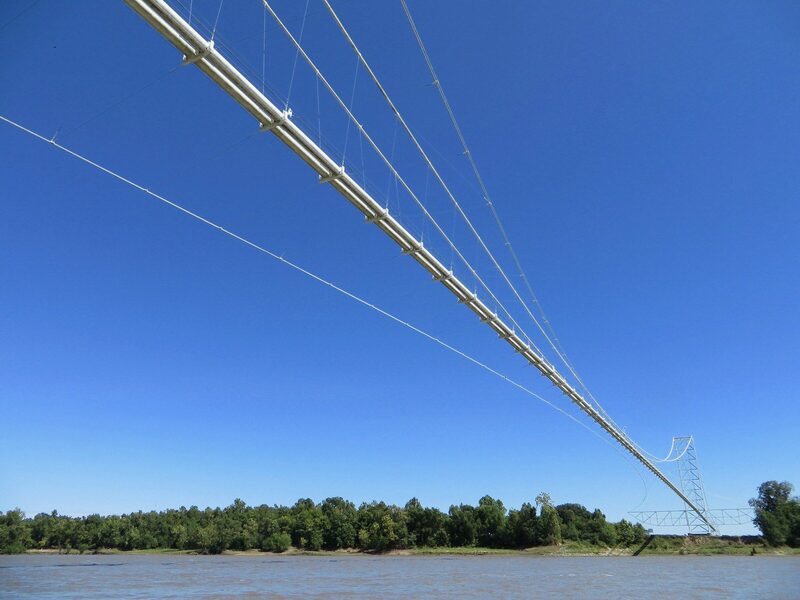 Portaging on the Lower Mississippi is limited to voluntary crossing of wing dams or emergent sandbars while using back channels. There are no portages on the main channel. 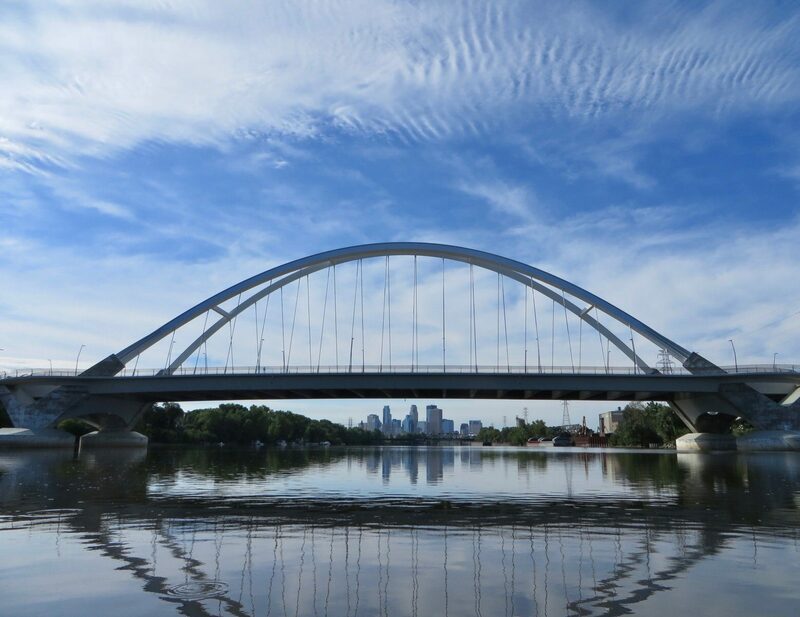 Between Minneapolis and St. Louis, the Army Corps of Engineers has constructed 29 sets of locks and dams. 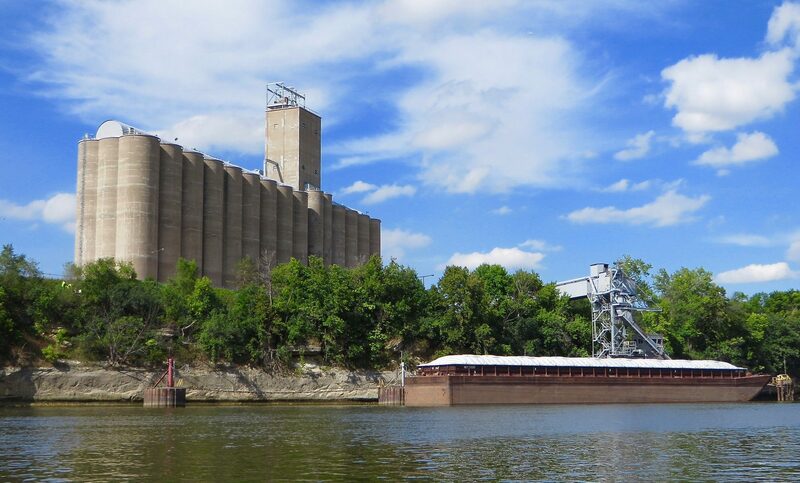 The most northerly lock, Upper St. Anthony Falls in Minneapolis, was decommissioned in the spring of 2015. 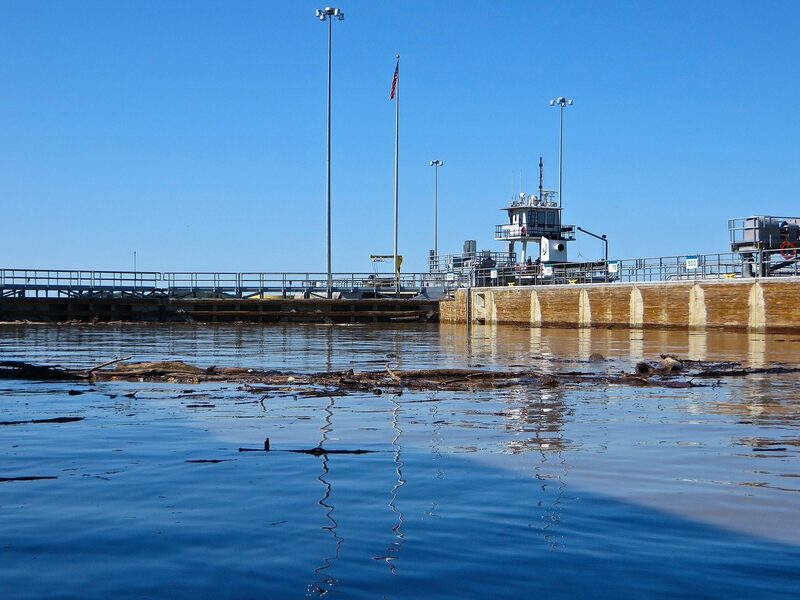 Operations hours of the Lower St. Anthony Lock may be reduced as well. As of 2016, the portage options were unclear and were still being discussed by various interest groups. The Mississippi River Paddlers Facebook group should be a good source of current information. There is also a local portage service operated by the Paddle Taxi. You must either transit a lock or portage around it. 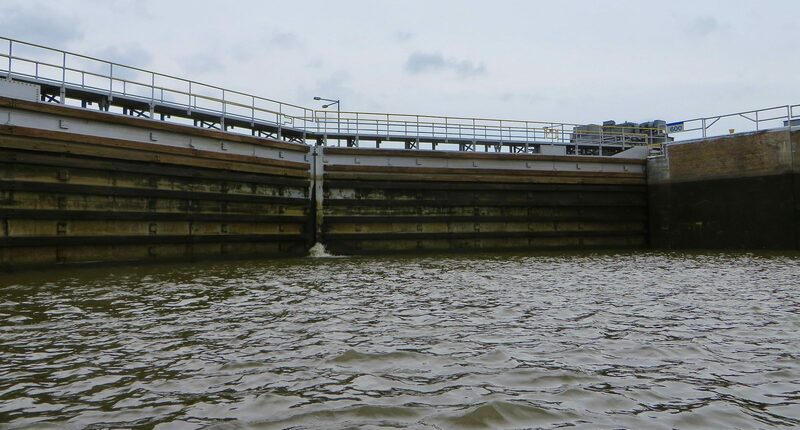 At many locks, portaging would be difficult or impossible as there is frequently no place near the lock to take out or put in and the lock complexes themselves are more than ½ mile long. 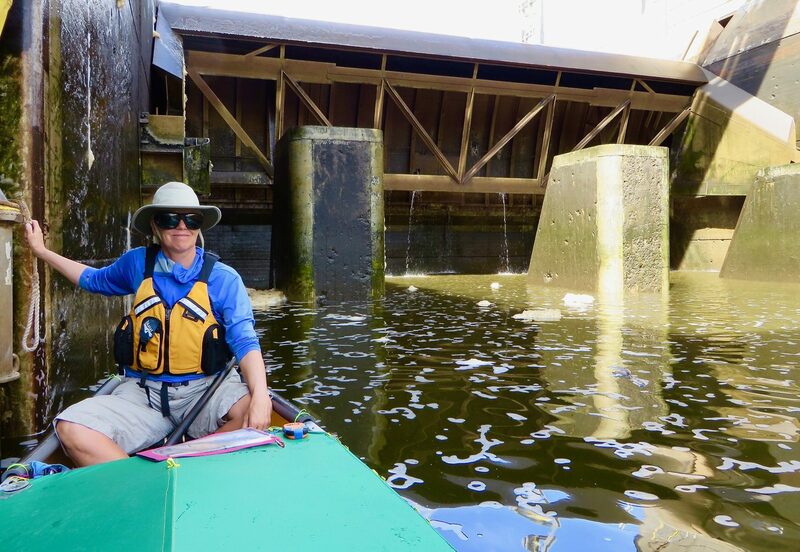 By studying maps and satellite images, it might be possible to plan to portage some locks by using side channels. 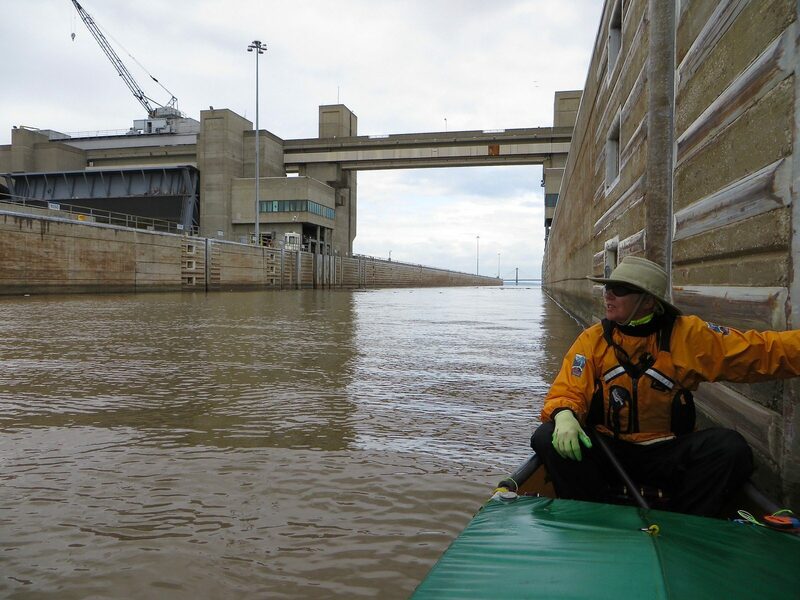 If you plan to try this, remember that maps and satellite images may not match the water level when you are at the lock, so what may look possible on paper may be difficult or impossible in reality. For example, a spillway may be a viable portage at low water, but be a very dangerous place at high water. Using a marine radio you can ask about portage options when you speak with the lockmaster. 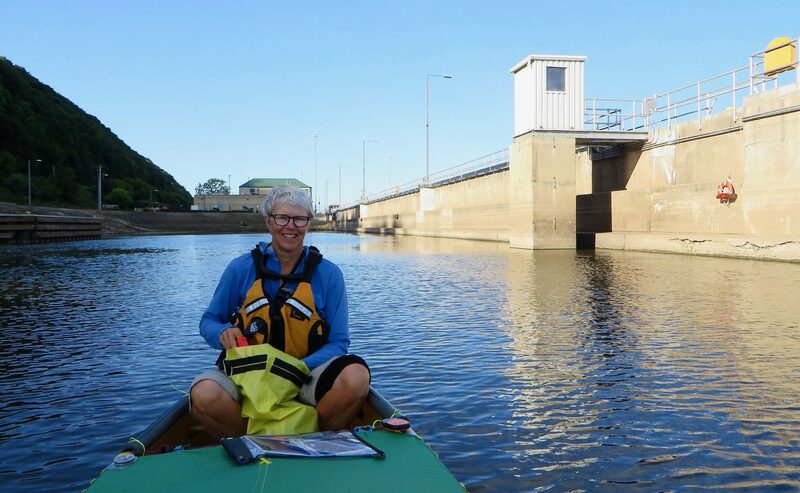 After consulting with the lockmaster, we portaged Lock 17 over the river left spillway as conditions were perfect and there was a tow in the lock when we arrived. The vast majority of paddlers use the locks. There are three exceptions described at the end of this section. The locks were constructed when the Army Corps of Engineers built dams to create lakes to maintain consistent water depth for shipping. The locks allow boats to transit the dams, and use of them is free and available to any type of craft using the river. 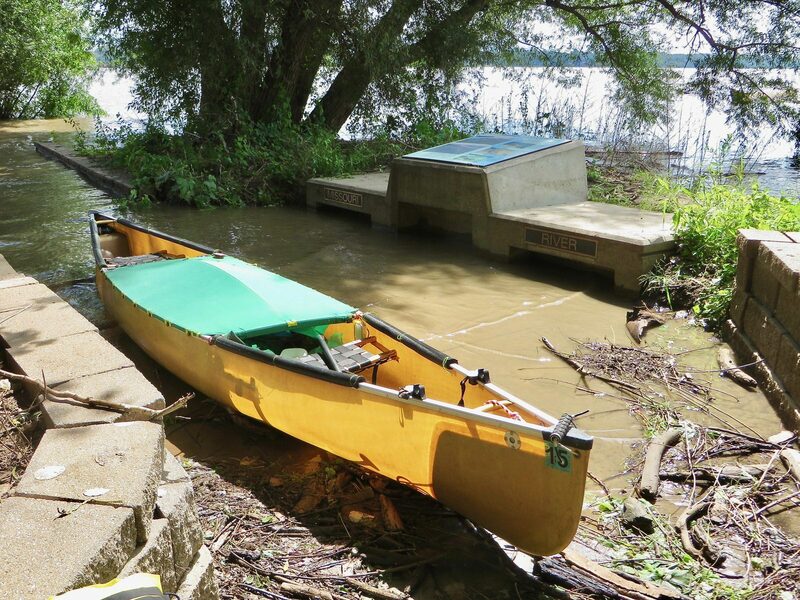 Kayaks and canoes have the same rights to passage as tows and private powerboats. There is a pecking order and commercial traffic has priority over recreational traffic, which sometimes can mean a long wait to use a lock. It can take a tow between one and two hours to transit a lock, so if one arrives just before you do, you are in for a long delay. On our trip we had mostly good fortune with the locks and only had to wait for more than half an hour on a few occasions; we had many “drive-thru” transits with no wait at all. After approaching the lock, you find a place to hang out near the end of the long wall where you can see a traffic signal light. Depending on the winds, this may not be as simple as it sounds as there is rarely a place to tie up. When the lock is ready to receive you, the light will turn green. 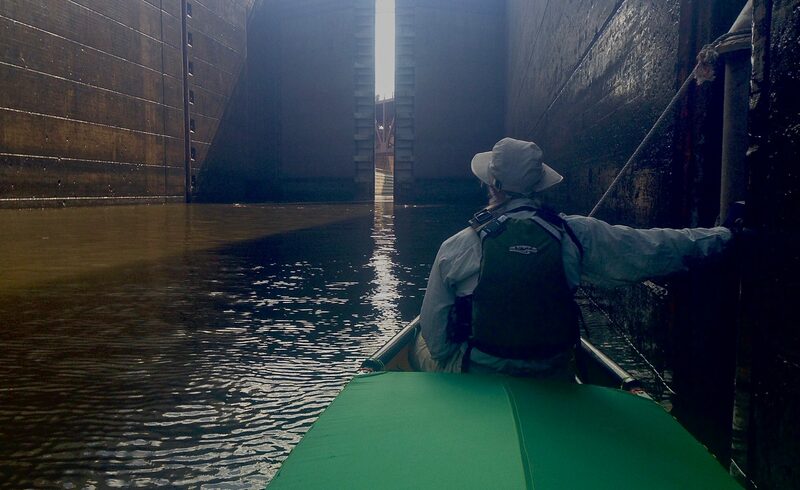 You paddle in through the open upstream gates and usually a lock staff member will direct you to a particular point and drop you a line to hold. There may be other recreational craft in the lock with you, but you will not share it with tows. 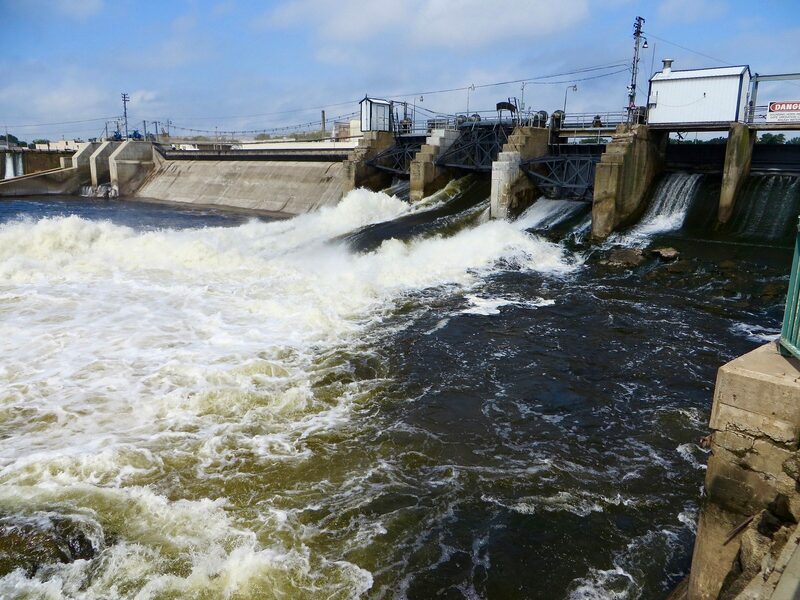 After everyone is stable, the upstream gates are closed, the water level is slowly lowered to match that of the downstream river, and the downstream gates are then opened. When the lockmaster is satisfied that all is well, he will sound a loud horn signaling that it is now safe to let go of the line and paddle out. Do so immediately and get out of the way of the downstream lock entrance as quickly as possible. Do not tie off on anything in the lock or you may be dumped out of your boat and it will be left dangling as the water drops. Although in some locks the water level only changes by a foot or so, in others the drop is as much as fifty feet. If a tow is exiting a lock as you arrive, do not approach the long wall until the tow is completely clear of it. The tow will generate massive waves in the narrow confines near the long wall that could easily swamp your boat. We found the lock staffs, civilian employees of the Army Corps of Engineers, to be generally very friendly, interested in our journey and helpful. 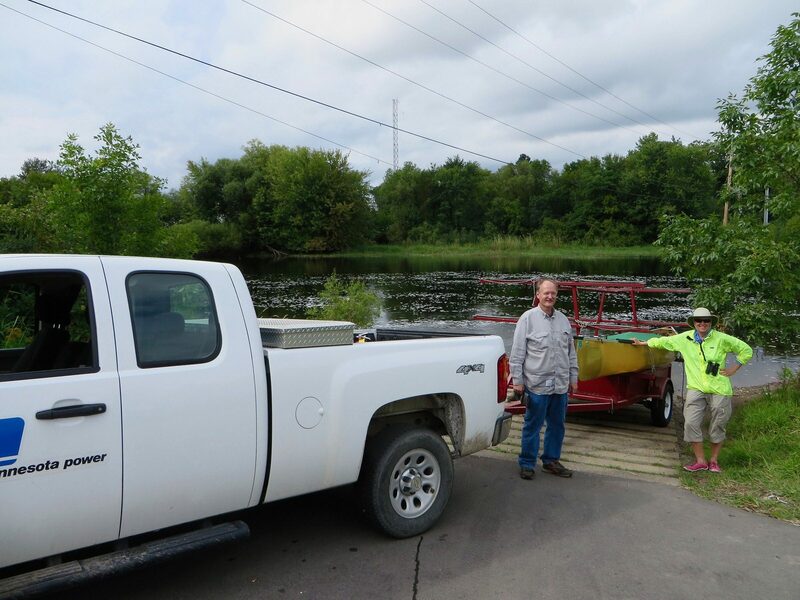 On three occasions staff members actually used their own vehicles to portage us around locks that had long delays due to the presence of tows. They helped us get our canoe out of the water, transported us to an appropriate put in, and helped us get back on the water. Nice people. There are three locks where there are easy options to transiting the main lock. At Lock 14, there is, on river right, a back channel through a marina that leads to a small auxiliary lock. Since the auxiliary lock only transits small craft, you will not be delayed by tows; it is worth using this option. At Lock 15, there is a back channel on river left that goes around Rock Island. 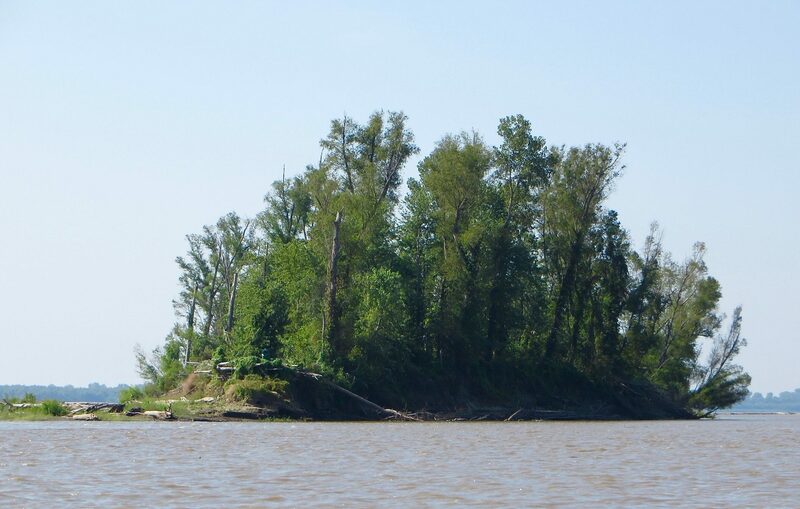 Once in the channel, you will pass smaller Sylvan Island and soon see a dam. 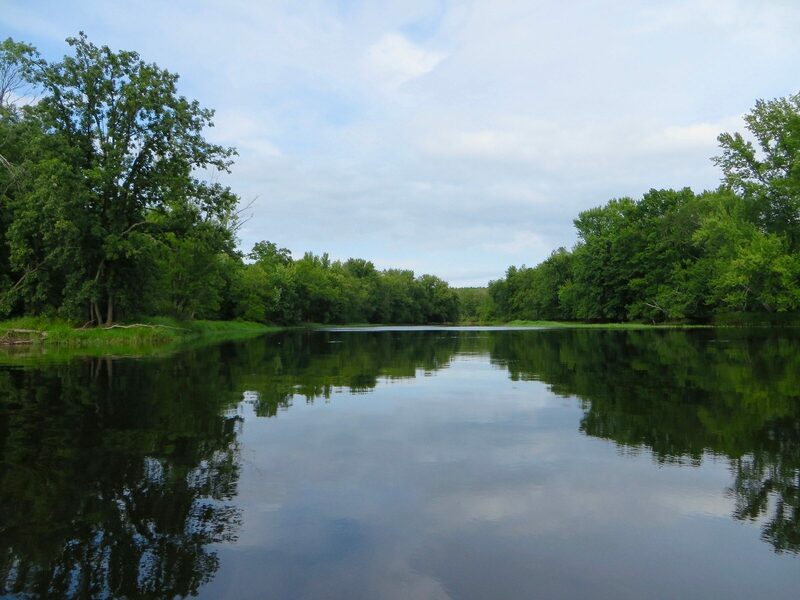 There is an easy and short portage river left before you reach the dam: climb up a short set of rocky steps and follow a marked trail around the dam. 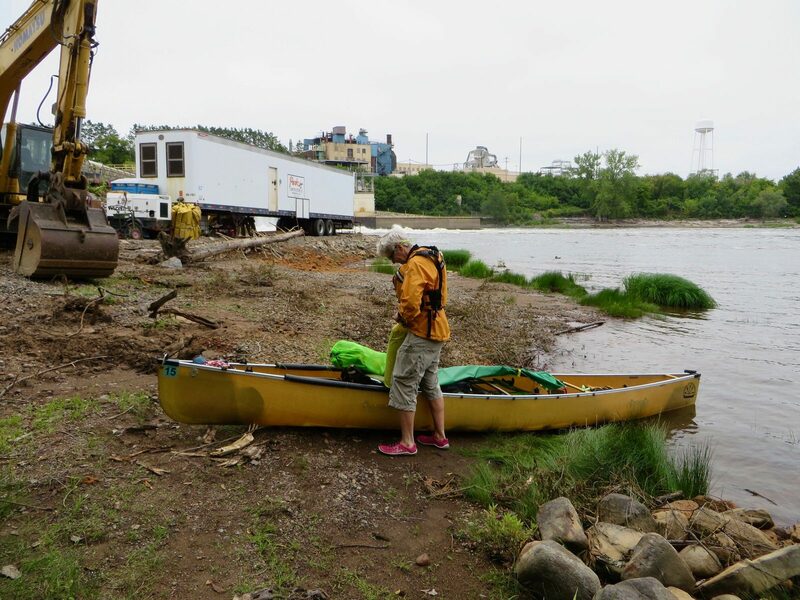 After the portage, a short paddle brings you back to the main river downstream from Lock 15. 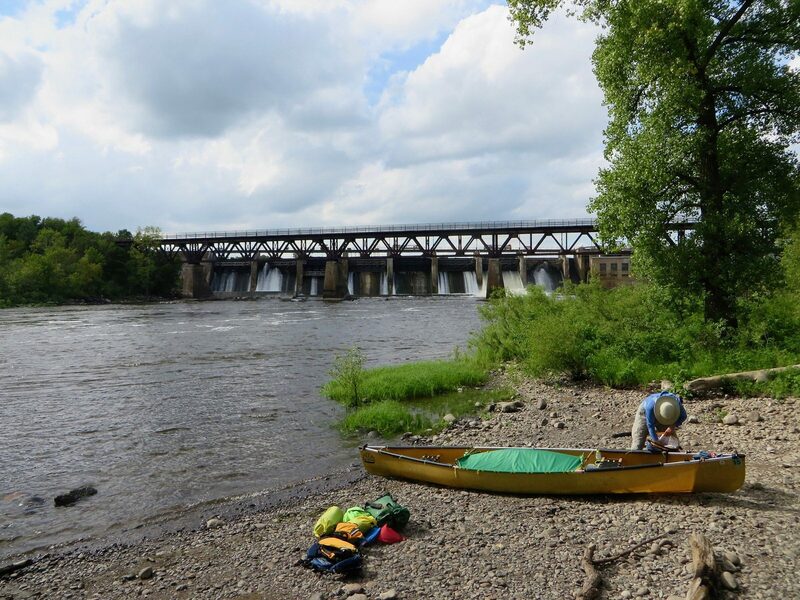 Given how much river traffic there is in this area, we chose to take the portage route rather than risk a long delay. Finally, at Lock 27, the last on the river, there is a better way downriver than transiting the lock. The problem at Lock 27 is that to approach it, you must first paddle an 8-mile long rock-lined man-made channel. There is no shelter here from tows, which will be very close due to the narrow width of the channel. If you stay in the river instead, there is single obstacle: the Chain of Rocks. This is a partially natural and partially man made rocky barrier that stretches across the entire river. 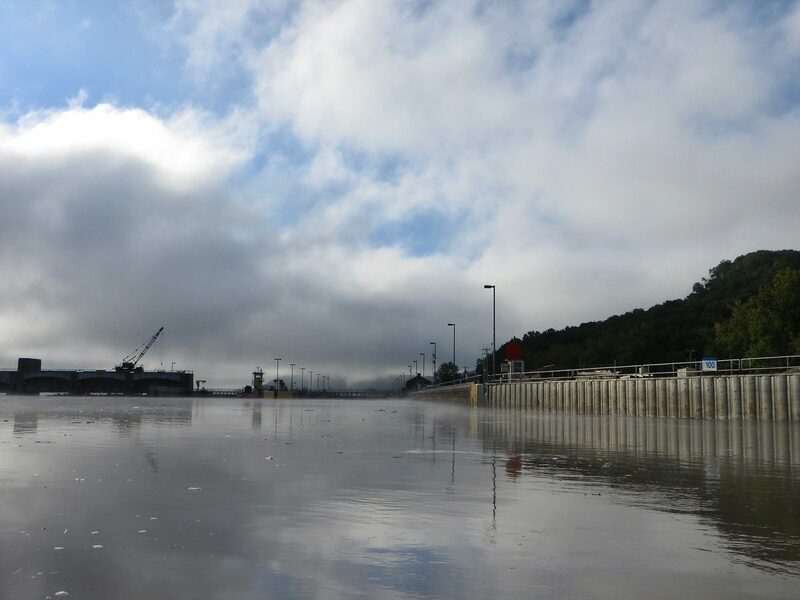 At normal water levels, we have been told, it is runnable by those who know the route, but should NOT be attempted by those who don’t, if for no other reason than that some of the concrete blocks that make up the dam have protruding rebar. There is, however, on river left, a very easy and very short portage around this barrier. The river was running very high when we were there, the Chain was mostly submerged and we just paddled over it without incident. 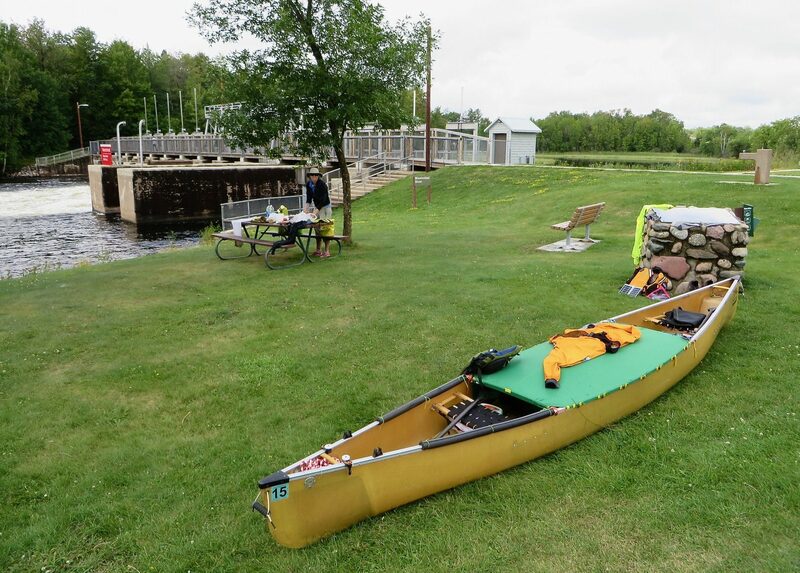 Even if you must portage, we believe that you will be much better off doing so than transiting Lock 27. We generally enjoyed using the locks. It added variety to the trip and often we were the only boat in these huge structures, which was really cool. The staffs were great and it felt like we were really participating in the way the river works. 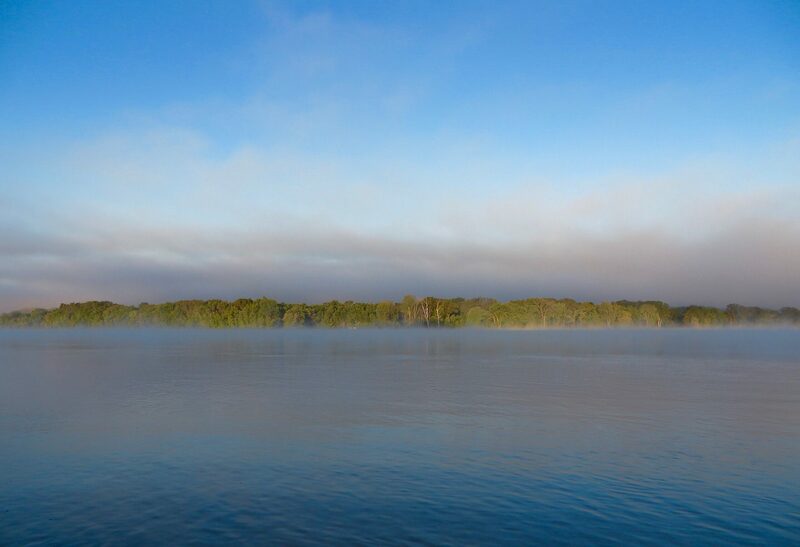 South of Minneapolis, the main channel is marked with buoys. 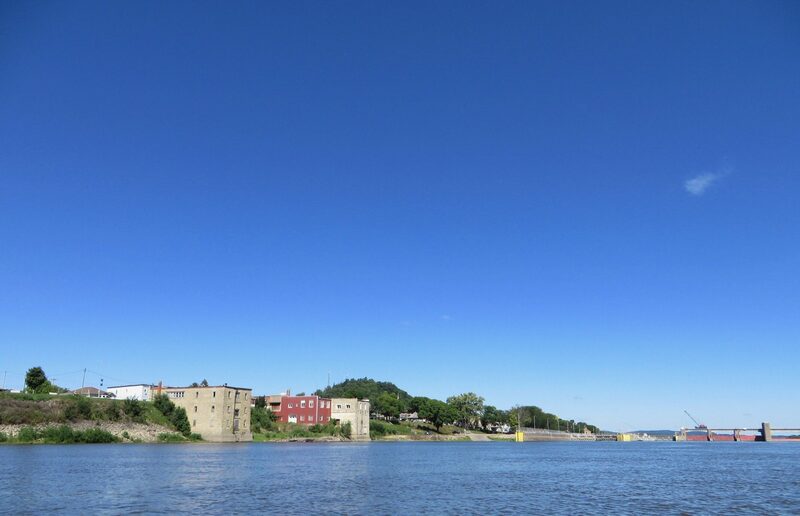 Looking downstream, the river right side of the channel is marked with green flat-topped buoys called “cans” and the river left side of the channel is marked with red conical topped buoys called “nuns”. These can be very useful because the tows are going to stay in the channel and the buoys identify it. 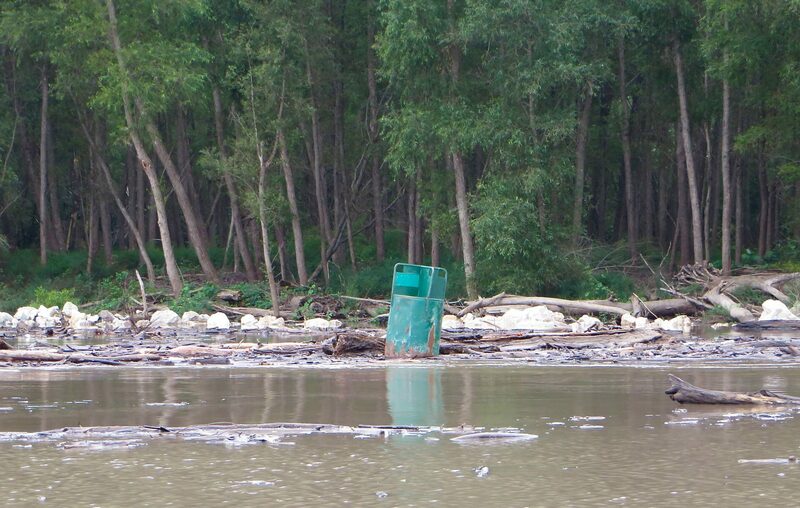 However, when the river floods, as it did during our trip, it uproots many of the buoys and drops them where it pleases. Usually this is on the riverbanks, where we saw large numbers of stranded nuns and cans. However, sometimes the river just shuffles the buoys around so they now mark what is definitely not the channel. The tows know where the channel is anyway, but the paddler probably doesn’t. We have no idea how long it takes the Coast Guard to replace and realign errant buoys after a flood. Be cautious about assuming that all of the buoys are in the right places. In high water, buoys can also “rabbit”. The current forces them underwater and they disappear for varying periods of time, only to unexpectedly pop back up to the surface. Bouys weight about 800 pounds, and getting hit by a rabbiting buoy is dangerous. We were actually nicked by one; fortunately, it just grazed our canoe as a direct hit might have been disastrous. 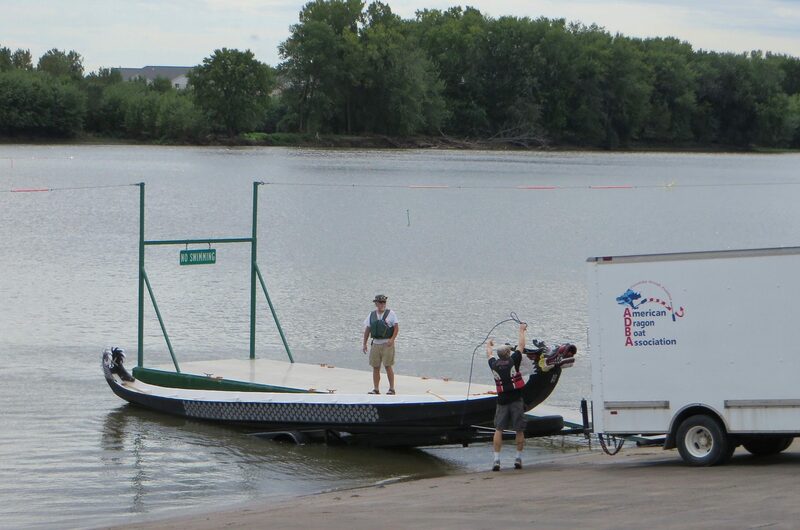 From Minneapolis on to the Gulf, tows are a fact of life on the river. 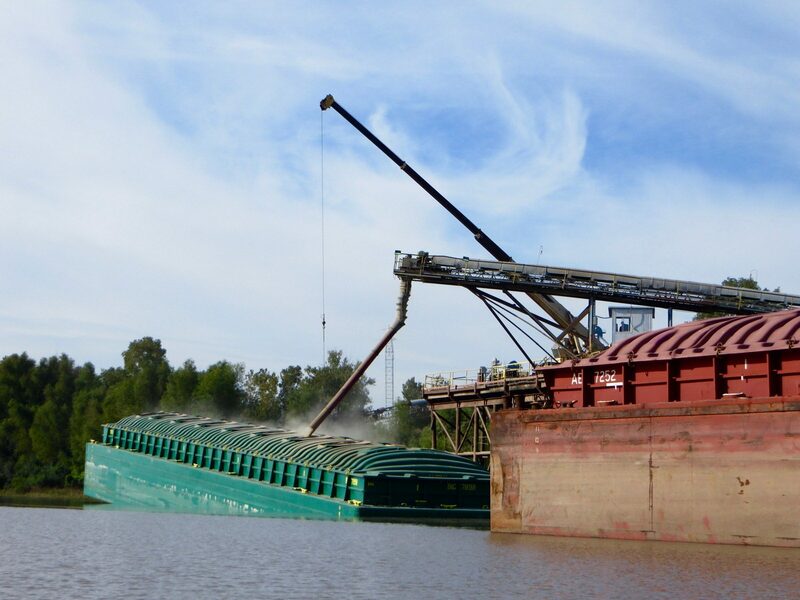 A tow is an array of cargo barges lashed together with cables and pushed by a specialized ship called a towboat, tugboat or pushboat. 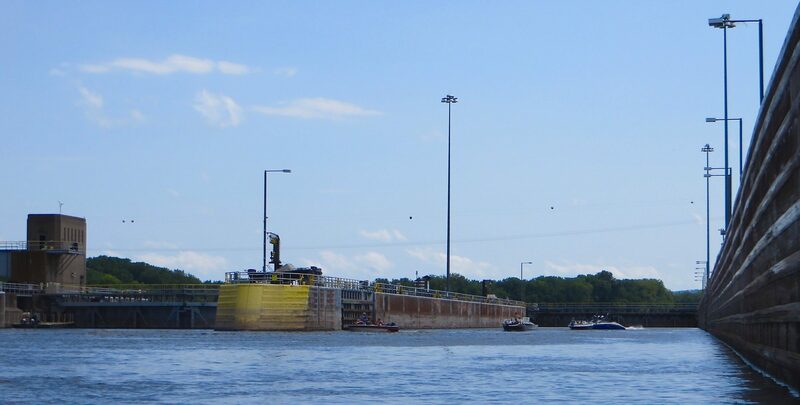 Between Minneapolis and St. Louis, where they must transit locks, tow arrays get no larger than 3 barges wide by 5 barges long (3 x 5). On the lower river, we passed tows that were 6 x 7 arrays. We have read of even larger arrays. 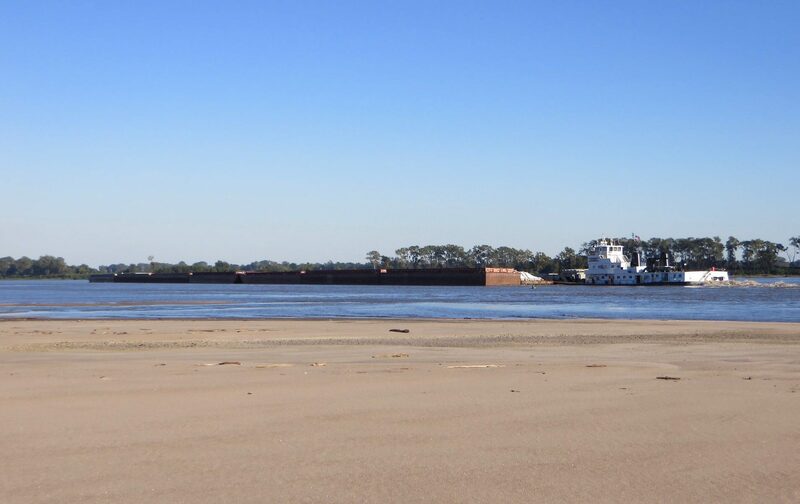 Since a standard barge is 35 feet wide by 195 feet long, a 6 x 7 tow is 210 feet wide and almost 1,400 feet long, not including the towboat. A typical fully loaded barge can displace 1500 tons, thus a 6 x 7 tow could displace 63,000 tons, which is greater than the World War 2 battleship Missouri did. 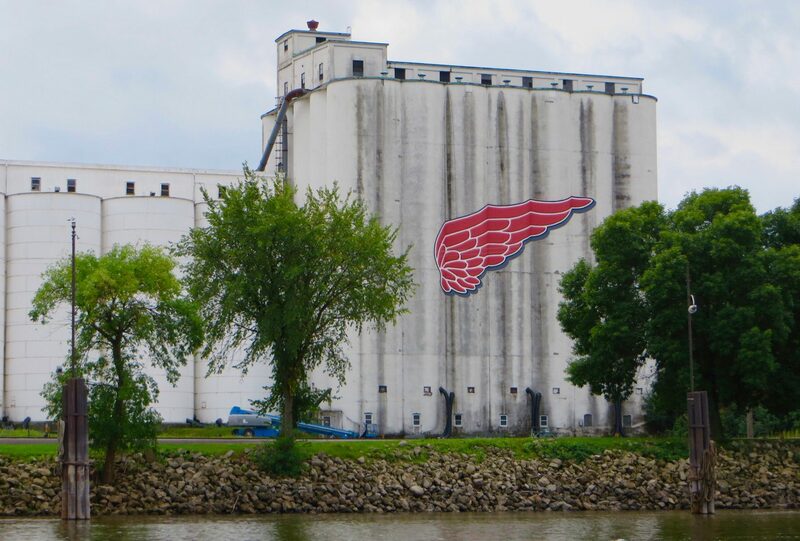 These things are big and you and your tiny boat share the river with them. In our opinion, John McPhee’s Uncommon Carriers is required reading for anybody paddling the river; it provides an articulate and thorough description of tows and how they work. Tows are intimidating but actually not too difficult to live with. First, they are slow; 11 mph is about the maximum speed traveling downriver and they are much slower going up. Second, at normal water levels, tows stay in the channel. Tow movements are generally extremely predictable as it takes a long time for them to make a turn; they do not dart around on the river. If you carry a marine radio, you can listen in on the pilot’s conversations. When one tow needs to pass another, either in opposite or in the same direction, much discussion ensues about who passes whom where and how. Often a tow will slow down or stop to let a faster one pass, as there are limited places on the river where passing is even possible. If you have a radio, you can inform the tows that you are in the area. Use channel 13 and know your position before you go on the air. 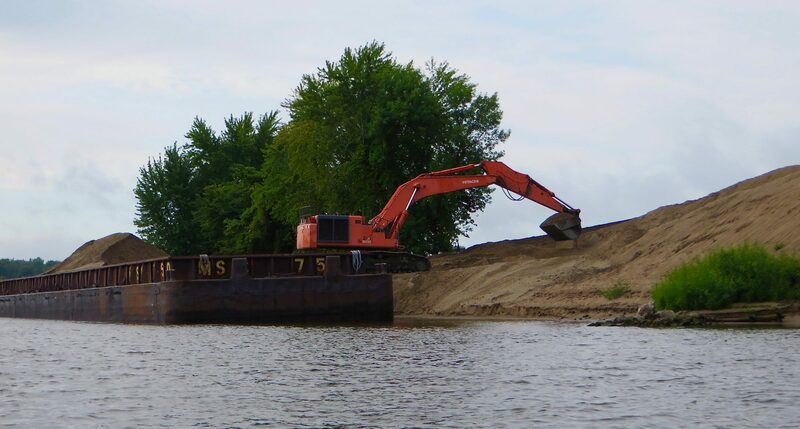 Sharing the river with tows requires you to be aware of a few things. Most importantly: do not get in their way, and do not paddle in conditions where you might capsize in the navigation channel. 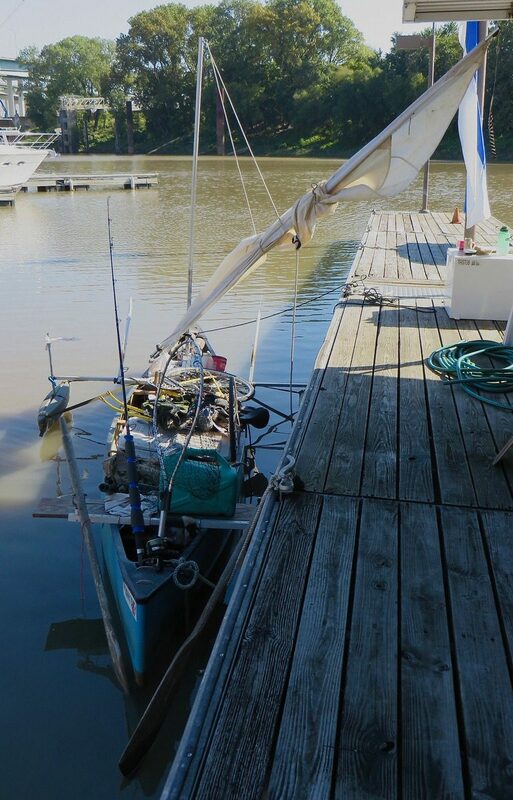 Capsizing near a tow is well described in this report. Tows cannot possibly maneuver or stop quickly and the pilot probably cannot see you anyway. If they run you over, they most likely will not even be aware of it. Cross the river in places with long views both upstream and downstream to ensure that there are no tows approaching. If you behave appropriately, you will not get run over. Tows create wakes as they pass. 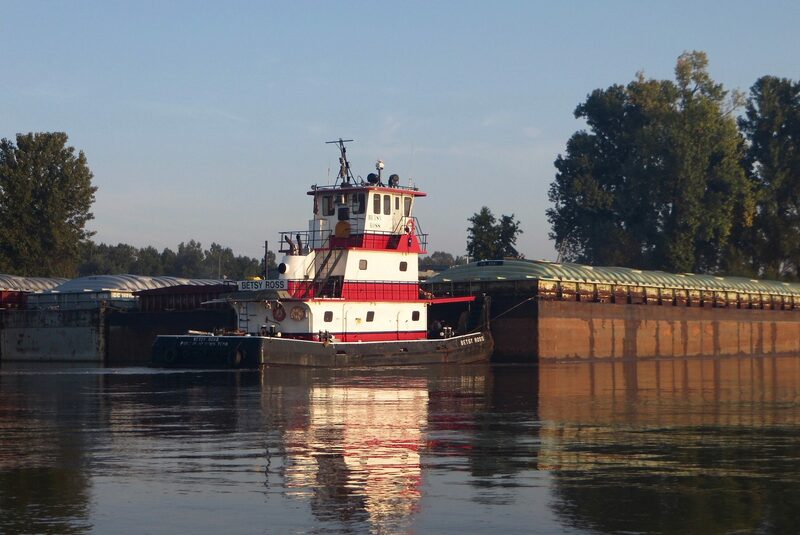 The first wake comes off the front corners of the leading barges and is usually not very big or turbulent. There will then be a hiatus before the wake from the screws of the towboat arrives. These wakes can be large and very turbulent, particularly from tows going upriver pushing against the current. 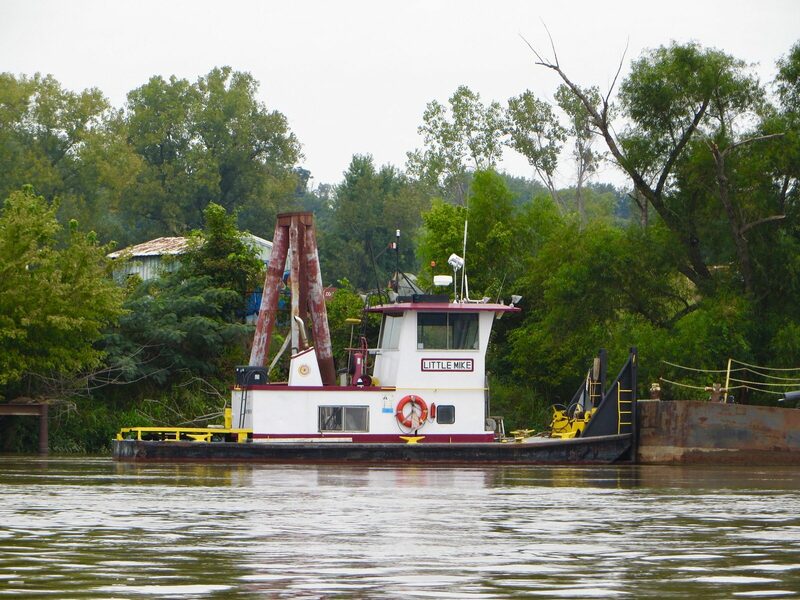 Keep in mind that a large towboat has three screws and 11,000 horsepower turning them. Finally, the wakes and turbulence will reflect off of the riverbanks and create random chop, particularly where the banks are steep and have been armored with rocks. We found two things helped a lot in dealing with wakes. 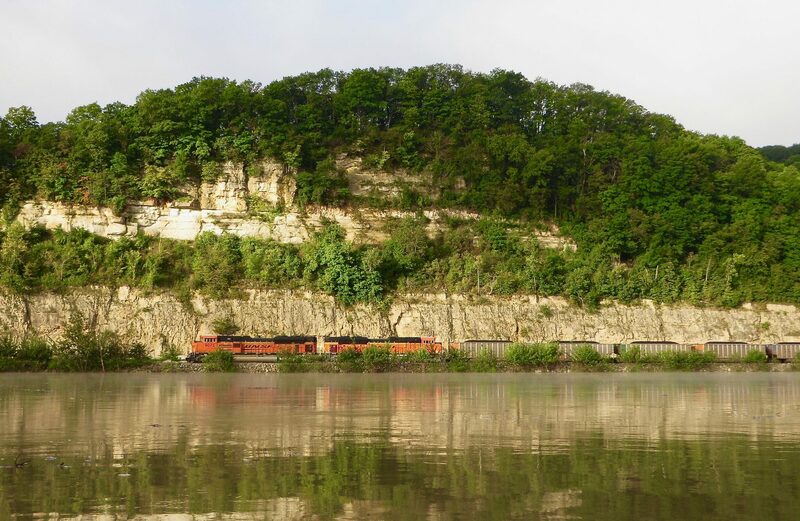 First, it is best to pass tows on the inside of a bend in the river as it is likely to be shallower, less steep, much less likely to be armored, and the current is slower. The tows will be close to the outside of a bend as that is where the channel will be. On the inside bend you will be further away, the screw wake will be directed away from you, and there will be much less reflective turbulence. This strategy requires crossing and recrossing the river as it snakes its way south, but we found it made life much easier to avoid the tow wakes. If you can’t get away from a closely passing tow, you can find shelter by paddling into a shoreline eddy, the larger the better. 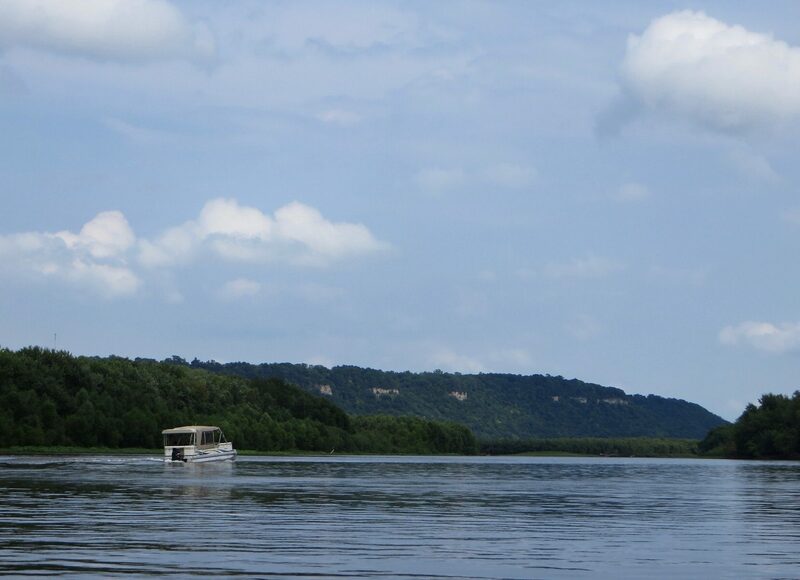 The eddy line, the point in the river where upstream and downstream currents pass each other, will absorb almost all the wake turbulence from a passing tow and in the eddy you will experience very little to no turbulence. Fortunately, eddies are common along the riverbank, so if you see a tow coming and you are on the outside bend, you will usually be able to find one prior to the arrival of tow’s wake. Sometimes, however, we were exposed directly to tow wakes at relatively close range; scary, but we were always able to ride them out without issue. So, pay attention, stay out of their way, respect them, and you should not have any problems with tows. 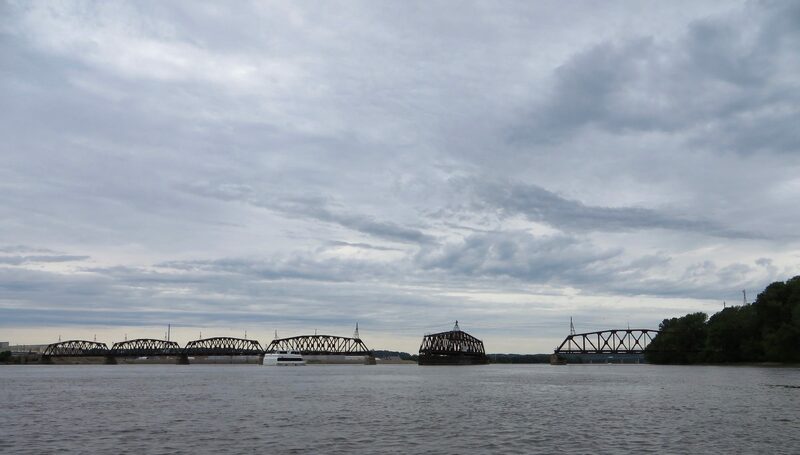 Because tows can only pass each other in certain sections of the river, they often wait for periods so they are in the right place relative to the other tows, and they may stack up. We would often go for a couple hours seeing no tows, and then have five or six pass in an hour. Our most congested area had nine tows in 90 minutes. When there are tows holding position while a string of oncoming tows passes, the combination of all their wakes bouncing off the riverbank can get fairly intense. 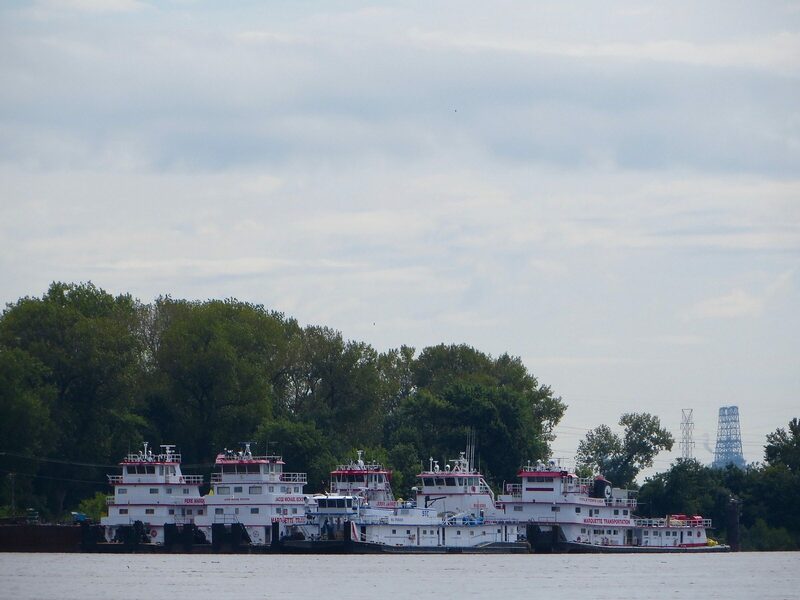 There are also smaller towboats operating around docks. 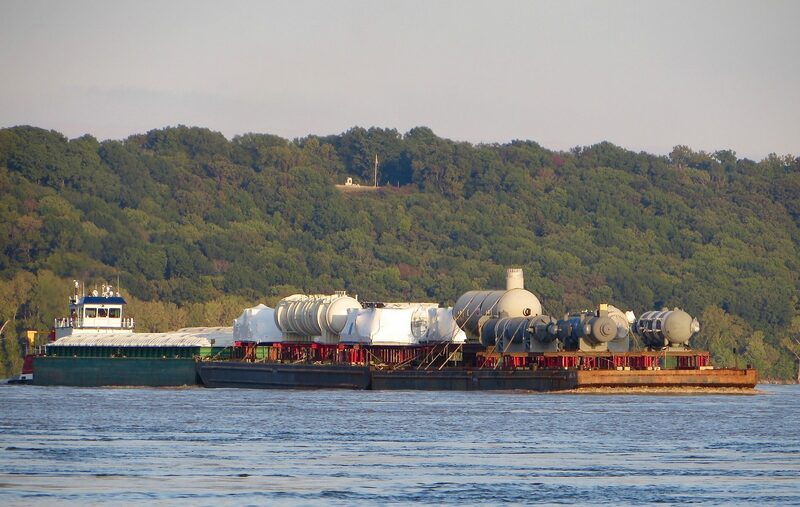 These are used to construct tows and move individual barges from here to there. Their movements are less predictable than the large tows, but the pilots have reasonably good visibility of the river. On several occasions, the pilots obviously saw us coming and waited for us the clear the area before proceeding with their duties. Many recreational river users between Bemidji and St. Louis are weekend warriors with powerboats or jet skis. The powerboats are often equipped with huge engines and sometimes drunk captains. Anti-social and rude behavior on the river is unfortunately frequent among this group of boaters: generating huge wakes, unnecessarily close encounters, and occasionally deliberate harassment was not uncommon. 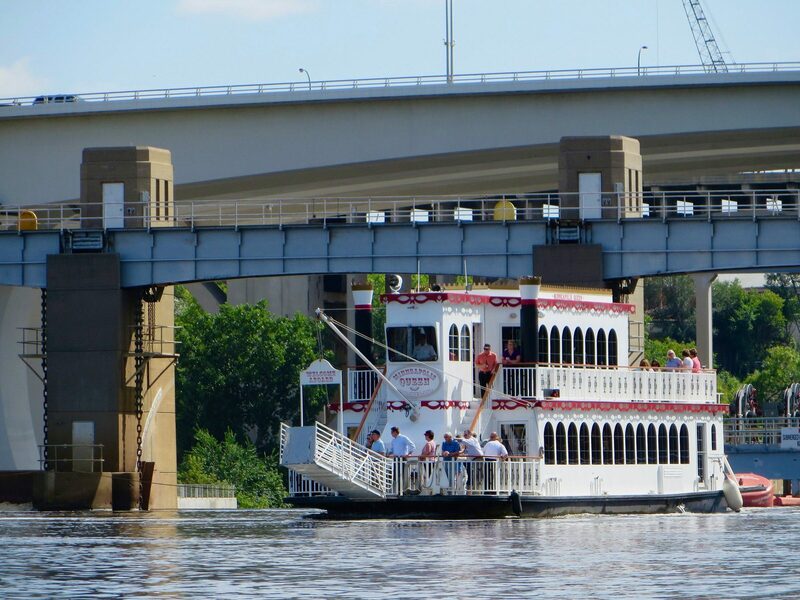 Note that this only occurred on weekends, especially holiday weekends, when the river could be crowded with boaters. We never had problems on weekdays, or with the local fisherman who would slow down when near us so that we wouldn’t have trouble with their wakes. If traveling in this section during a holiday weekend taking a couple days off is not a bad idea. We spoke with more than a few local river residents who commented about the weekend boaters in very negative terms. They often told us that they never use the river on weekends due to the morons and their behavior. Although we were told that there are special police river patrols to mitigate bad and dangerous behavior, we never saw evidence of it. We were extremely fortunate with the weather on our trip and experienced weather-related delays only a few times. You should not count on this and should not be surprised if bad weather prevents progress for periods of time. At the extreme ends of the paddling season, April or November, you might encounter ice in the water. Otherwise, the biggest weather problem is mostly related to wind as its speed and direction can make or break a paddling day. We experienced head winds far more often than tail winds. We don’t know if this is typical and/or related to the time of year we were on the river. Most of the time these winds were annoying and frustrating, but did not keep us off of the water. For any particular wind speed, the topography of the river can change what it does to you. 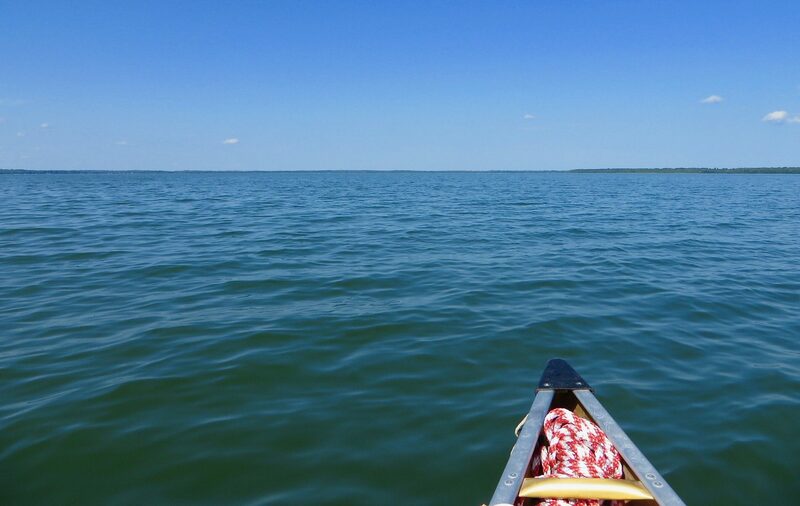 If you are paddling into a long stretch of unobstructed water, waves will have a chance to build and can be much larger than those created by the same wind blowing up a short reach. So sometimes a 10 mph wind isn’t an issue and at a different location might keep you on shore. 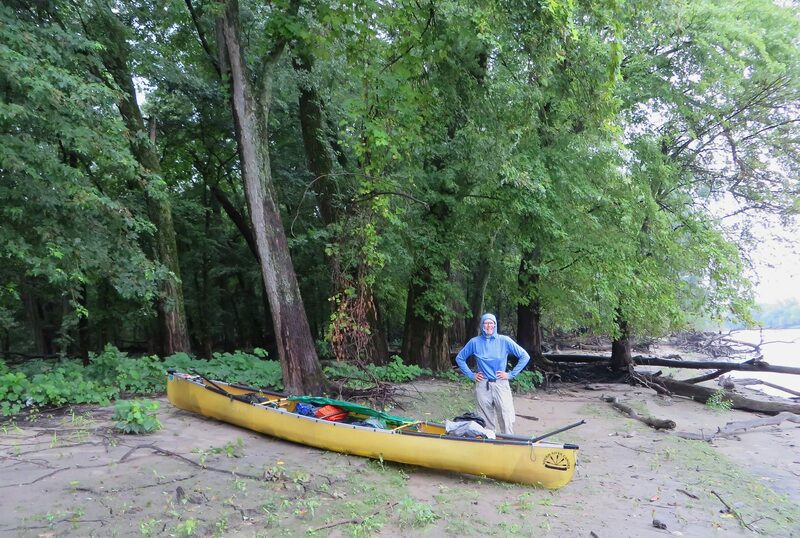 Sometimes the best solution for traveling on a windy day is to paddle immediately next the bank of the river. If you are lucky, the bank and its trees will provide shelter from the worst of the wind. Even if not, the waves will usually be much smaller and should you swamp or capsize, you won’t be far from shore. The second significant weather related problem is lightning. If a thunderstorm is imminent, get off of the water as fast as possible and seek shelter. If there are only woods on shore, pull your boat out of the water, tie it up and get deep into the trees. Remember that thunderstorms are often accompanied by localized high winds so be sure to secure your gear well or the river might take it away. 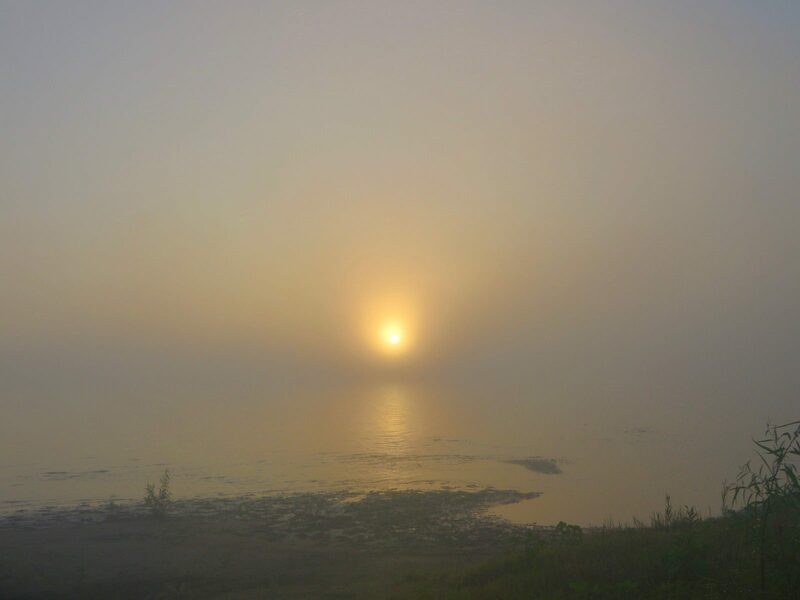 The final weather issue that can keep you onshore is dense fog that can make it impossible to see other river traffic. 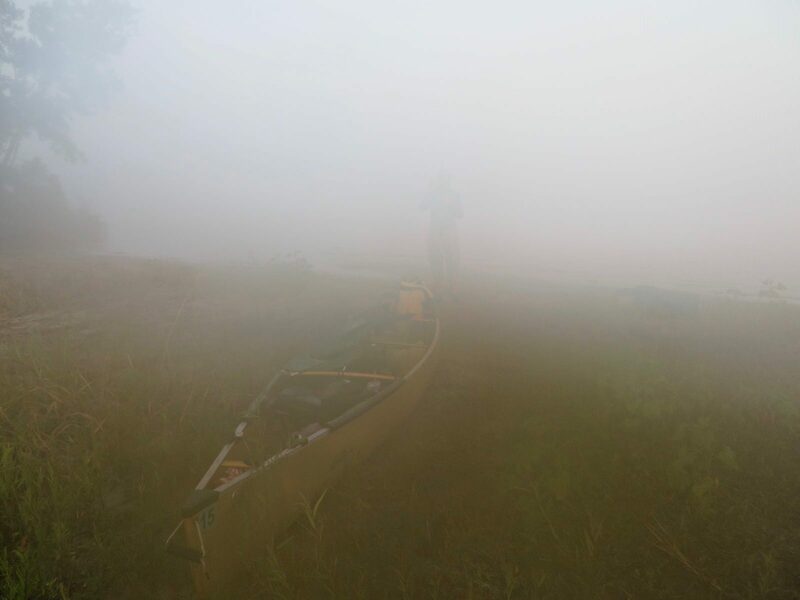 We did not experience fog of this intensity, but we read trip reports that described fog so thick paddlers could not see 100 feet in any direction. 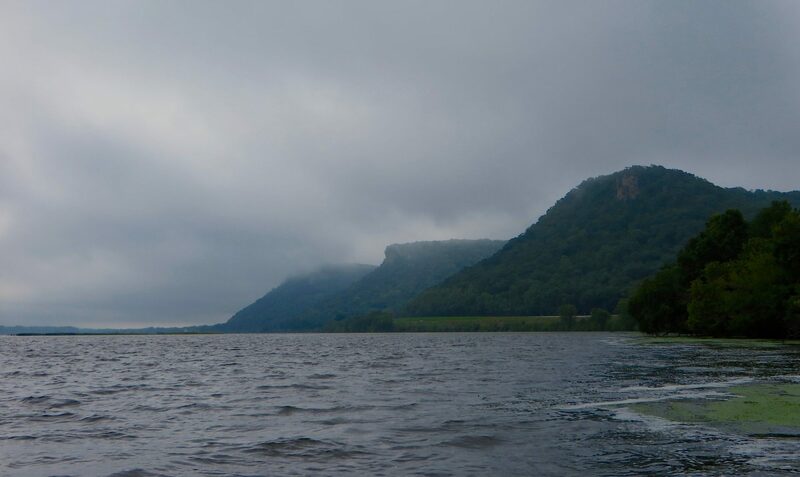 Tows can be surprisingly quiet, so in dense fog it is better to stay out of the channel. Other weather issues that can arise include rain of varying intensities, tornados, heat, high humidity, and cold. In other words, just like the weather anywhere else. 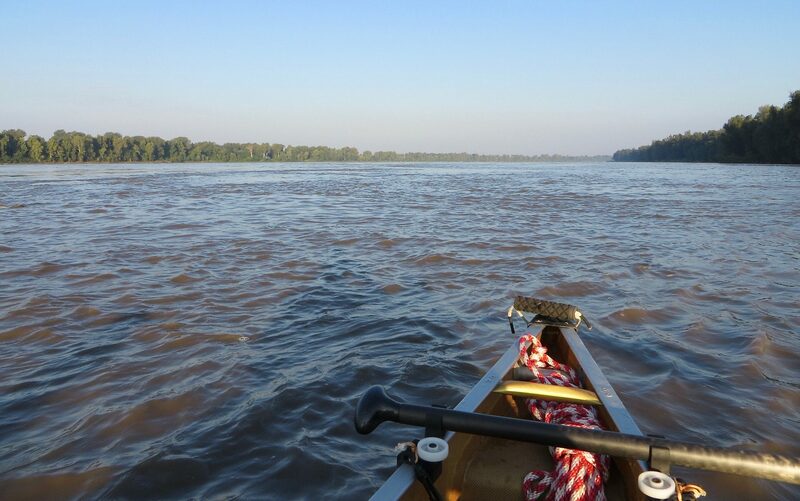 In addition to the standard water-safety guidelines such as always wear a PFD, and not paddling while drunk, there are several additional safety factors that one ought to consider when paddling the Mississippi. 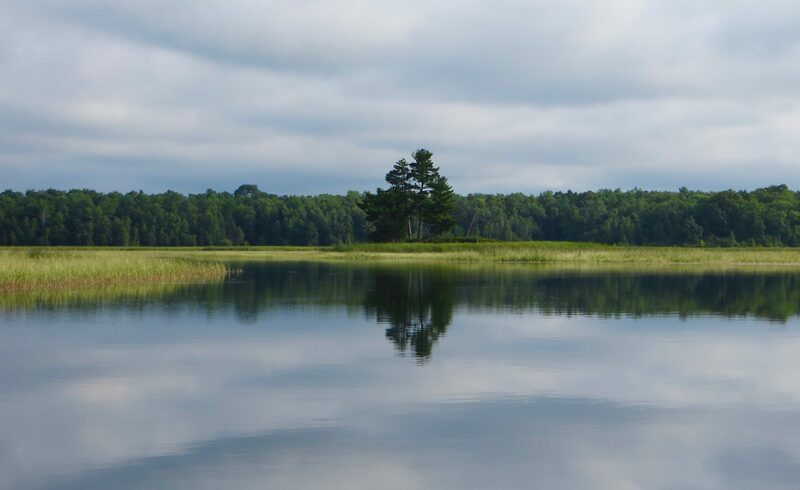 There are three large lakes in the Headwaters section: Bemidji, Cass, and Winnibigoshish. Although the lakes may appear to be calm, experienced paddlers recommend NOT taking straight-line routes across these. Very strong and dangerous winds can arise suddenly and produce large waves that have capsized and drowned other paddlers. Prudence strongly suggests following the longer route around the shorelines of these lakes. Capsizing into cold water is very hazardous. Since capsizing is not a planned activity, those paddling in cold-water conditions might seriously consider wearing a wet or dry suit. Cold water hypothermia has fast onset and is frequently fatal. Flood stage flow can be hazardous, as described by RiverGator.org. There is faster river flow, more debris in the water, submerged obstacles, and rabbiting buoys. One has the option of staying off the river when it’s flooding. Wind can create waves that may capsize a boat. One has the option of staying off the water in these conditions. 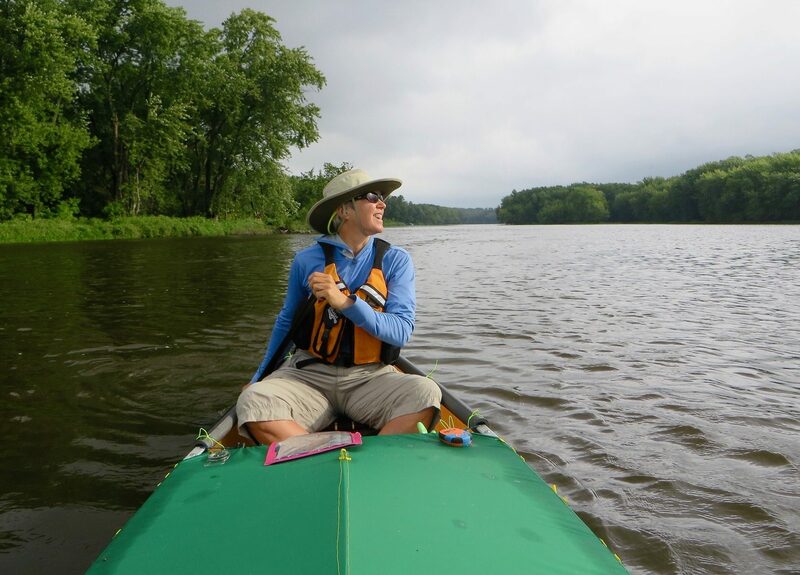 As RiverGator says, this river should be likened to paddling on the Great Lakes: when the wind is calm it’s easy, but when it’s blowing it is a different beast. 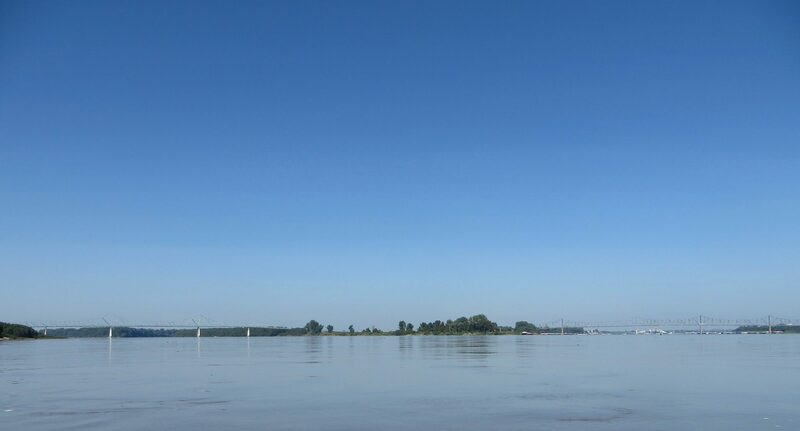 This video was taken on the Missouri River, but there are big expanses of water on the Mississippi River that can have similar conditions. Boat traffic can kill you if you don’t take it seriously. Other than those factors, paddling the river is usually quite straightforward and there was nothing else that caused us significant concern. RiverGator also has a useful section about river safety. One issue that all river travelers must face is security of their person and their goods. At a personal level, we never felt threatened in any way by anyone we met. There might be unsafe locations along the river, particularly in settled areas. As always, be aware of your surroundings and if things do not feel right, leave. Security for your boat and equipment is another matter. Here we experienced a problem for which we never found a completely satisfactory solution. We had read stories before we left of river paddlers who have had gear or worse yet, their boats, stolen. 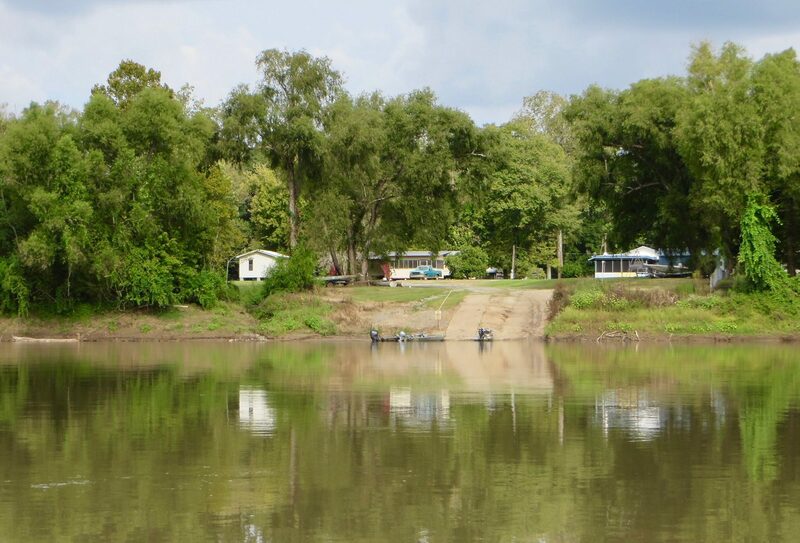 In three towns, In Saint Cloud, New Madrid, and Caruthersville, we heard from locals that a river traveler’s canoe or kayak had been stolen in the area in recent years. In 2014 we know of at least three paddlers who had some gear stolen. We elected to always leave one of us with our gear unless we were absolutely sure we had a safe place for the boat such as a staffed marina, campground, somebody’s yard, or at a ramp where locals were present and willing to watch the boat while we were away. 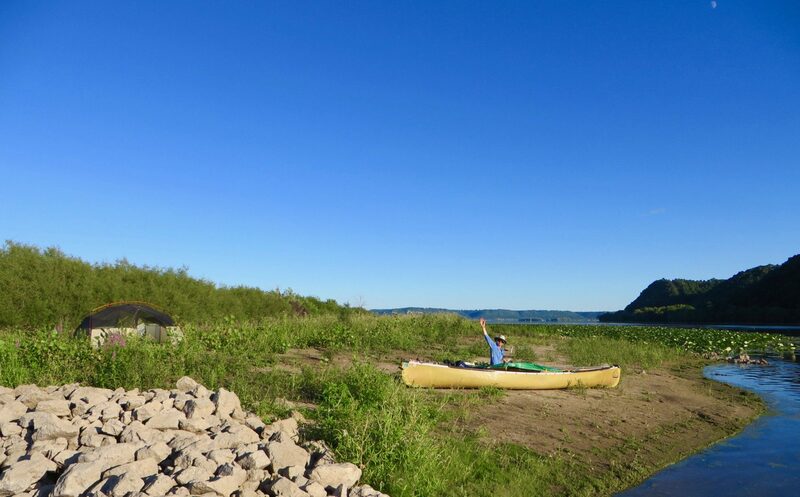 Solo paddlers often hide and lock boats in the brush, away from public boat ramps and other places people are likely to be. Our approach limited what we could do on shore. We did not take off together to visit stores, restaurants, parks, museums and so forth unless the boat was, in our belief, truly secure. In many places this meant only one of could leave the boat. Paranoid yes, but the risk of losing the boat and thus the trip outweighed the obvious disadvantages of our solution. For us, this was probably to most significant downside of the trip and we wish we could offer a better solution. 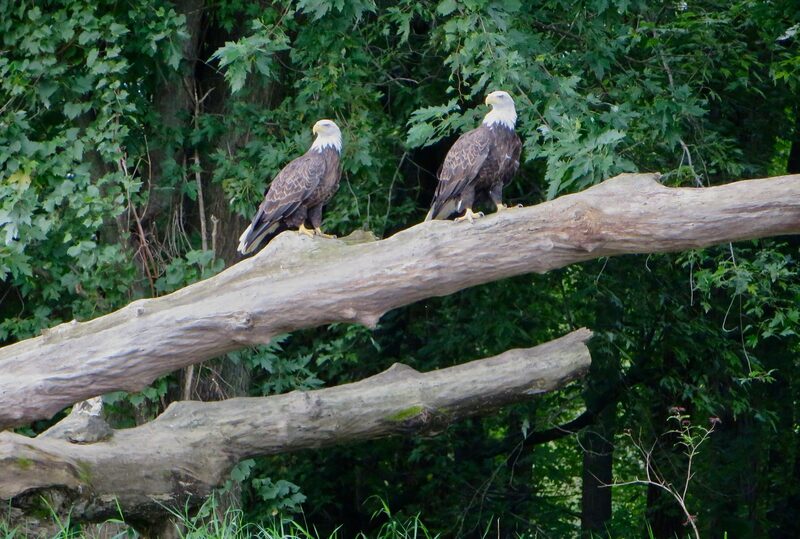 We enjoy watching birds and had hoped to see a lot of species during our trip. However, we found birding from a moving canoe was difficult. We were usually too far from shore to find small birds and if we did, could not identify them before we were carried downstream by the current. 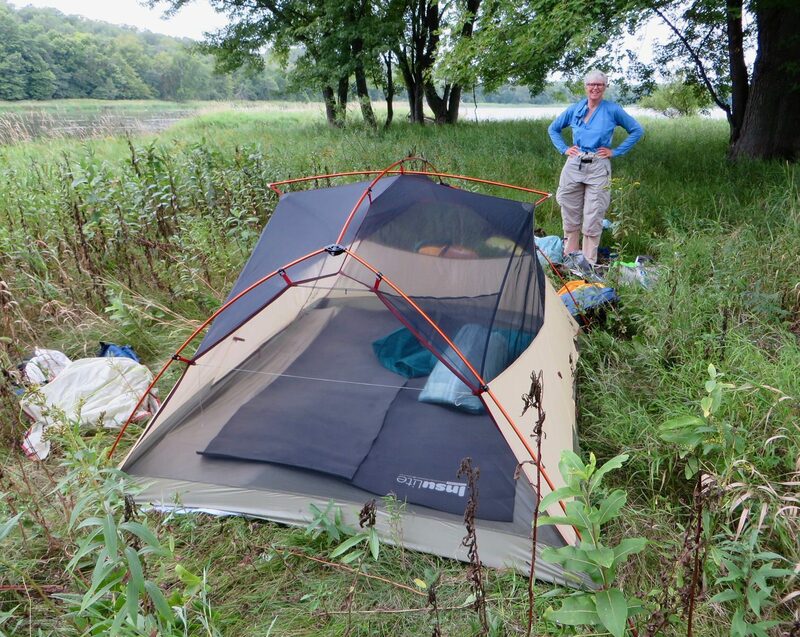 Mosquitoes often made birding near campsites difficult. We did see many Bald Eagles, Belted Kingfishers, Canada Geese, Spotted Sandpipers, White Pelicans, egrets, herons and migrating swallows. We frequently heard woodpeckers and occasionally saw Pileated Woodpeckers flying across the river. Our most exceptional sighting was of a pure albino Barn Swallow foraging over the water. We saw many deer in the Headwaters section. People have seen Black Bear along the river, but we did not. We saw a few River Otters cavorting in the Headwaters section of the river. Along the lower Atchafalaya, we saw dozens of American Alligators, both on the banks and in the water. They never bothered us. We experienced mosquitoes on shore at some point on every single day of the trip. Generally they were less of a problem during the day, but after sunset they sometimes became intolerable and drove us into our tent. We never had problems while on the water although other paddlers have reported being attacked by biting flies while paddling. 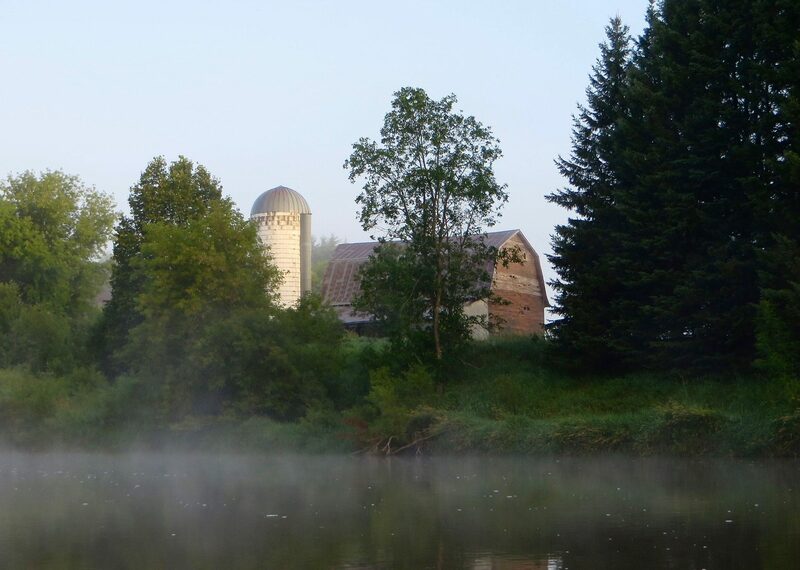 Mosquitoes, wood ticks, and biting flies are reported to be very problematic May through July, especially in the Headwaters section, and by paddling in August and September we believe we avoided the worst of it. 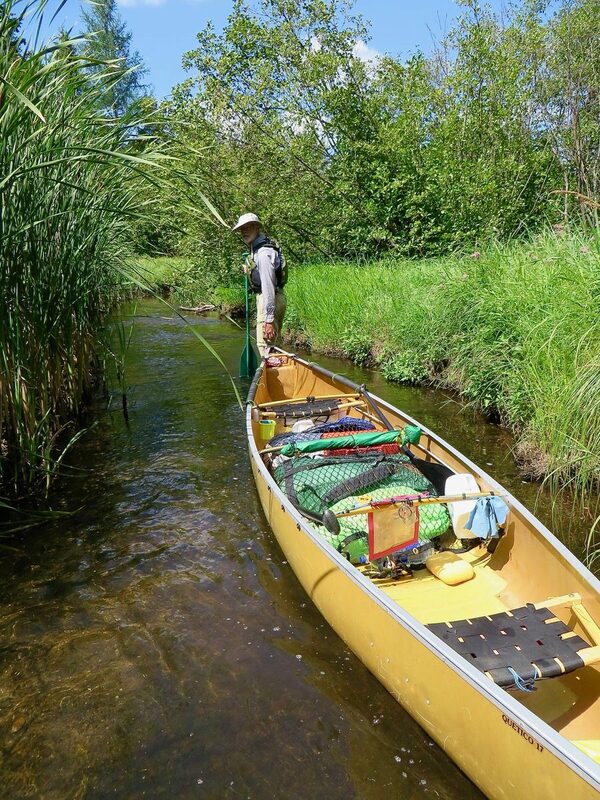 At earlier times of the year many paddlers carry and use headnets to reduce insect problems. 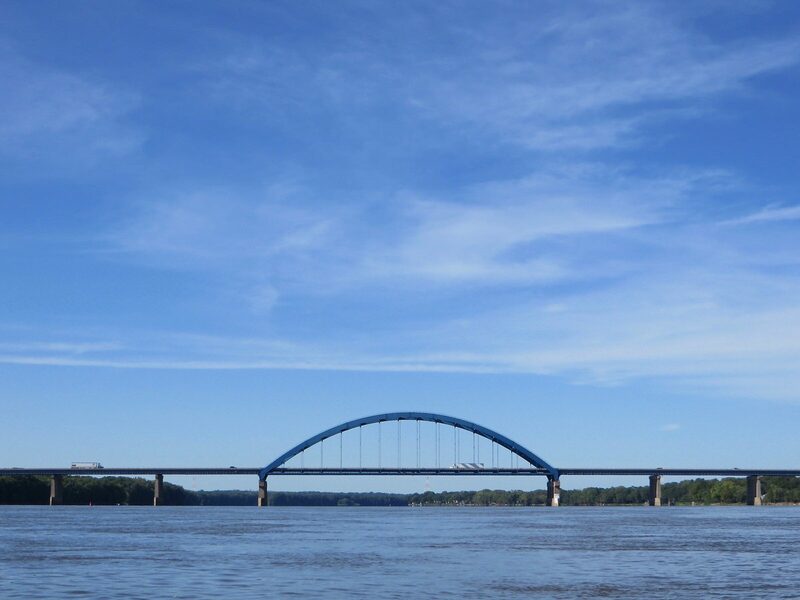 Finally, jumping Asian Carp were an unexpected problem. These large invasive fish are found everywhere south of Minneapolis. They have the nasty habit of unexpectedly leaping out of the water right next to your boat. While we were never hit, many other people have been and some actually injured. 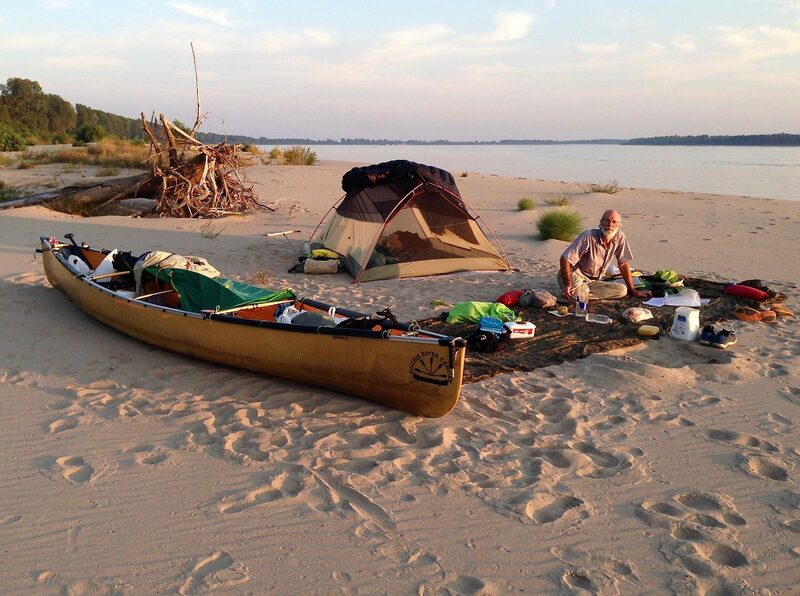 We met only four other individuals or couples on long distance paddling trips of one kind or another. We heard about other paddlers from people on shore and found websites for a couple of them. We passed at least one group but never saw them; the river is big and people stop at different times and places. 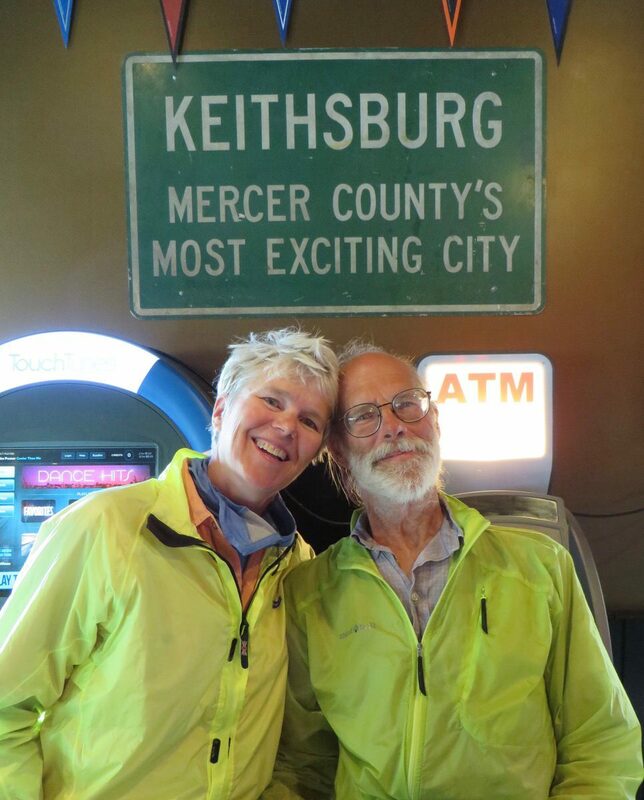 Reading other traveler’s blogs, we have learned that people do run into each other on occasion and sometimes elect to paddle together for periods of time. We found one of the best parts of the trip was meeting people along the river. Almost everyone we ran into was enthusiastic, friendly and interested in what we were doing. Many immediately offered us help: food, showers, places to stay, transportation to stores and so forth. Their spontaneous generosity was both unexpected and greatly appreciated. Long-distance hikers call these people “Trail Angels”; we called them “River Angels”. In reading other paddler’s trip reports and blogs, we found that our experiences were not unique. 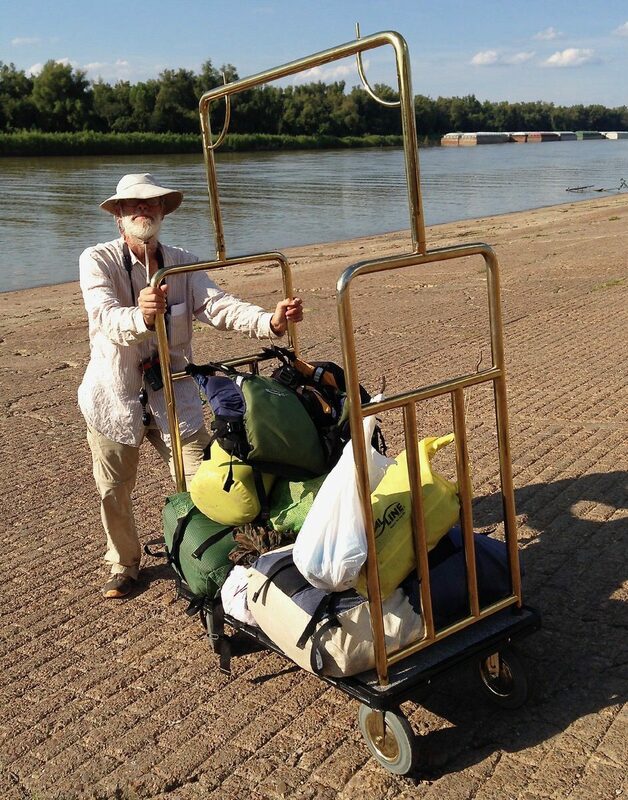 Although most of our assistance was serendipitous, we learned late in our trip that by posting help requests on either the Mississippi River Paddlers or Lower Mississippi River Paddlers Facebook groups, you may also get offers of assistance from people who live along the river. As an example, we met a woman on our first day as we portaged from Lake Itasca across the little rock stepping-stones into the shallow start of the river. She offered to give us a place to stay when we reached Brainerd, which would be over a week in the future. 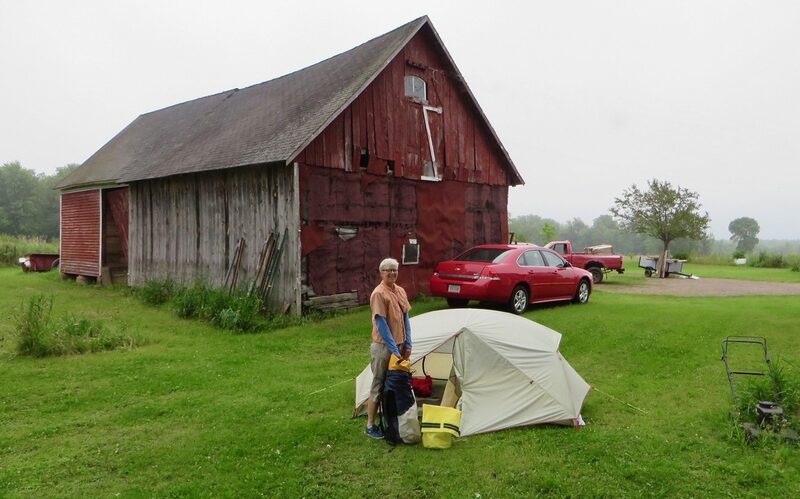 She met us at her daughter’s house on the river where we stored the canoe. She then drove us all over the place for supplies and a meal and then took us to her house for showers and a bed. The next morning, we borrowed a drill from her son-in-law to make a small modification to our boat and mentioned we were going to add some pads to the rear gunwales. 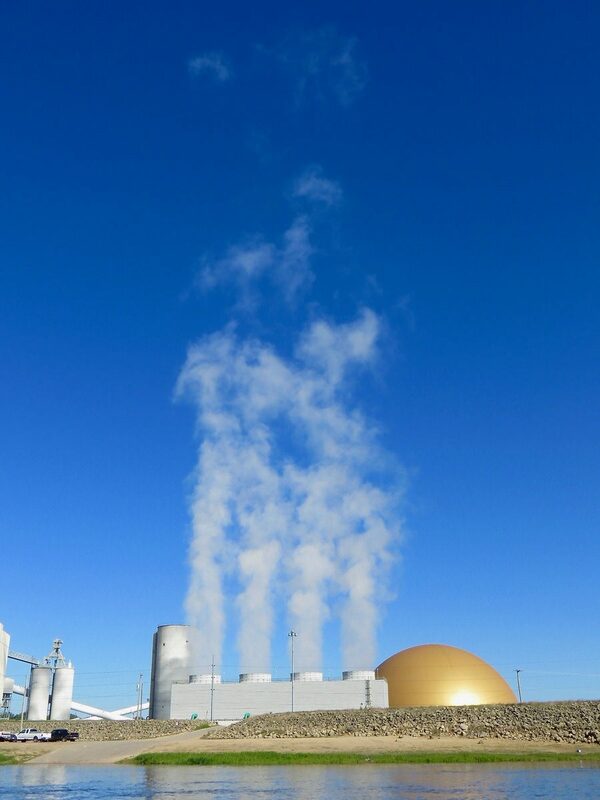 We would buy the pads in a town somewhere downstream. Lo and behold, after we had paddled off and portaged the Brainerd dam, there was our friend waiting downstream beside the river with the parts we needed. One form of assistance that was incredibly helpful was offers of rides to grocery stores. As discussed in the Resupply section, in many river towns the grocery stores are located some distance from take-outs. Getting rides to stores meant not spending hours walking to and from the store and also meant we could buy a lot more food since we didn’t have to hand carry it from the store back to the water. We greatly appreciated those rides. Residents let us sleep in their yards or in their guest rooms. 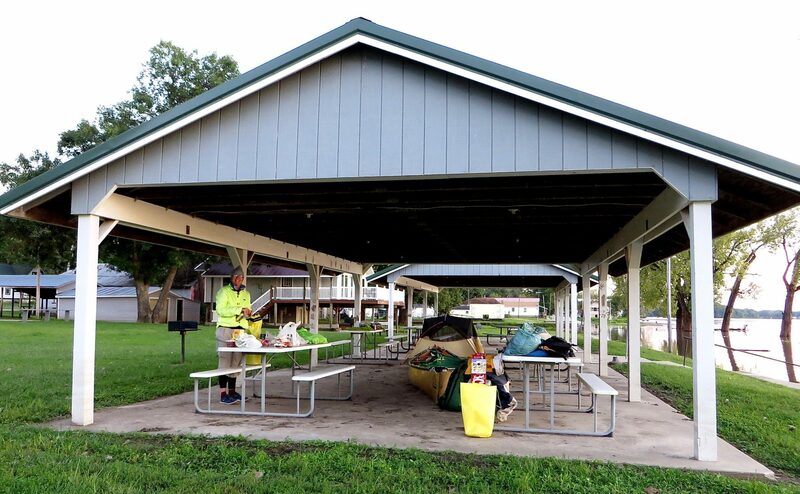 Campground hosts let us stay free in their campgrounds and use the picnic shelters to set up out of the rain. Cafés refused payment for meals. People invited us to picnics. 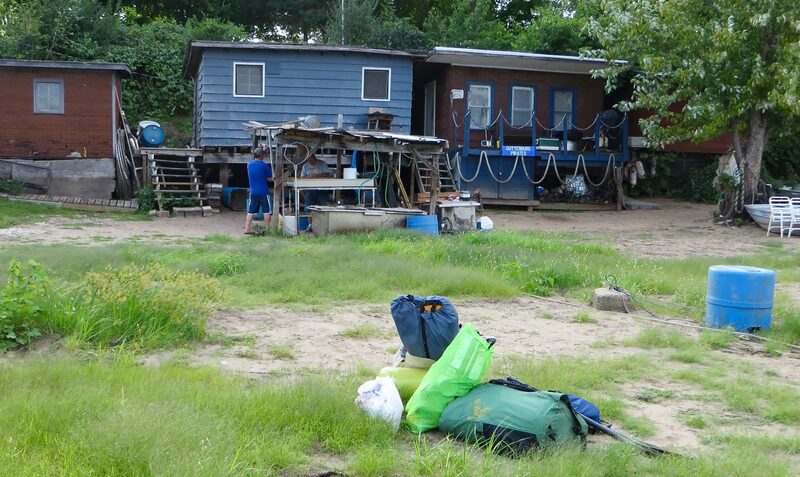 A bartender drove us to a distant laundromat and the laundromat owner drove us back to the river. Many dozens of people provided us with great conversation, good cheer, and encouraging words. Day after day we encountered this outpouring of generosity. Our experience was humbling and gave us a renewed belief in the innate goodness of so many people. Wow! So much great information here and great photos too. Thanks for sharing. I would love to read some comments that you might have for your photos of this trip. Sometimes I wondered just exactly what I was looking at. Great photos though, and I enjoyed looking at them all. This could have been a book! I am in the very early stages of planning my own source to sea MR trip. The information you have shared here is really helpful. 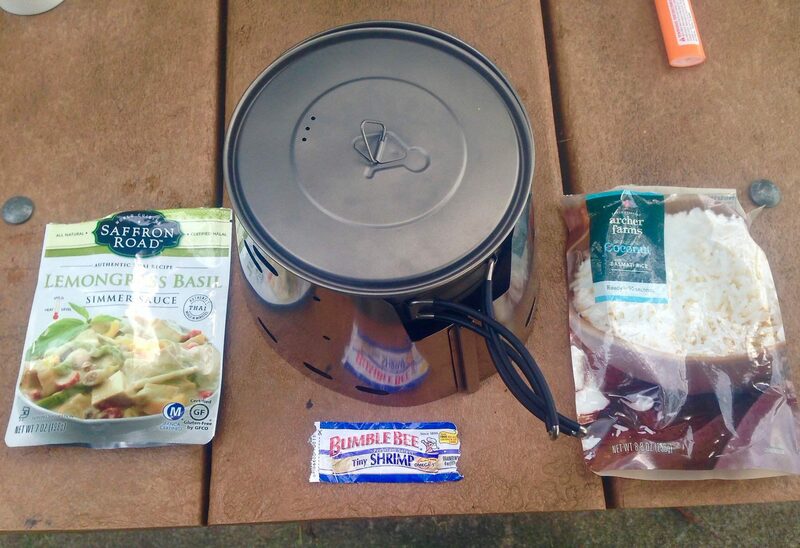 I am going to explore going without a stove and using a quilt instead of a sleeping bag. Thanks for helping me along on my journey. Happy travels! 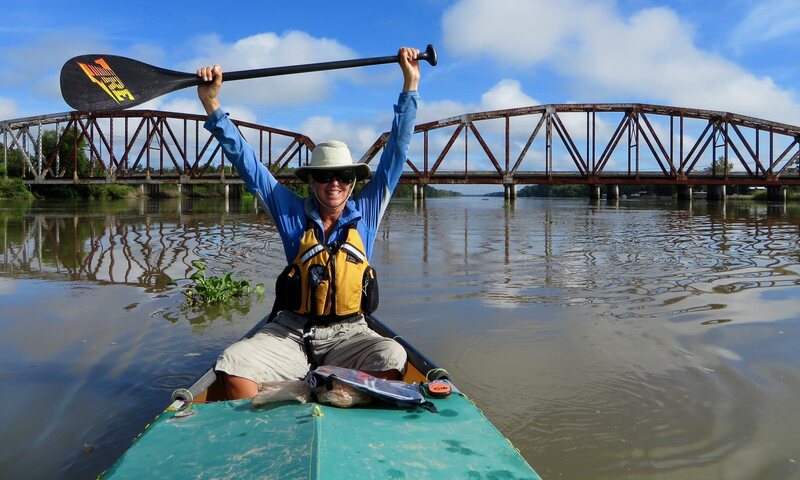 Congratulations on your decision to paddle the Mighty River. You won’t be disappointed! Ah, about the captions… When we built the site 18 months ago we considered adding captions to the photos but decided it would take too long. We still have a backlog of about ten articles that we intend to write but can’t find the time. If we ever get caught up maybe we’ll go back and start adding captions. I am envious of your travels. Please keep sharing your experiences and insights. “Doing Miles” represents the very best of what the Internet can be. You are making a difference. Thanks again! I’m just writing to acknowledge all the great work on your site. Planning to do the trip starting in August of 2019 by solo canoe. Looking forward to the adventure. All the best in your travels. Mark from Whitby, Ontario, Canada. 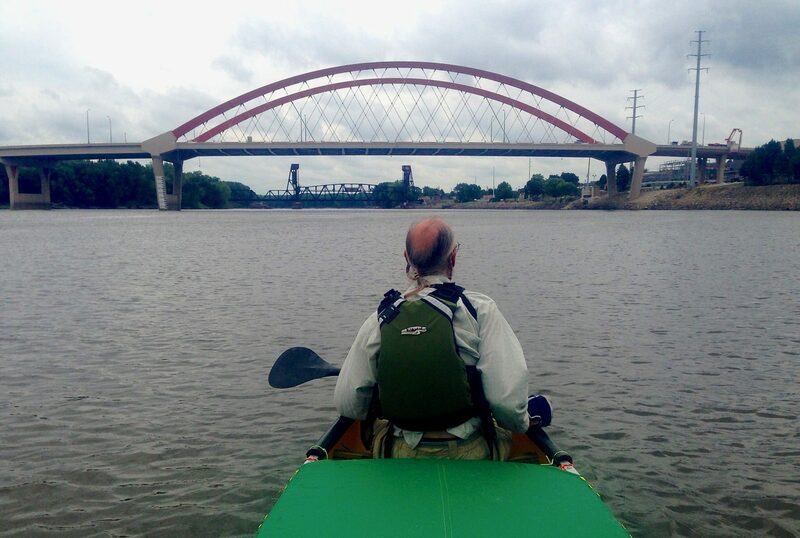 Have followed several others journeys on the river via Mississippi River Paddlers FB page. Have begun planning a MR multi year source to sea series of trips. Info you shared here is really helpful for learning things I don’t know and pointing us to good resources. Thank you for taking the time to put it together. Good luck with your trip! We’re glad our information is useful.